This glossary covers all of the specialized terminology used within this website, as well as many terms not used on this site but which may be encountered elsewhere. Some of the terminology is collector based, some is technical glassmaking jargon, some is a mixture of both, and some is of unknown origin. All pertain to and are useful for a full understanding of historic bottles. Where alternative words/phases describe the same concept, it is noted - like Bore and Orifice. When directly quoted, the source of the definition or information is noted; otherwise the references are not typically noted. This is particularly true if the definition is directly from John R. White's 1978 work on bottle nomenclature published in Historical Archaeology, since this journal article is widely accepted and referenced by historic archaeologists. (Not every term from his list is repeated on this list; only those deemed pertinent). The terminology and definitions here are a composite of information derived from an assortment of references, the most important of which include: McKearin (1941), Scholes (1941), Howard (1950), Scholes (1952), Tooley (1953), Lief (1965), Kendrick (1963, 1968), Toulouse (1969a), Munsey (1970), Switzer (1974), Ketchum (1975), McKearin and Wilson (1978), White (1978), Berge (1980), Wilson (1981), Miller & Sullivan (1981), Jones (1986), Creswick (1987), Fike (1987 & 1998), Jones & Sullivan (1989), Sives (1992), Whitehouse (1993), Wilson (1994), Van den Bossche (2001), Kaiser (2009). Many other references were variably consulted also. See the References page for more information. Before the moving into the main part of the Glossary, it is useful to have a quick overview of the basic physical features - or morphology - of a typical bottle. A somewhat stylized, "typical" bottle is illustrated on the following page: General Bottle Morphology. Most of the "parts" of a bottle are easier to visualize than describe. Bottle physical characteristic definitions are included on the General Bottle Morphology page as well as below in green below. Click on the pictures to enlarge and on the hyperlinks - where available - for more information and/or a picture or illustration elsewhere within this website. Names in bold italics are specifically covered elsewhere on this page if a user is unsure about the meaning or definition. ABM - A commonly used acronym for Automatic Bottle Machine. The term is a short hand reference to a machine-made bottle as compared to a mouth-blown BIMAL (blown in mold, applied lip) bottle. Air venting (aka "mold air venting") - Small vent holes in a bottle mold which release pressure and gases from the mold while the bottle is being blown or expanded. 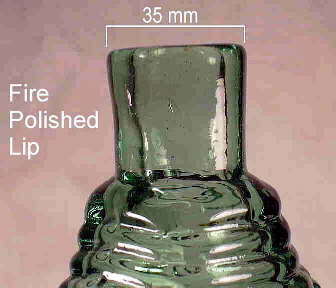 Vent holes usually leave small glass "dots" or bumps on the body and sometimes the base of the finished bottle which are typically slightly smaller than a pin-head in size. Vented molds tended to produce bottles with sharper embossing than those made in molds without venting. See the Bottle Body Characteristics & Mold Seams page for more information on air venting. Anneal (annealing/annealed) - The gradual reheating (sometimes) and cooling of hot glass to room temperature in an oven or lehr (annealing oven or leer) to relieve the stresses in the glass and make the bottle stable and less prone to breakage. Applied color label (ACL) - A method of labeling, lettering, or decorating a bottle by applying a mixture of borosilicate glass and mineral or organic pigments (and other substances) with a low melting point to a bottle through a metal screen and then baking it in a furnace to form what can appear to be a "painted label." In later years (mid-1950s), a thermoplastic wax medium was used and resulted in more versatility and durability. Also referred to as applied color lettering, pyroglazing, pyro, enameling, baked enamel labeling, fire-fused, silk screening, painting, painted, and printing. 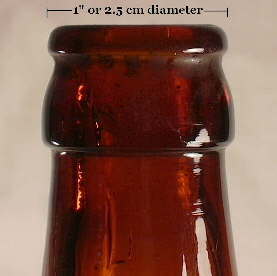 This style of marking bottles was most commonly found on soda, milk, and some beer bottles made from 1933 (possibly as early as 1931) up until today, e.g., Corona™ beer bottles (Giarde 1989; Sweeney et al. 2002; Tutton 2003; Hoenig pers. comm. 2/2019). 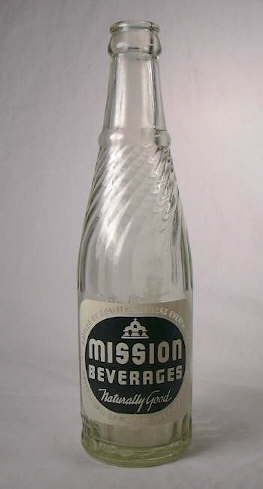 An example of a 1946 Mission Beverages soda bottle with an ACL is pictured to the left. Applied Finish or Lip on an 1876-1886 (Wilson & Wilson 1968) Jesse Moore Bourbon cylinder fifth (San Francisco, CA.) exhibiting some of the typical excess glass flow just below the lower collar. Applied finish (or lip) - Also called a "true" applied finish or lip. Applied finishes are a category of finishes where the glass for the finish was "applied" in a separate process after the bottle was severed (wetted or cracked-off) from the blowpipe. (Click applying a string finish to view an illustration of the process of applying this glass.) 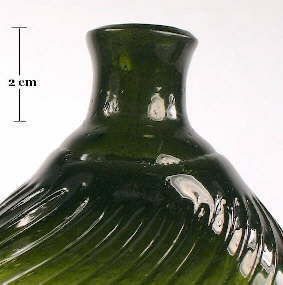 After the finishing glass was applied to the severed bottle neck - often with additional re-firing to keep the finish soft and workable - it was then "tooled" to form the desired shape and dimensions. Virtually all finishes had some tooling done on them to form desired shapes - even many sheared finishes. What differentiates the applied finish from the tooled finish is the separate application of glass to the neck end; this was not done in the process that produces the tooled finish discussed below. The process of "applying" a finish usually results in some amount of excess glass "dripping" down below the bottom edge of the finish, as shown in the picture to the right. See the applied finish section of the Bottle Finishes & Closures main page for more information. NOTE: The author of this website has prepared a summary of the mouth-blown bottle finishing methods section on the Bottle Finishes & Closures page which is available as a downloadable and printable (pdf) article entitled: "The Finishing Touch: A Primer on Mouth-blown Bottle Finishing Methods with an Emphasis on "Applied" vs. "Tooled" Finish Manufacturing." This copyrighted article by the websites author is pending publishing as part of a future Society for Historical Archaeology book on bottle and glass manufacturing but is being made available to users of this site as a free download. Automatic bottle machine (ABM) - Refers to a fully automated machine that produces bottles independent of human supplied labor, i.e., gathers the glass automatically from the furnace, uses mechanically air pressure to the blow the bottle to shape, and requires no hand finishing work to form or finish the lip. These bottles are also sometimes called Full-Automatic machine produced. The acronym "ABM" is used as a short hand reference for all machine-made bottles - those produced by the Owens Automatic Bottle Machine, other fully automated machines, most semi-automatic machines, and semi-automatic machines converted to fully automatic via a gob feeder. The acronym ABM apparently originated from the collectors literature in the early 1960s (Tibbitts 1964). Baffle mark (aka parison mark) - The seam left on the parison that marks the junction of the baffle plate and the blank mold on a machine-made bottle. 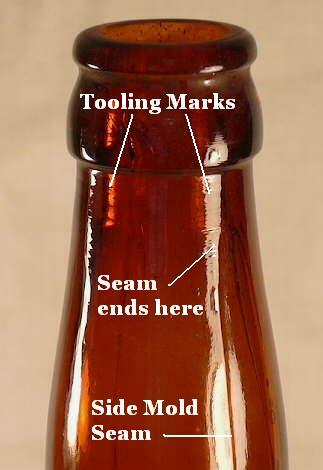 Tooley (1953:452) defined it as the "Mark or seam on the bottle resulting from a mold joint between the blank mold and baffle plate." This line is found on the completed bottle in the form of a circle (centered to quite off-centered) on the base which may also extend onto the bottle heel. Like a suction-scar (aka "cut-off scar"), but unlike a valve mark, the baffle mark is joined by ghost seams on two opposite sides (Schulz et al. 2016:523). A particularly bold or bottle integrity affecting baffle mark was considered a manufacturing defect in machine manufacturing and a reason for reworking or adjusting the blank mold/baffle plate interfaces (Ceramic Industry 1949:8). Baffle plate - The base plate of the blank or parison mold on a bottle making machine. The interface between the baffle plate and the rest of the parison mold often results in a circular, often off-center and incised baffle mark on machine-made bottle bases that somewhat resembles an Owens Automatic Bottle Machine induced suction scar (Tooley 1953; Schulz et al. 2016; empirical observations). See the Machine-made section of the Glassmaking & Glassmakers page for more information. Bail - That part of a toggle closure device which is connected to the lever wire and passes over the lid holding it in place on the bottle or jar. Also called a yoke (White 1978). A bail is easier to define with a picture than to describe. Click bail for a picture; the bail is the vertical metal portion which holds the stopper in place. Bakelite - An early - probably the first - thermosetting plastic which made its debut in 1927 as a screw cap closure material though was first patented in 1907 (Berge 1980). This is the first plastic used for bottle closures though was also widely used thousands of other items including phonograph records, billiard balls, telephone and radio cases, and much more. 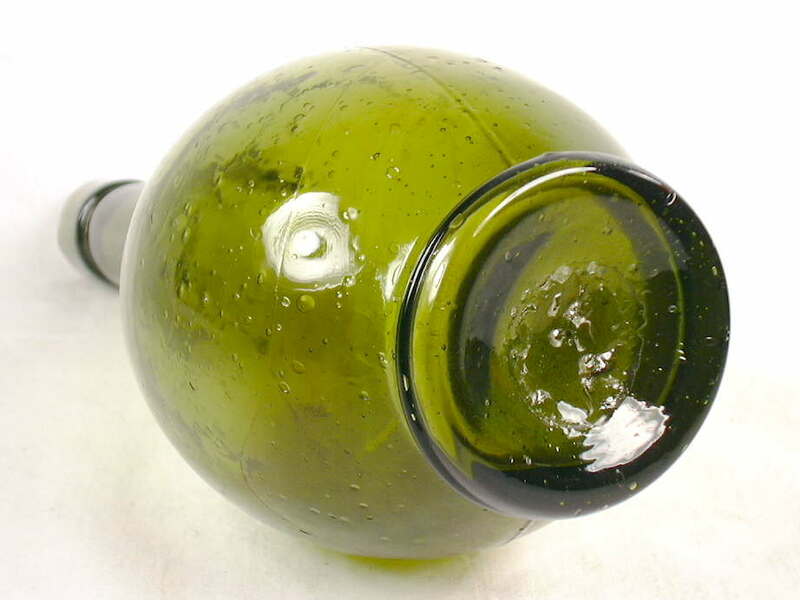 Ball neck - A bottle/glass maker term for a relatively narrow, horizontal ring on the neck of a bottle (Illinois Glass Co. 1906, 1920, 1926). It appears that this feature was purely decorative in nature. A ball neck is illustrated to the right on a 1875 to 1885 hair dye bottle which is described on the Household (non-food) Typology page. Ball necks are most often encountered on medicine, sauce, pickle and flavoring extract bottles but can be found on a wide array of other style types dating from the mid-19th to mid-20th centuries (and even today). Barber bottles - A class of decorative, often art glass quality bottles that were used by barber shops and individuals to hold various hair treatments and products. 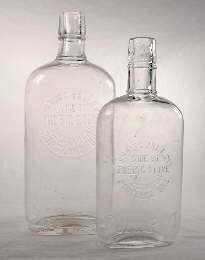 Barber bottles were intended to be refilled from other containers and reused indefinitely. They were produced from the mid-19th century to the 1920s (Ketchum 1975). The picture to the right is of a mouth-blown, turn-molded, blowpipe pontil scarred example from the late 19th to early 20th century. It has the original "sprinkler" type closure which is made of metal and cork. Bare iron pontil - see iron pontil below. Base - The bottom of the bottle; the surface upon which the bottle stands. Any measurements of the base on this website are of the greatest diameter (round) or greatest width and depth (non-round). 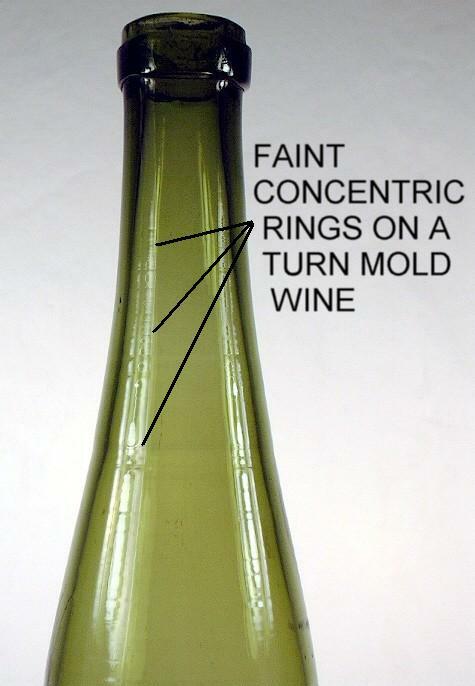 The "resting point" of the bottle is usually the extreme outside edge of the base. See General Bottle Morphology pop-up page. Also see the Bottle Bases page for a comprehensive overview on the subject. Base plate - Base forming portion of a bottle mold. See bottom plate. Batch - A mixture of raw glassmaking materials in the correct proportion ready for the melting pot. Battledore - A wooden paddle used to flatten portions of a bottle as it is being hand blown (Hunter 1950). Bead - A raised ridge of glass having a convex section which encircles the neck of a bottle. The term itself can be applied to any such circle or molding; also a modifier indicating its specific location, e.g., closure bead, collar bead (or beaded collar), etc. (White 1978). The term is also used to describe a raised ridge located between the screw-threads and shoulder on many 20th century fruit jars and which formed the sealing surface for the cap and rubber gasket. Bead is also a type of finish - click bead finish to view a description within the Finish Types & Styles pages. The upper closure accepting part of a crown cap finish is a bead. Beaded seal - A bottle that makes its seal or point of maximum contact on a beaded ridge which encircles the bottle neck. The ridge just below the screw threads and cap on a Ball® Perfect Mason fruit jar is a beaded seal. The rolled top portion of a crown top finish could also be considered a beaded seal (see crown top picture below). Beveled edge A term used in describing typically rectangular or square bottle shapes, this is a narrow flattened edge between two wider flat, perpendicular sides of a bottle. Click bottle bases for a picture that includes two bottles with beveled edges: the rectangular bottle in the middle and the square one to the right. BIMAL - Acronym for "Blown in Mold, Applied Lip." The term is a short hand reference for virtually any mouth-blown bottle, as versus ABM bottles (Automatic Bottle Machine). Bird swing - This is actually a glass makers term which refers to a bottle making flaw of a thread or bridge of glass on the inside of a bottle running from one side to another (Ceramic Industry 1949:21). This is a function of the hot glass sticking to itself during the parison expansion forming a bridge across the interior of the bottle as it expanded. Click close-up of a "bird swing" to view such inside of a small, ball neck hair dye bottle from the 1875 to 1885 period. 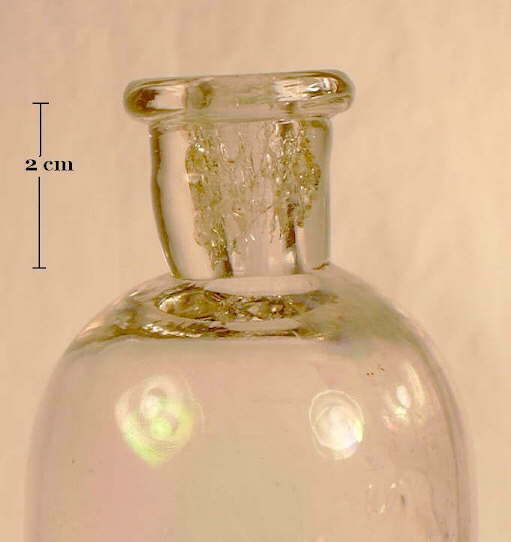 This particular example (entire bottle shown above next to Ball neck) actually formed a thin membrane or shelf of glass that adhered to three sides of the bottle - the two wide sides and one narrow side. Sometime after the glass cooled and hardened, much of the thin membrane broke (the right side of the flaw) leaving a relatively thick strand still remaining which bridges between the two wider bottle sides. In the authors experience, most bird swings are more a thick thread of glass spanning opposite sides, though they can vary a lot in detail. It is most commonly found in mouth-blown bottles but does rarely show up in machine-made bottles also (Ceramic Industry 1949:21). Black glass - The term used to describe very dark, typically thick olive amber or olive green (sometimes just amber) glass. Black glass usually must be held up to a bright light to see the true color. This color was most commonly used on pre-1800 up to the 1880s bottles used for spirits, beer, porter, ale and similar fermented beverages though still received some use well into the 20th century on ale and some soda bottles. See the Bottle/Glass Colors page. 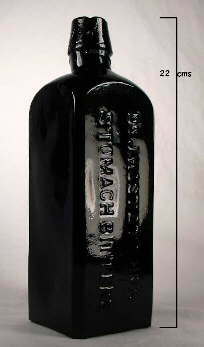 The Hostetter's Stomach Bitters bottle to the left is black glass and dates from about 1865 to 1870. Blank mold - See parison mold below. Blister - Glassmaker term for a large air bubble in the glass. See definition for bubbles below. Blob or Blob-top - The term for a relatively large class of one-part finish types that are rounded on the outside surface and "blob-like." This finish was commonly utilized from the mid 19th through early 20th centuries on bottles that held carbonated beverages like soda and beer. The blob finish formed a good anchor for wiring down the cork or stopper. The term is also used to describe certain styles of soda a beer bottles - i.e., "blob-top soda". For more information, click blob finish to view the description of this finish within the Bottle Finish Types & Styles pages. 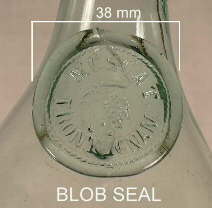 Blob seal - A typically round or oval pad or disk of glass usually found on the body or shoulder (rarely the neck or base) of a bottle which was impressed with a stamp while hot to form lettering or designs pertinent to the bottled product or, in earlier times (prior to the mid-19th century), the ownership of the bottle itself (Dumbrell 1983). Blob seals were created much like a stamp used to impress sealing wax on a letter or document. Also called a "prunt" (Jones & Sullivan 1986) or simply a "seal" these were most common on mid-17th through mid-19th century wine bottles, though used on a wide variety of other bottle types. Seals were used occasionally into the early 20th century (until at least the 1920s) on some very late mouth-blown bottles - typically of foreign manufacture (empirical observations). 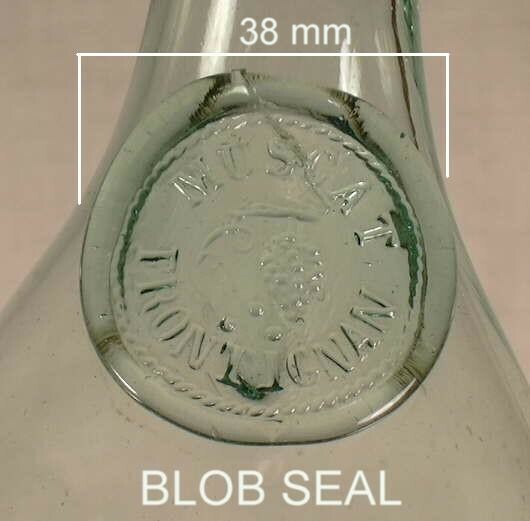 The picture to the right is of a blob seal on a mid-19th century European free-blown "Muscat" wine bottle. 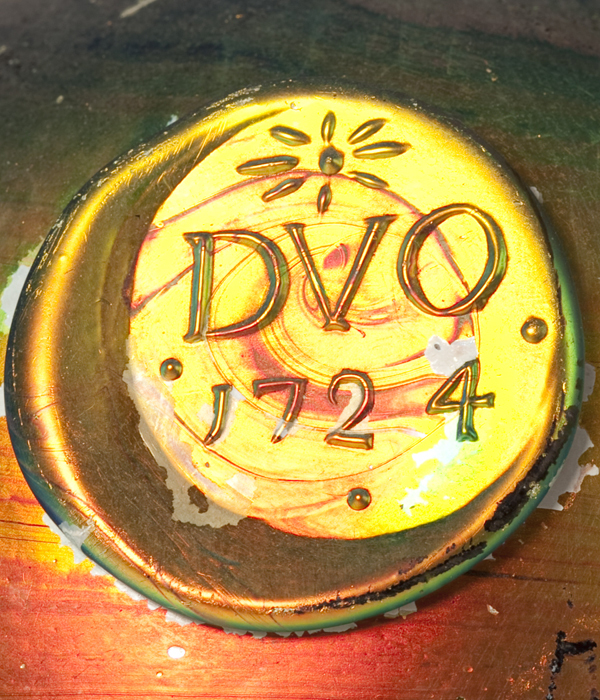 Click 1727 seal to see a close-up of a dated blob seal. The term "blob seal" likely has its origin in collector jargon. Block - A typically wooden (usually apple or cherry, but sometimes iron) form, hollowed out on one side for the bottle body and with a groove for the blowpipe, used in the process of hand blowing glass to give symmetrical form to a bottle; a process called "blocking." Bottles produced with a block are always round in cross-section and hard to differentiate from a purely free-blown bottle. The block was usually kept wet with water or oil to keep the wood from igniting, to facilitate smooth movement of the glass on the block surface (Kendrick 1968). The marver (flat surface) was used in a similar way as a block (hollowed out cavity) in the forming of a bottles shape without a mold or prior to the use of a mold. 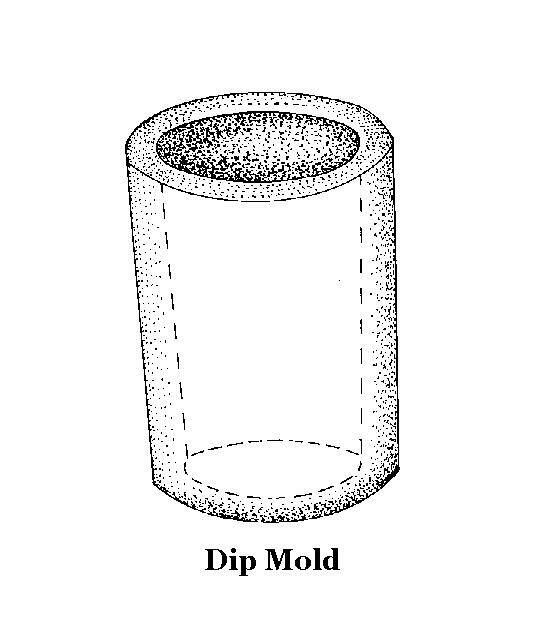 A dip mold could also be considered a type of block or block mold; see the dip mold discussion on the Bottle Bases page. Block mold - Alternative name for the parison mold on a press-and-blow machine which was largely a one piece "block" (Miller & Morin 2004). 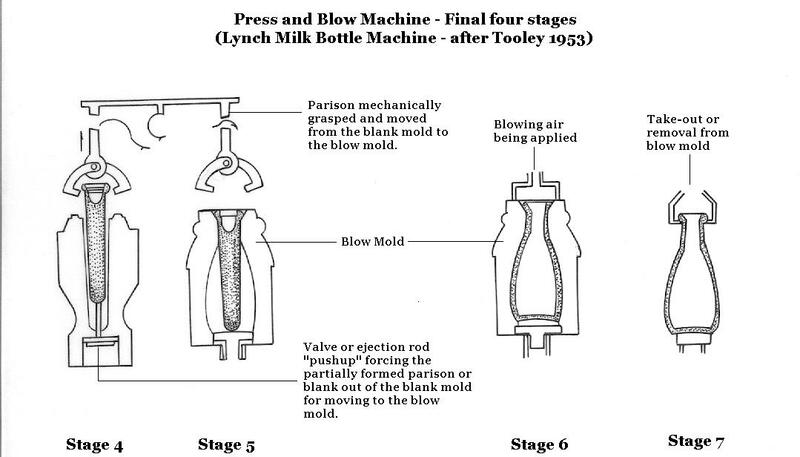 Blow-and-blow process - A machine-made bottle forming process where the parison is blown in both the parison mold and blow mold. The most common automated production process or cycle used for bottles, particularly those with narrow necks. Also see press-and-blow process. 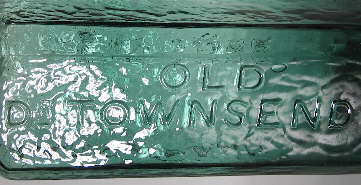 Blow mold - The mold within which the parison (slightly inflated gob of glass) is expanded into the final shape of a bottle. For mouth-blown bottles this is usually the only mold used. With semi-automatic and fully automatic bottle machines, the blow mold is the second - and usually final - mold used after the initial parison mold. This second machine mold is also referred to as a "finishing mold" (Munsey 1970) or a "forming mold" (Holscher 1953). Blowpipe - A long, narrow, hollow iron or steel tube used for glassblowing which was first used in Asia Minor by the 3rd century B. C. (Hunter 1950). The blowpipe was often referred to as just the "tube" by early glassmakers (Hemingray 1860). Blowpipes averaged 4 to 7 feet in length, 1/2" to 1" in diameter for most of its length (occasionally larger for larger bottles and window glass), and were usually tapered to a mouthpiece on one end and slightly enlarged on the glass working end (Hunter 1950; Wilson 1994). 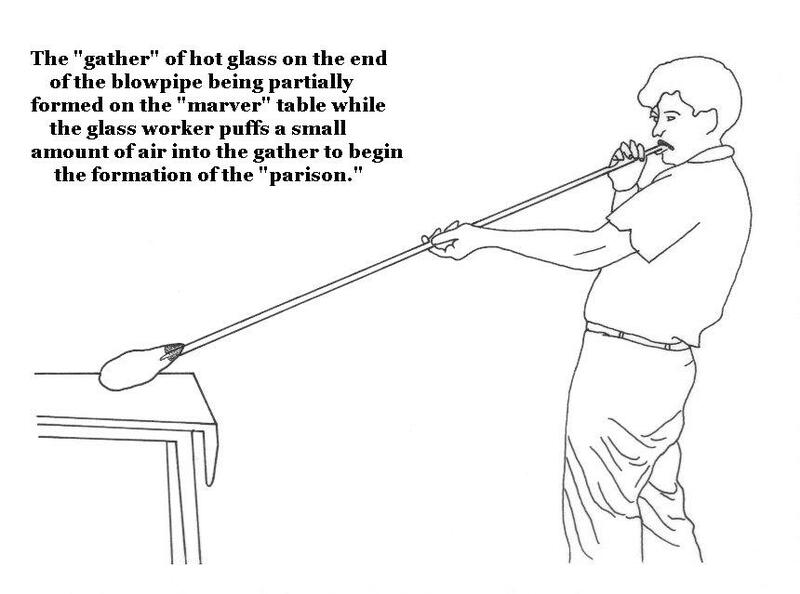 The glassworker blows through the mouthpiece end of the pipe to expand a gather of glass on the other "gathering head" end of the pipe. The gathering head was a thicker section of ferrous alloy pipe (something resistant to oxidation) welded onto the pipe end. 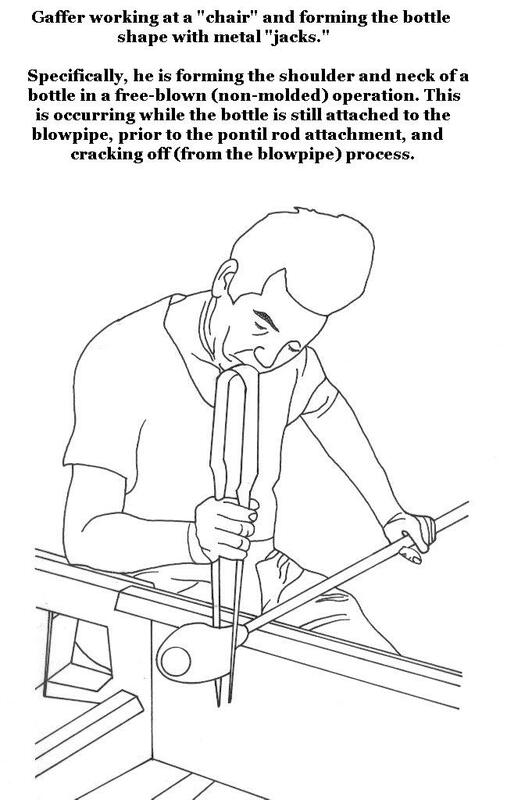 Blowpipes usually had a rubber covered section near the mouthpiece end for the glassworker to gain a better grip for more power when turning the pipe - something that had to be done continuously with the relatively fluid hot glass (Scholes 1952). As noted below, the blowpipe in the early days was also frequently used as the pontil rod. Blowpipe pontil scar or mark - Also known as an open pontil or "tubular pontil" (White 1978). 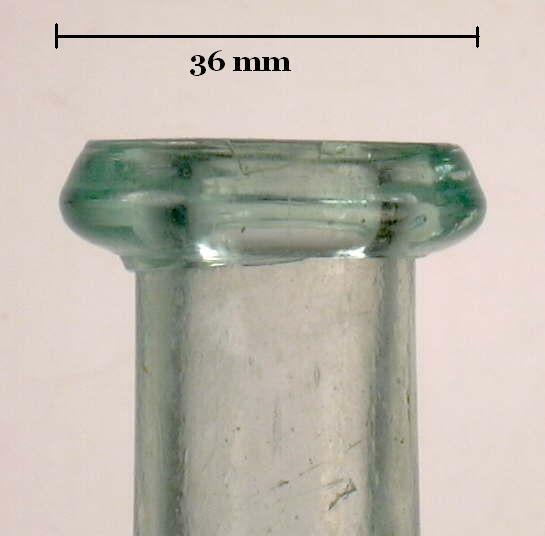 This is a distinctive round, sharp, and hollow "life-saver" shaped disk of glass on the base of a bottle which was usually formed when one end of the blowpipe itself was used for the pontil rod. Click on blowpipe pontil to view a picture. Please see the Bottle Bases page for more information on this and the other different types and variations of pontil scars and how to differentiate them from each other. The image to the right above is of a blowpipe pontil on an 1840s New England liquor flask. Bocca - An opening in the side of the furnace through which the pot is placed in the furnace. The glass batch is placed in the pot from which the gather is taken. The image to the left (from a late 19th century trade card) shows glass workers making gathers from the bocca on the side of a glass furnace. Body - The main content containing portion of the bottle, which lies between the shoulder and heel (insweep). See the Bottle Body & Mold Seams page for much more information on bottle bodies. Also see the General Bottle Morphology page for an illustration. Bottle - As used on this website, a bottle is a glass container that was used to contain some product or substance. A bottle has a bore and/or neck which are significantly smaller in diameter than the body diameter. See jar below. Bottle glass green - The natural aquamarine color of bottle glass resulting from the presence of iron oxides in the sand (White 1978). See the Bottle/Glass Colors page. Bottom hinge mold - A two-piece mold that his hinged together at the bottom - base portion - of the mold. See hinge mold. Bottom plate - Also know as a base plate, this is the separate mold section that formed most or all of the base of a bottle. White (1978) defined it as "The shallow depression in the bottom of machine-made bottles and jars designed to allow for stability..." which is really the effect produced on a bottle by the bottom plate. Most bottle molds usually had a separate base plate which resulted in either a cup-bottom or post-base conformation on the resultant bottle. Hinge molds, and the key mold variant of the hinge mold, did not have a separate bottom or base plate. In machine-made bottle manufacturing, the bottom plate - or simply "plate" - is the base of the machines blow mold. Bore (orifice) - The opening from which the bottle contents are accessed. Also called the aperture, orifice, opening, throat, or mouth of the bottle. See the Bottle Finishes page for much more information on finishes and finish parts. Also see the General Bottle Morphology page for an illustration. Bubbles - Variably sized and shaped air or gas pockets in the glass; see the image to the right which shows hundreds of bubbles in a liquor bottle. Bubbles is likely a collector based term, though it is quite visually descriptive and is used on this site. Bubbles are also referred to as seeds (small bubbles) or blisters (large bubbles) in the glassmaking industry (Tooley 1953). The term seeds is used in reference to very small bubbles, i.e., "seed bubbles". Ca. - Abbreviation for "circa", meaning approximately. Used on these pages to denote an approximate age or age range, i.e., ca. 1850-1860. Calabash - A large, gourd, or pear shaped bottle (also called flasks), popular during the mid 19th century - 1850-1870. Period bottle makers sometimes called them "globe bottles" (Wilson 1994). The name presumably originates from the resemblance of these bottles to the hard shelled, gourd-like fruits of the tropical American "calabash tree" - Crescentia cujete (Gilman & Watson 1993). The image to the left is of a calabash bottle/flask from the 1850s which is described more fully on the Liquor/Spirits Bottles typology page. Canning jar - Glass jar in which food is preserved at home, typically having a wide mouth for access and some type of (hopefully) air tight closure. Canning jars are also largely round in cross-section, though there are some square and multi-sided jars. Click HERE for a picture of a typical 20th century example. Also called a fruit jar, though canning jar is the preferred term on this website since it is more embracing, though both terms may be used interchangeably. 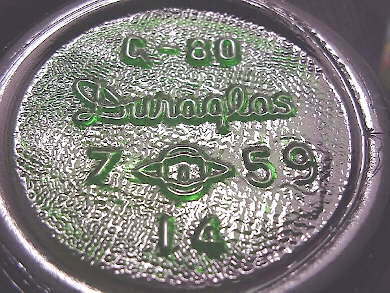 Capsule - A lead or tinfoil (or in more recent years - plastic) secondary cover closure used to cover the closure and finish of a bottled product. Most familiar today on wine and champagne bottles to cover up the cork help prevent seepage and/or evaporation of the contents. Click capsule for a picture of one on a Ferro-China-Berner Tonic bottle that dates from the early 20th century. Carboy - A much larger than usual (several quarts to 10 gallons or more) bottle which is typically round or cylindrical and used for bulk liquid storage. Carboys were often covered with woven wicker or enclosed in a wooden box to protect the bottle. Also called a demijohn. 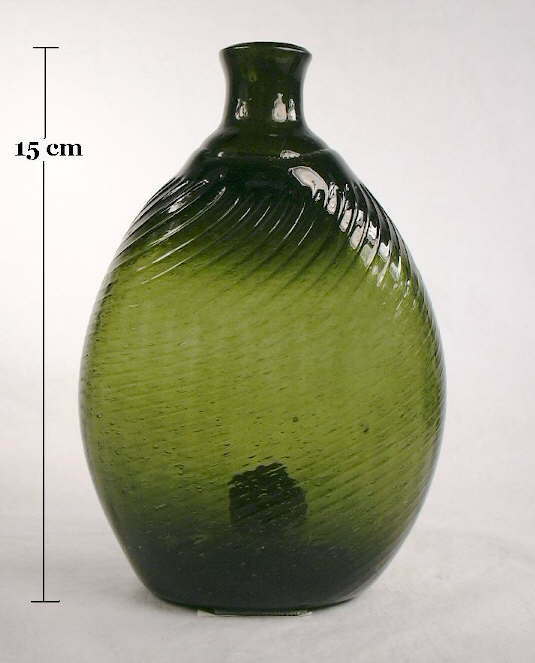 See the Carboy/Demijohn section of the "Miscellaneous Bottles" typology page. Case bottle - A square bottle which was designed to pack efficiently together in a packing box or "case." 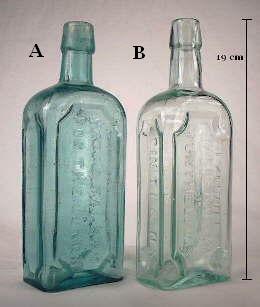 A common use of this term is in reference to square gin bottles, i.e., "case gin" - a mid-19th century example of which is pictured to the right. Case gins are covered in more depth at this link: Case Gin section of the Liquor/Spirits bottle typology page. Case wear - Wear to the high points of the embossing, sides of a bottle, and/or the base from the bottles contact with neighboring bottles while being transported or otherwise handled in cases. Case wear is most common on soda/mineral water and beer bottles which were usually re-used many times. Click on The Dalles Soda Works to see a Hutchinson soda bottle that exhibits case wear on the high points of the embossing - a common location for such. Casing (aka "plating") - The process of encasing or layering two or more layers of colored and/or colorless glass, to make "cased, "plated," or "flashed" glass (Wilson 1994). See flashing. Chair - The name for a wooden bench with two parallel horizontal arms at which the glassblower (gaffer) works. Kendrick's 1968 book contains excellent pictures of chairs taken at a Mexican glass factory still using 19th century methods. "Chair work" was a term for the bottle making hand processes done while using the chair for mouth-blown bottle production (Kendrick 1968). The term "chair" was also a synonym for the shop. Click chair use to view an illustration of a chair in use. 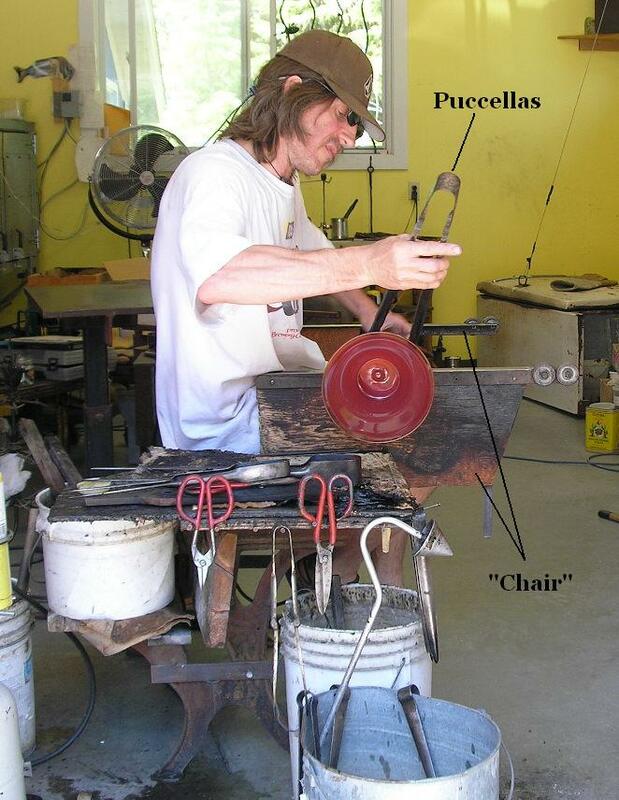 Click "chair" used for modern day art glass production to see a modern example of a chair in use by a Canadian glassblower. (Photo courtesy of Bill Lockhart) The arms of glassmakers chairs were often either of metal (like in the linked photo) or at least covered with metal to resist the heat of the blowpipe which was rolled on those arms. 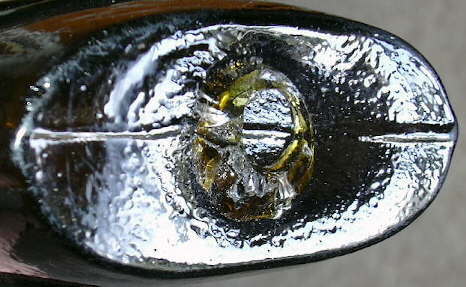 Check - A tiny crack, usually caused by contact of hot glass with a cold surface (Scholes 1941). Chestnut flask - An early American (1780-1830) free-blown and laterally compressed style of flask, typically produced by early New England glass factories (McKearin & Wilson 1978). Click chestnut flask for a picture. 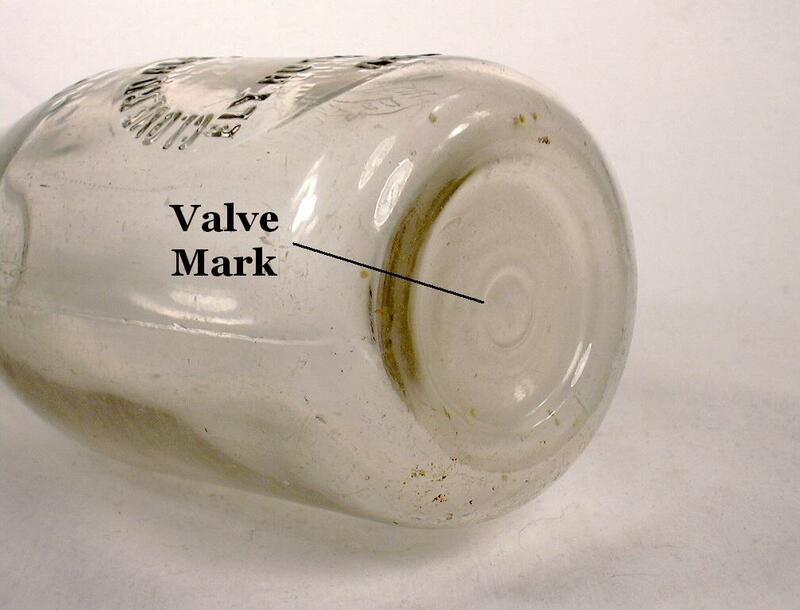 Chill marks - Irregular, often undulating, wrinkles or ripples on the surface of bottles (or other glassware) usually caused by a cold metal mold or the action of a pressing plunger (Wilson 1994), as in the case of bottles made in a press-and-blow machine. This is particularly often seen on the neck of press-and-blow, machine made milk bottles from the 1910 to 1940s era (empirical observations). See the discussion about this feature on milk bottles on the Food Bottles & Canning Jars page. Clapper - Tool used in glassmaking to shape objects. Closed mold - A type of mouth-blown bottle mold where the base, body, shoulder, neck, and some/all of the finish conformation was molded - at least in part. This is as compared to an open mold which formed the base, body, and usually (depending on the era) the shoulder and some/all of the neck. The finish and sometimes upper portion of the neck was not formed by the mold, but rather by the tooling of the terminal neck glass or post-blowpipe applied glass. References (primarily Kendrick 1963) that use these terms are somewhat confusing. Among other questions this author is not sure if a dip-mold is considered a primitive open mold? Whether a closed mold is a pertinent term for both mouth-blown molds and machine molds that form most of the form of a bottle? Also, whether a "full-size" mold (McKearin & Wilson 1978) is the same as an open or closed mold? Generally, neither term is used on this website; instead, the specific types of molds, finish, and other molding details are used. Closure - A "device" such as a cork, stopper, lid, or cap used to seal a bottle. See the Bottle Closures page. 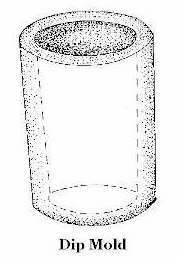 Codd stopper - Internal closure intended for a carbonated product (usually soda or mineral water) where the carbonation pressure forces an enclosed glass marble against a rubber gasket inside the bore to seal the bottle. 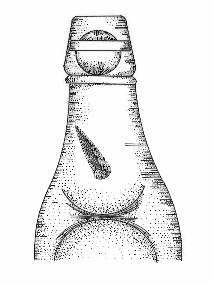 The illustration to the left is of the upper part of a Codd closured soda bottle with the marble in the sealing position inside the finish. See Bottle Closures page. Collar -Used often to denote the lower part of a two part finish, i.e., the finish portion which lies immediately below the lip or upper finish part (see finish below). Some use the term collar to refer to the upper portion of a two (or more) part finish or even to the entire finish if it is composed of only one part (U. S. Patent Office 1875). The terms "string rim", "lower part", or ring are also used to refer to what is called a collar here. See the Bottle Finishes page for more information on finishes and finish parts. Also see ring below. This is one of many variably and confusingly used terms regarding finishes. Also see the General Bottle Morphology page for an illustration. Collector jargon - Descriptive bottle related terminology which is collector based or originated. Examples include "slug plate" for the typically embossed plate area of plate mold produced bottles and the generic use of the term "applied lip" for all non-machine-made bottles. Collector jargon will be noted where it is pertinent to do so. Continuous thread or screw-thread - See screw-thread (outside) below. Cork - A tree bark (Quercus suber) utilized to produce a very functional bottle closure which is still in use today for wine and occasional other products. In collector jargon it is a term used for the lip or finish itself - i.e., "a cork top" bottle. To the right is a picture of an early 20th century (ca. 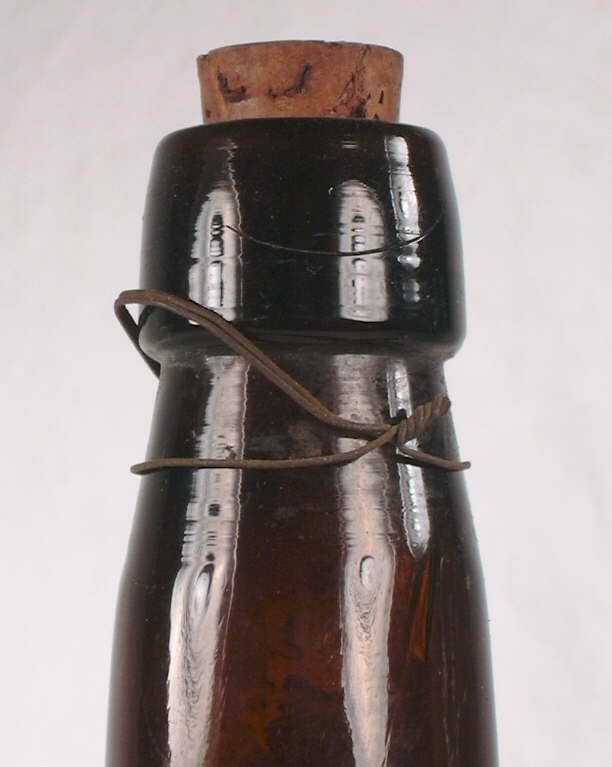 1900-1910) beer bottle with the original cork in place and the wire closure still present. Cork press - Hand tool designed to squeeze a cork into the desired shape for use as a closure. 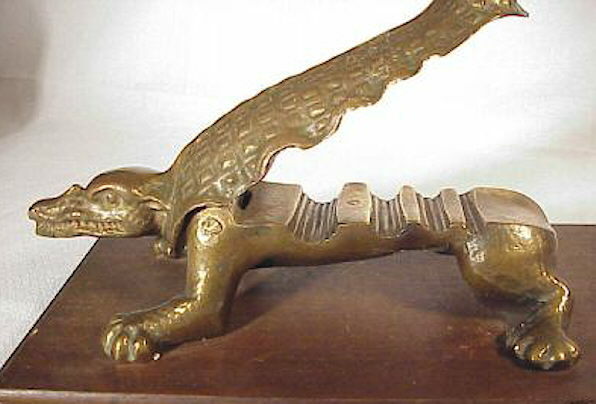 Click cork press for a picture of an ornate late 19th century cork press. Cover groove - A groove on top of the closure or lid that receives the bail. It keeps the closure from slipping (White 1978). This feature is particularly common on Lightning type fruit jars. Click Lightning lid for a close-up picture of the cover groove on a late 19th century Lightning fruit jar. Cracked-off (cracking off) - A process of removing the blowpipe from the bottle. Cracking or wetting off entails "...scoring the glass near the blowpipe with a wet file or other tool to create a localized thermal tension. A sharp tap on the blowpipe detaches the glass object. The crack-off surface is flat and uneven with sharp, often jagged edges..." (Jones & Sullivan 1989). Cracked-off is also a type of finish; click cracked-off finish to view the description of this finish on the Bottle Finish Types & Style page. Click scroll flask finish to see a picture of a cracked-off finish. Other terms for this finish include "break-off", "burst-off", and "wetted off"; see wetting off below. Also, see the cracking-off and shearing section of the main Bottle Finishes & Closures page. 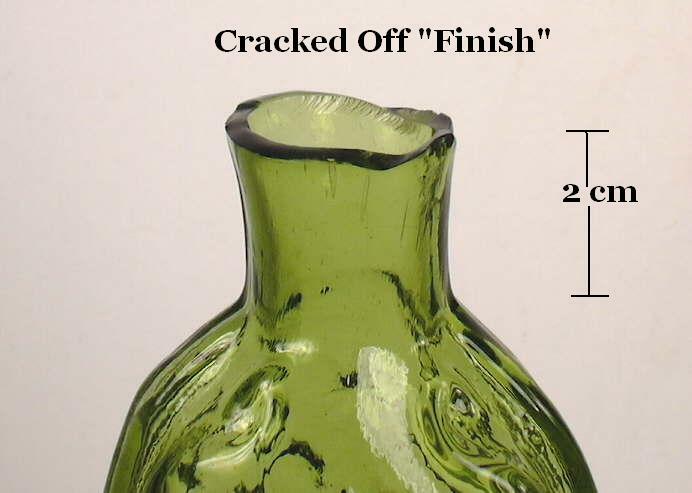 Crazing (aka "crazing lines") - An grouping of short fissures or checks most commonly found in and/or immediately adjacent to the finish (i.e., upper neck) of an true applied finish bottle, though can also be found rarely in some tooled finishes. It results from the heat differential between the hot applied finishing glass and the cooler neck glass. Click crazing marks to view an image of a bottle neck/finish with crazing evident. Finish designed to accept the crown cap, i.e., a crown cap finish. 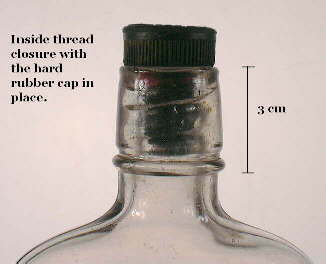 Crown top or cap - Metal cap used as a closure on primarily beer and soda bottles and still widely in use with the same dimensions as when patented in 1892. Also a type of bottle finish that takes a crown cap. The image to the left is of a crown cap finish without the cap in place. Click on Bottle Finish Types page to view the section of those pages which covers this finish type. Cullet - Waste or recycled crushed glass added to new glass batches - reportedly up to a quarter of the volume - as a flux as its addition would lower the batch melting point as well as recycle a useful product (Bridgeton Evening News 1889; New York Herald 1910; Hunter 1950). The term apparently comes from the French word cueillette meaning a gathering, a picked-up lot, a collection (Trowbridge 1870). Cup-bottom (or cup-base) - This refers to a bottle base configuration formed from a mold base plate which was shaped like a very shallow and wide "cup" (actually more bowl shaped) and formed the entire conformation of the bottle base. The mold types which produced this base orientation are referred to as a cup-bottom mold (Toulouse 1969b; Munsey 1970) or cup-base mold - both terms are used on this website. Bottles formed with this type mold have a horizontal seam mark at or just above and encircling the heel of the bottle and the side mold seams do not extend around the heel onto the bottle base. 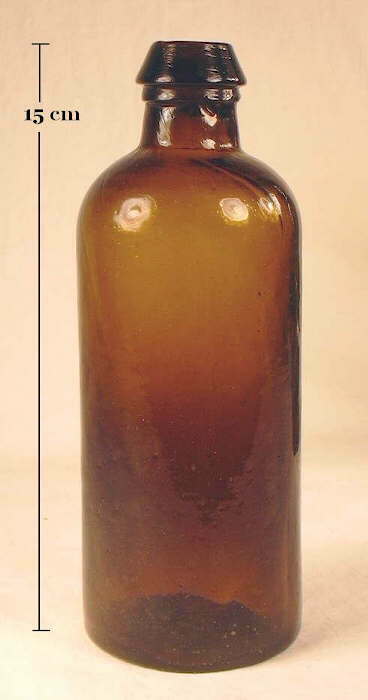 Click on early 20th century malt tonic bottle to see an example of a cup-bottom mold produced bottle with the mold seams pointed out. 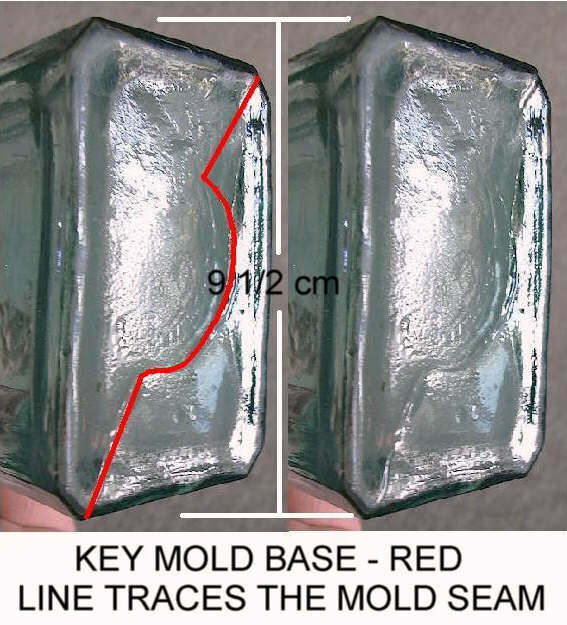 Chronologically, this type mold was used more commonly after the post-bottom or post-base mold, but that is variable depending on the type of bottle. Click on Bottle Bases to view the section of that page that covers this subject in much more depth including illustrations. Cup-bottom mold (cup-base mold) - See entry above. Cure - A patent or proprietary medicine that claimed to eliminate one or more diseases. 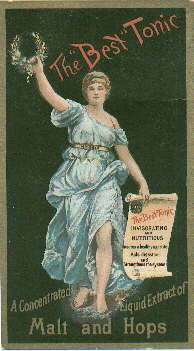 The use of the word "cure" was substantially curtailed after passage of the Pure Food and Drugs Act of 1906 and the Sherley Amendment in 1913 dealing with fraudulent advertising claims. Thus, bottles with the word "cure" embossed (or on the label if present) will virtually always date prior to 1913 (Agee 1969). "Cure" or "cures" is also a collector term for the category of bottles with the word "cure" embossed on them. Date line - From White (1978) in reference to the vertical side mold seam on a bottle and the ability to date a bottle based on the height of the seam line. The concept dates from Grace Kendrick's 1963 book The Antique Bottle Collector. This is a dated and misleading term as it is well understood now that the height of the vertical side mold seam is at best a poor indicator of the age of a bottle. Click mold seam dating "thermometer" to view a discussion of this "myth." Decanter - A typically highly decorative, indefinitely re-useable bottle (i.e., a specialty bottle) made typically for dispensing liquor or wine. Decanters were usually made from colorless glass, though colored glass is not uncommon as the image to the right shows. Decanters are distinguished from a bar bottle by a decanter having a flanged or flared lip/finish and being sealed with a glass stopper (Ketchum 1975). The decanter pictured to the right is of mid-19th century manufacture and features beautifully colored glass, a flared finish and a glass stopper. (Photo courtesy of American Bottle Auctions.) Also see bar bottle. Decolorizing - Decolorizing is in essence neutralizing the effects of the iron and carbonaceous impurities in the glass mix or batch to obtain colorless (clear) glass. This is typically done by adding selenium, manganese dioxide, and/or arsenic to the batch though there are other methods. Early glassmakers referred to such substances - particularly manganese - as "glassmakers' soap" due to the ability of these chemicals to "cleanse" or neutralize the natural impurities (particularly iron) in the sand used for making glass. See the colorless glass description on the Bottle/Glass Colors page. Demijohn - A larger than usual (several quarts to many gallons) bottle which is typically ovoid or bladder shaped. See carboy. 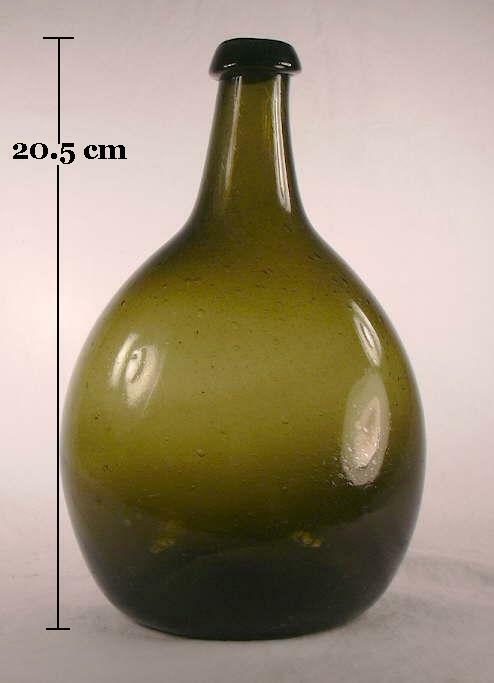 Also see the Carboy/Demijohn section of the "Miscellaneous Bottles" typology page. Deposition lag - (aka "time lag") A significant time span between manufacture, use, and discarding of an item. Used here in reference to a bottle being thrown away long after it was manufactured. As an example, it is common to find the fragments of canning jars manufactured during the mid to late 19th century in dumps or deposits that date well into the 20th century; the jar only being thrown away when broken after decades of use. Devitrification - An alternative term for the processes and appearance of weathered glass, i.e. "to deprive of glassy luster and transparency; especially to change from a vitreous to a crystalline condition" (Merriam-Webster Online 2009). See patination. 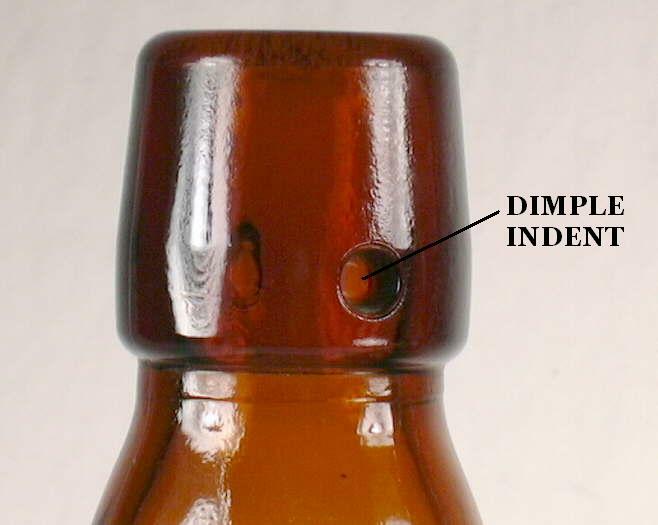 Dimple - The small molded depression or hole on the bottle neck into which the lever wire of a toggle closure device is hooked (White 1978). 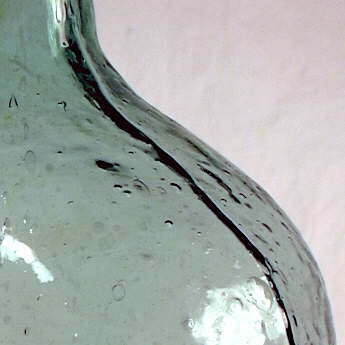 This is another bottle feature that is easier to picture than describe - click dimple to view a picture of this. Disk pontil - This is a variation of the sand pontil scar which only adhered to the indented bottle base on the outside edges of the pontil rod head (or the glass gathered onto the pontil rod head) not to the majority of the pontil rod head/glass gather area (Van den Bossche 2001). 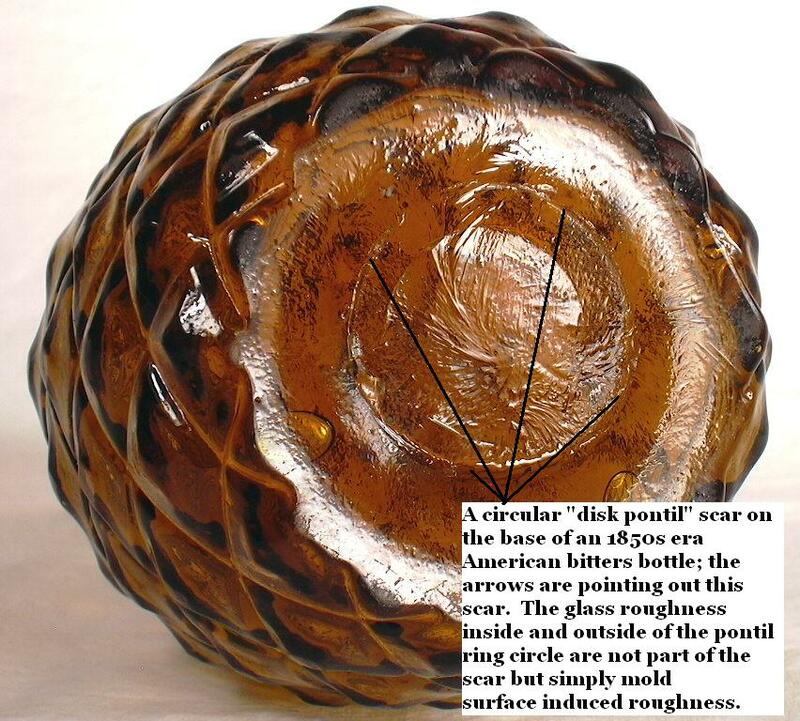 The disk pontil scar typically is a large circular (or oval, sometimes irregular) scar comprised of small chunks of glass adhering to the bottle base interspersed with portion that are essentially chipping of the bottle base where the rod was broken away. Click disk pontil close-up to see a disk pontil scar on the base of an American made figural (pineapple shaped) bitters bottle dating from the 1850s or early 1860s. This subcategory of pontil scar is somewhat similar to, but usually much bigger than, the blowpipe pontil scar which is typically about the size of bottle bore. Users should reference the pontil scar or mark portion of the Bottle Bases page for examples of the different types and variations of pontil scars, as well as descriptions of how they were formed. Dish base - A concavity in the base of a bottle which is somewhat shallower than a push-up or kick-up (White 1978). Down-tooled - A term used by Jones & Sullivan (1989) for a "string-rim profile (which) slopes outward and downward." Those authors used the term primarily in reference to the appearance of the lower portion of a two-part finish. 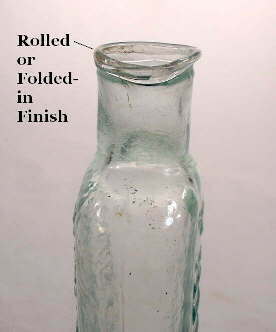 A down-tooled finish on an early (1800-1840) American utility bottle is viewable at this link: round utility bottle finish. Also see up-tooled. 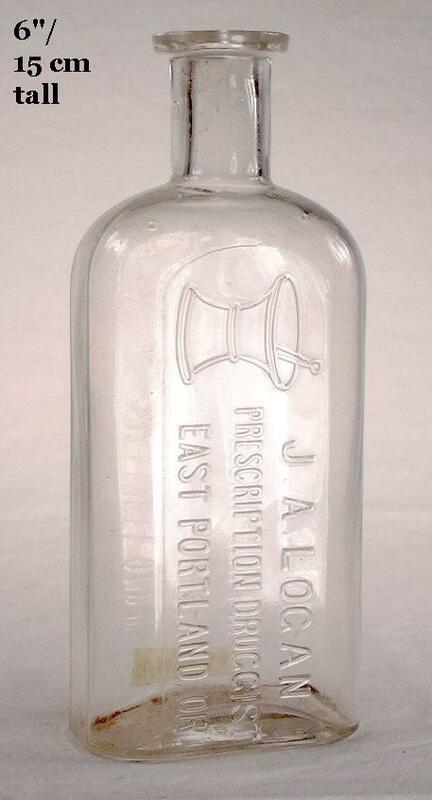 Druggist bottle - Also known as pharmacy, apothecary, drugstore, or prescription bottles. These are a class of bottles used by local druggists to purvey their products to the public. 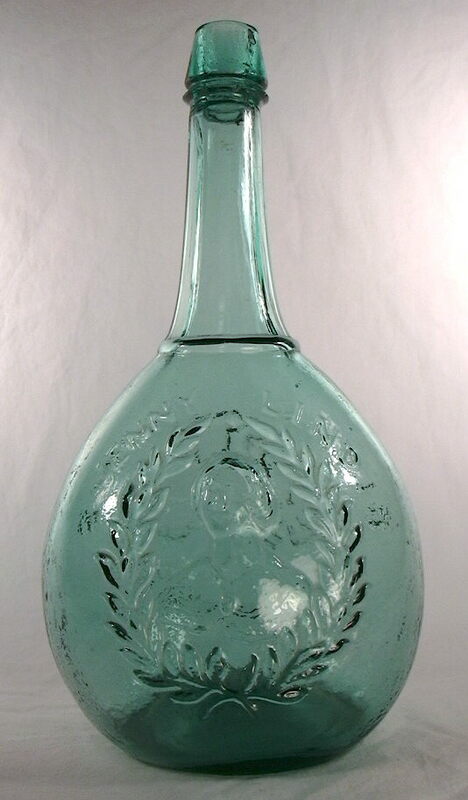 Most glass companies from the 1870s through he mid 20th century produced these types of bottles. This category is covered within this website on the Medicinal/Chemical/Druggist page at this link: Druggist/Prescription Bottles. Ejection mark - See valve mark below. Embossing - Raised lettering, designs, or graphics on the surface of the bottle that are formed by incising on the mold surface(s). The image to the left shows distinct embossing on a Hutchinson style soda bottle dating from the first years of the 20th century. Also see plate below. See the General Bottle Morphology page for an illustration and the Bottle Body Characteristics & Mold Seams page for more information on embossing. 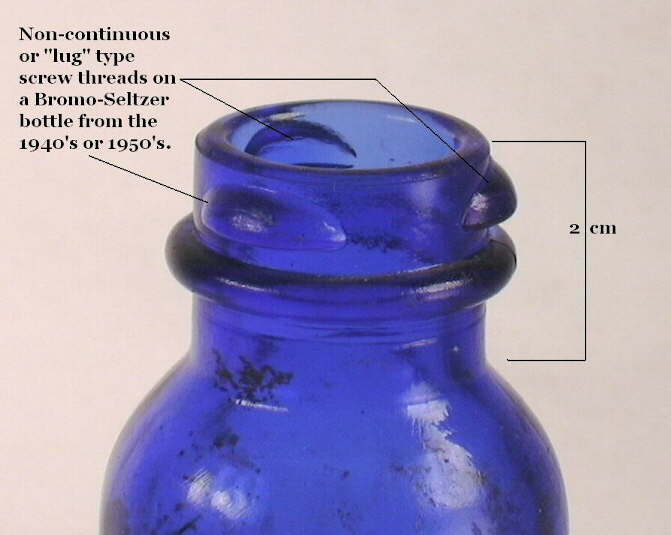 Empontilling - The process of attaching a typically iron rod (pontil) to the base of a bottle (and other glass objects) to secure it while the neck and finish were being completed (i.e., finishing). See pontil mark or scar below. 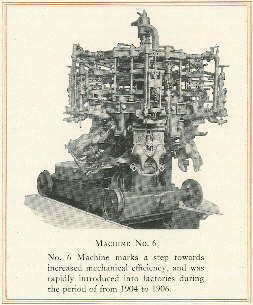 Feeder machine - A generic name for gob feeder enabled automatic machines which were semi-automatic machines made fully automatic with the incorporation of a glass supply or feeding device and a blank transfer mechanism (Pearson 1928). Fifth - Collector jargon term for a 1/5th (approximate) gallon capacity cylinder liquor bottle which is relatively tall and narrow with straight (vertical) sides. This is shape which is still widely used today for spirits of all kinds. Click SF&PGW fifth for picture of a Western American made "fifth" dating from about 1880. Figured flask - A generic name for the large class of liquor flasks primarily produced between 1815 and 1870 which are also referred to as "historical", "pictorial", or "decorative" flasks. These flasks were quite popular during that era because they were both functional and decorative (McKearin & Wilson 1978). 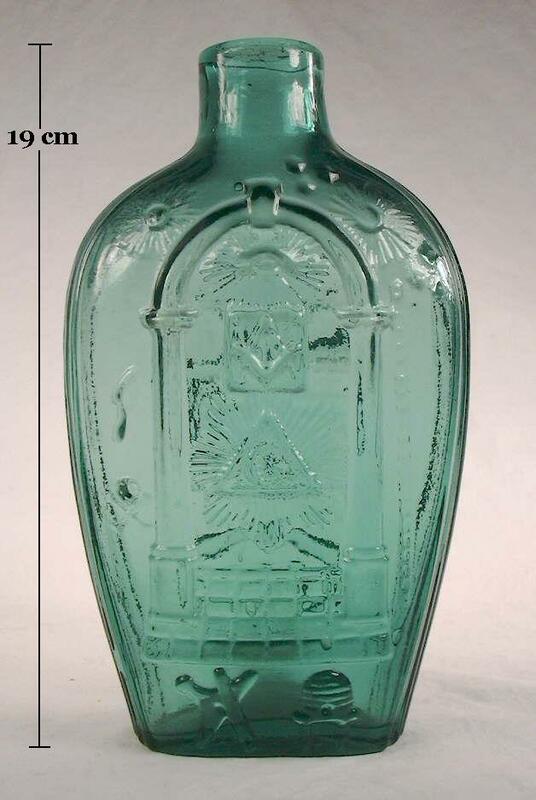 The image to the right is of a "sunburst" design, early American, figured flask produced in New England (Keene, NH.) about 1815-1817. This flask is discussed more on the Liquor/Spirits Bottles page. 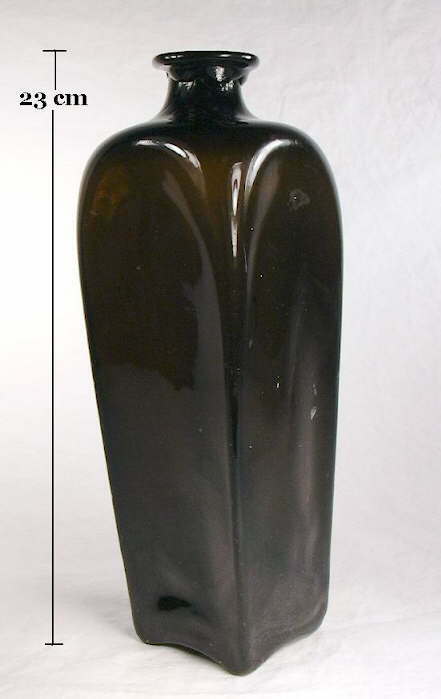 Figural bottle - A bottle molded in the shape of things - animal (including humans), vegetable, and mineral (Munsey 1970). 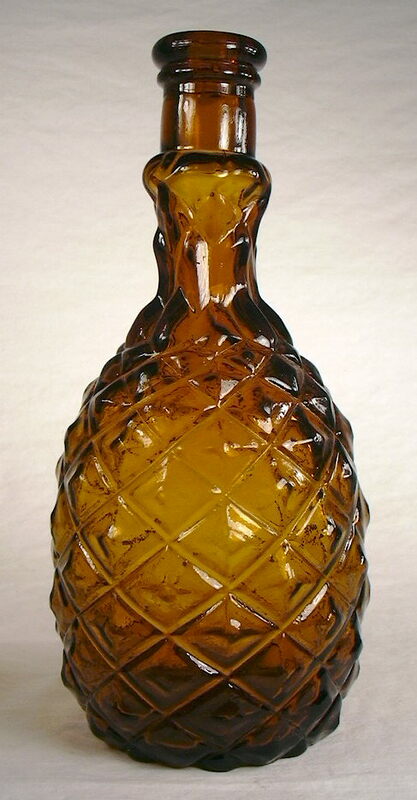 For an example of a Civil War era bitters or liquor bottle in the shape of a pineapple, click pineapple figural bottle. Filamented ring - A ring on the base of early machine-made bottles formed when the gob of glass was severed after being drawn into the mold (White 1978). Also called a suction scar . The filamented ring may be more a reference to the versions of this mark where the cut was "sloppy" like the in the pictured bottle in the description of the suction scar below. Finial - The upper portion of a glass stopper which grasped to remove it from the bottle. Also used to refer to the "decorative, terminal part of an object" (Kaiser 2009) like the decorative curl at the end of an applied handle on a bottle. Finish - Simply put, the finish is typically everything above the distinctive upper terminus of the neck. It refers to the combination of the lip (upper part) and collar (lower part) of a finish, if both are present, or any other distinct parts if present. The term "finish" originates as a reference to the final process of making a mouth-blown bottle - completion or "finishing" of the lip and upper portion of the neck. Generically, a finish can have one-part, two-parts (the crown finish to the above right is two-part), three-parts, and rarely more parts (Jones & Sullivan 1989). The finish on a bottle is also referred to sometimes as a "top," "mouth," or "corkage" (U. S. Patent Office 1893; Howard 1950; White 1978). (Note: Semi-automatic and fully-automatic bottle machines start the bottle manufacturing process with the finish/lip but the term is used for all bottles - mouth-blown and machine-made. On ground finish, external screw thread bottles the actual "finishing" part of the manufacturing process is the grinding of the top surface of the finish rim, as the threads were formed by the mold itself.) The image to the left shows five different finishes spanning the time frame from the 1850s to 1920s. See the Bottle Finishes page for much more information on finishes. Also see the General Bottle Morphology page for an illustration. Finishing - The last step in the process of producing a mouth-blown bottle - the development or "finishing" of the end of the neck where the blowpipe was removed (i.e., forming a lip). Also called "goffering" during the 19th century (U. S. Patent Office 1886). Finishing mold - See blow mold. Finishing tool - See lipping tool. Fire grenade - A type of bottle designed to be filled with carbon tetrachloride (a fire retardant) and thrown into fires to extinguish them; an early "fire extinguisher." These type bottles were fairly common from about 1880 to well into the 1900s, when vaporized chemical fire extinguishers were invented and found to be much more useful and efficient (Munsey 1970). One of the more common, late 19th century fire grenades is pictured to the right - the HARDEN'S HAND GRENADE. For more information on the subject see the Miscellaneous & Foreign Bottles typology page. Fire polishing - The reheating of a bottle or portion of a bottle (like a sheared lip or neck) in the glory hole to remove tooling or mold marks and/or obtain a smooth surface. Usually gives the glass surface a almost liquid like sheen. 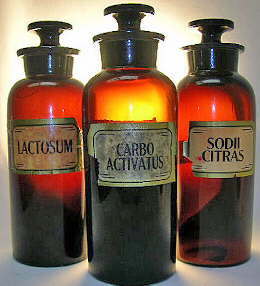 Commonly done as part of the finishing process during the first half of the 19th century on pictorial or figured flasks. The body of the clear green sunburst flask pictured above to the right was fire polished. Also see the picture near the sheared finish or lip description below which is a close-up of the same flask. 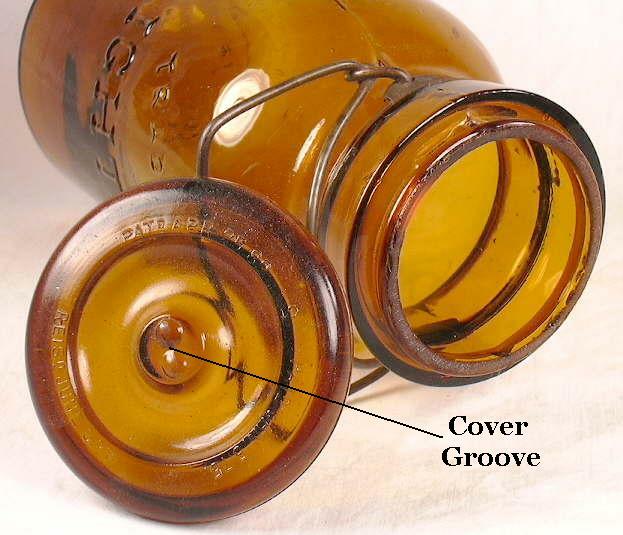 It should be noted that this was also done on the finishes of early (first half of the 20th century) machine-made bottles to smooth out the neck ring mold seams on the finish rim for better sealing by rim sealing closures - particularly screw caps and on the crown cap finish (Lockhart et al. 2009b). Flared finish - A finish or lip that spreads outward so as to create an opening whose opening is wider at the top than any other point on the neck (White 1978). A flared-sheared finish as described by White is pictured to the right. A flare finish is also a type of finish covered on the Bottle Finish Types & Styles page. 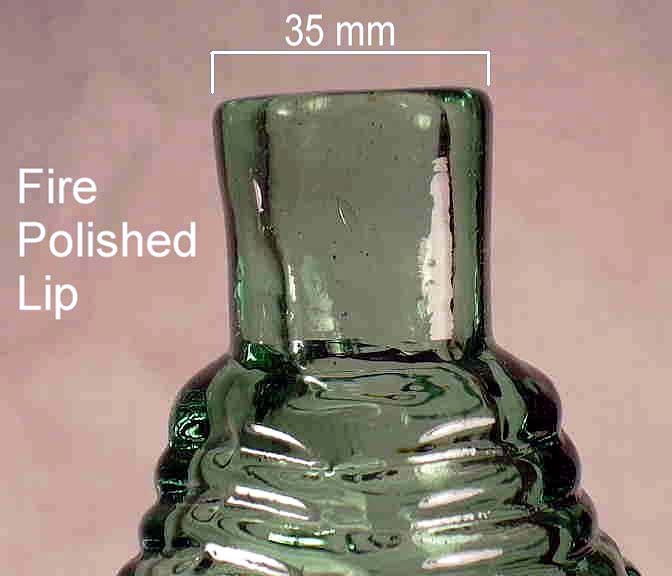 The term is also used to describe a bottle finish which protrudes ("flares") away the neck horizontally more than its vertical depth or thickness. Click flared finish to see a picture of this alternate type flared finish which is relatively common on medicinal bottles from the mid-19th century through early 20th century. Flashing - Also called "flashed," "striking" or "cased glass" by glassmakers (Tooley 1953; Kaiser 2009); also see casing. A term for glassware or bottles with a thin layer of opaque or colored glass overlaying a colorless (aka "clear") glass body, or vice versa (clear over colored glass). This is done by various means including applying a thin layer of glass over the main body glass (possibly by dipping?). The process of "striking" - which could also result in the same effect - is more chemical and heat induced. According to Kulasiewicz (1974), "..the striking process is complicated and often depends on special heat treatments to start the crystallization process and special chemicals to reduce the metal out of the melt or to act as the nuclei for growth." That author also notes that "...complicated theories have been published, yet these do not dispel the magic of clear glass suddenly becoming colored." 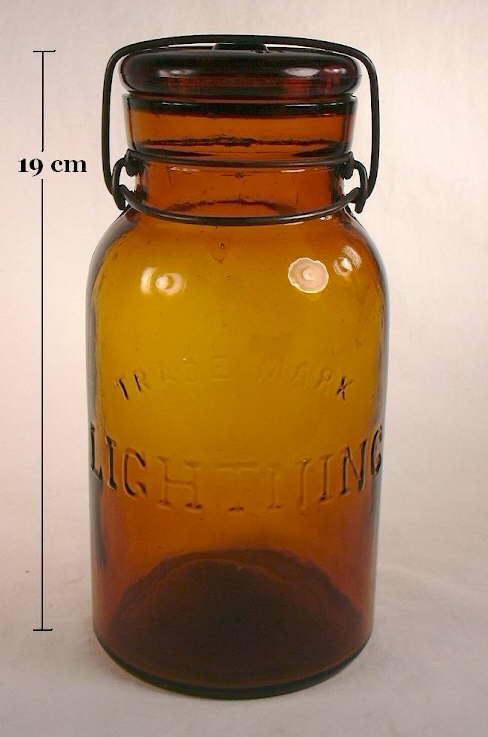 Flashing was little used with utilitarian bottles but was commonly used on glassware and specialty bottles. Flask - A bottle originally designed to be portable and easy to carry, which is typically oval or rectangular in cross-section and laterally compressed on two sides. Though the shape can be found in a multitude of sizes, on this website flasks are considered to have a capacity of about 16 oz. or less which is a more or less the upper limit of a "portable" size. 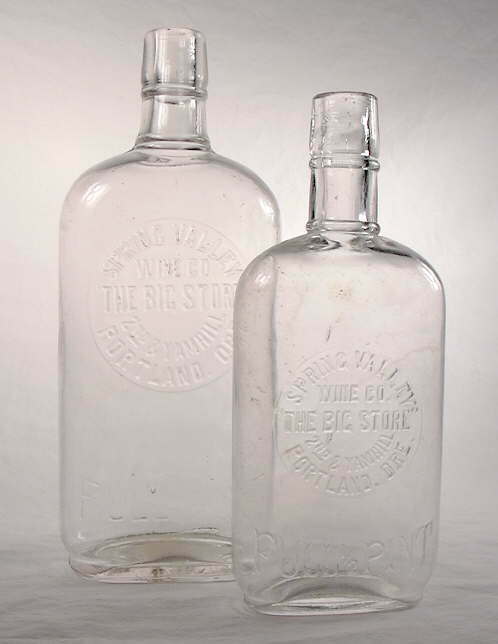 Two sizes (pint and half-pint) of the "Eagle" style flasks are pictured to the left; this style is discussed on the Liquor/Spirits Bottles page. Flint glass - A heavy, leaded glass of high quality with high refractive power, and great luster used in the choicest cut glassware (White 1978). It was also glass made using calcined flints, or flints reduced to a white powder, as a source of silica (Kaiser 2009). The term later used loosely by glass manufacturers in reference to clear or colorless glass in general (Scholes 1941). Flux - A substance - usually soda - which promotes the fusion of glass. Free-blown - Glass formed by blowing and manipulation by hand and/or with tools but without the aid of a mold to shape the bottle. Thus, a free-blown bottle has no mold seams or other mold induced markings. Also called "off-hand" blowing or working (Scholes 1952). Fruit jar - Glass jar in which food is preserved at home, typically having a wide mouth for access. The pale aqua quart jar pictured to the right is an example of a fruit jar that dates from the 1920s (Creswick 1987). See canning jar which is the preferred term on this website since it is more embracing, though both terms may be used interchangeably. Full sized bottle mold - A bottle mold that is used to form a specific shape and size of bottle where the interior surface of the mold is the same size as the outside of a finished bottle. An inflated gather is placed into a full sized mold and expanded until the outside surface of the gather conforms with the inside of the mold. A full sized mold forms the base, body, shoulder, and most - or even sometimes all - of the bottles neck/finish. Also see dip mold and pattern mold - both of which are generally not considered full sized molds. 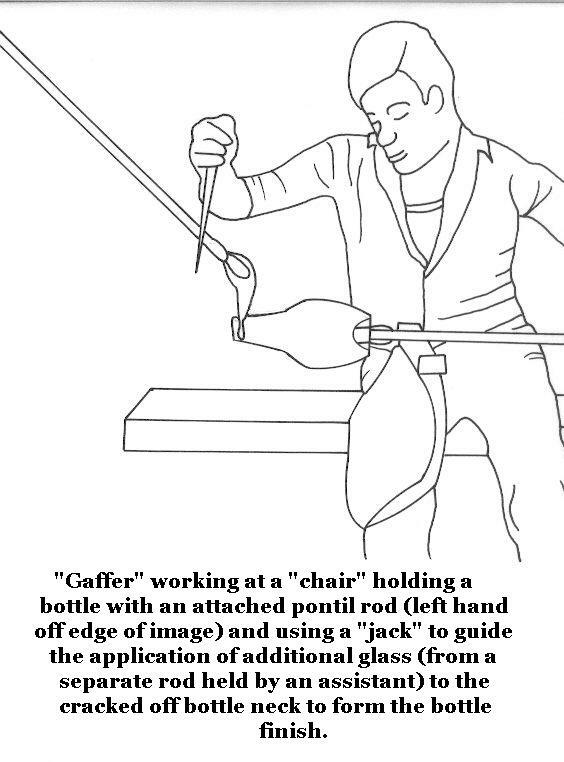 Gaffer - A master glass blower or craftsman and primary person that produced mouth-blown bottles. Was assisted by a servitor. The term is also used for the head glassmaker or workman in a hand shop, which was usually the master blower and/or to refer to the "finisher" of bottles (Bridgeton Evening News 1889; New York Herald 1910). Reported to be an abbreviation or corruption of the English word "grandfather" meaning "old man" (Trowbridge 1870; Whitehouse 1993). Gather - The glob (gob) of molten glass gathered on the end of a blowpipe from the glass pot or tank which is expanded to eventually form a mouth-blown bottle. The process of collecting the glass on the end of the blowpipe was called "gathering" and the person in the shop who often did this activity the "gatherer" (Bridgeton Evening News 1889). Gasket - A liner applied between the sealing surface of the bottle (usually the rim, sometimes the shoulder like on Mason jars) and the closure to provide a airtight seal (White 1978). German half-post - This is an early method of bottle production where the initial gather of glass is slightly inflated then dipped again into the glass pot to apply a second layer of glass. 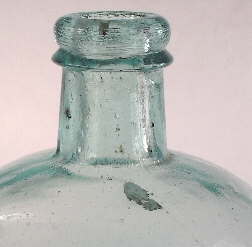 This second layer of glass did not totally cover the first gather which is typically indicated by a thickened ridge on the upper shoulder of the finished bottle. The picture to the left is an early American flask (1790-1820) produced by this method; note the ridge just below the neck. Bottles produced by this method are often called "double-dipped" in collector jargon. See the Glassmaking & Glassmakers page for more information. Ghost seams - Ghost seams are lightly imprinted (usually) and meandering mold seams found on the body, neck, and sometimes the base of machine-made bottles from a blow-and-blow machine. These seams are conclusive evidence of machine manufacture. Ghost seams are formed by the mold seams induced by the two halves of the parison mold. The meandering ("wavy") appearance is due to the distortion caused expansion of the parison in the second blow mold. Also and more precisely called "parison mold lines" (Miller & Morin 2004). See the Machine-made bottles portion of the Bottle Dating pages for more information. Glasshouse (aka glassworks, glass works) - The structure that contained the bottle/glass making materials, equipment and/or machines and where the bottles (and other glass items) were manufactured. Glass-tipped pontil mark or scar - A pontil scar which was formed when a solid iron rod or bar, tipped with hot glass, is used as the empontilling tool. The image to the right is of a sauce bottle base with a glass tipped pontil scar. See the discussion of the glass-tipped pontil scar on the Bottle Bases page. Glory hole - Small furnace, introduced about 1850, with one to four openings used for reheating the bottle while it was being worked upon (Wilson 1994). Most often used for re-firing the neck and finish of bottle to facilitating tooling, smoothing out imperfections (i.e., fire polishing or finishing) and for pre-heating blowpipes, pontil rods and other tools prior to use (Bridgeton Evening News 1889). This term is also used to describe a small access opening in a larger furnace used for the same purposes. Also called a "dog-house" in some countries (Kulasiewicz 1974; Whitehouse 1993). Gob - A portion of molten glass which is to be expanded (blown) into a bottle or other glass item. It can be the portion of glass that is delivered or fed into an automatic bottle machine (see next definition) or the portion of glass "hand" gathered on the end of a blowpipe, i.e., the pre-parison glass or gather. Gob feeder - A gob feeder is a machine that delivers hot, molten glass to a bottle forming machine; also called a "flow machine." This is the mechanism which turned semi-automatic bottle machines - which had to be hand fed - into fully automatic feeder machines and eventually eclipsed the Owens Automatic Bottle Machine in the production of bottles (Pearson 1928). Graphite pontil mark/scar - Collector jargon (and inaccurate term) for a type of pontil scar which should more accurately be termed an iron, bare iron, or improved pontil mark or scar. Iron pontil scars contain no graphite (carbon) (Toulouse 1968). See the iron pontil definition below and the discussion on pontil scars on the Bottle Bases page. Green glass - The longtime glassmaker term for glass with a variably aqua coloration from the naturally occurring iron in the sand used for making glass, i.e., neither colorized nor decolorized (Kaiser 2009). 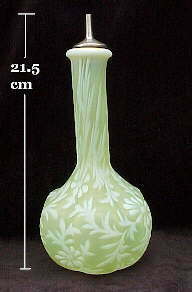 Also called "bottle glass" and "bottle glass green" (Kendrick 1968; White 1978). See the "Aqua (Aquamarine)" section of the Bottle/Glass Colors page. Ground rim/lip - A finish which has the top surface hand ground to enhance sealing and/or closure fit. Most commonly (but not exclusively) found on hand-made bottles with outside screw-threads, and in particular canning/fruit jars (picture to the left). Unlike a machine-made bottle where the side mold seam will be evident on the rim of the finish, a ground rim/lip bottle will have the side mold seam ending right at the juncture of the vertical (finish side) and horizontal (rim of finish) surfaces. The grinding process very often leaves behind a surface resembling very fine grit sandpaper and often resulted in very small (less than a pinhead in size) chips to the outside and inside edge. Some of the chipping is visible in the enlarged version of the picture to the right, which shows the dull and slightly rough ground surface on a fruit jar with a outside screw thread "finish". Also called a "bust-off and grind lip" (White 1978). Click ground finish to view the discussion on the Bottle Finish Types & Styles page. Hand made, Hand blown, or Hand manufactured bottle - Terms used to describe non machine-made bottles. See mouth-blown bottle. Heel (Insweep) - The lowest portion of the bottle where the body begins to curve into the base. The heel usually terminates at the resting point of the bottle, i.e., the extreme outer edge of the base. Put another way, the heel is the transition zone between the horizontal plane of the base and the vertical plane of the body. Also called the "basal edge" (Firebaugh 1983). 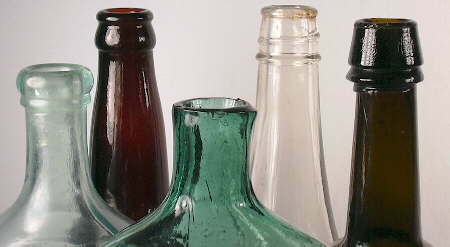 See the General Bottle Morphology page for an illustration. Hinge mold - This term is often used to refer to a two-piece mold with no separate base plate section. A hinge mold (aka hinge-bottom mold) bottle is indicated by the side mold seam continuing around the heel of the bottle, bisecting the base, and continuing up the opposite side of the bottle as the other side mold seam. Click hinge mold base for a picture of a typical hinge mold bottle. This is also sometimes called a "snap case" base in collector jargon if there is no pontil mark superimposed over the mold seam. In actuality, virtually all two (or more) piece bottle molds had hinges for ease of operation and fit precision, so the term is somewhat inaccurate. A better term is simply a two-piece mold. 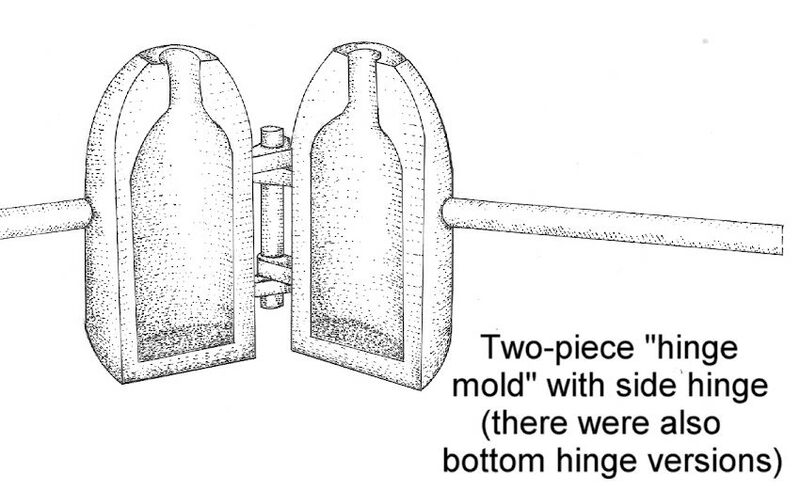 See the Bottle Bases page for an illustration of a two piece hinge mold. Also see key mold below. Hollow ware - A broad term that includes glass containers and tableware, as well as illuminating ware in the broadest sense (glass lanterns, globes and chimneys, light bulbs, radio and television tubes, etc.). Horizontal mold marks - Mold marks that run horizontally on a bottle standing upright. Horizontal marks are usually either the shoulder seam on a mouth-blown, three or four-piece mold produced bottle or the neck ring seam underneath the finish of a machine-made bottle. See the mold seams section of the Bottle Body Characteristics & Mold Seams page for more information. 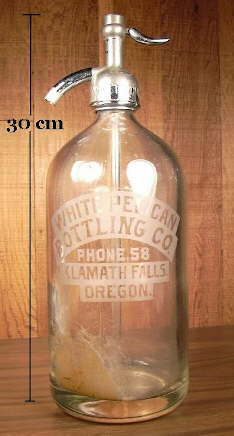 Hutchinson style bottle - A distinctive style of heavy glass bottle with a proportionally tall body, almost no neck, and a blob finish; see the photo to the right of a 1901 to 1910 Hutchinson soda bottle from Oregon (Fowler 1981). This style was used almost exclusively for soda and mineral water, though was rarely used for beer. See the Soda & Mineral Water bottles typology page for more information. Hutchinson stopper - An internal stopper composed of a stiff wire with a loop at one end (upper portion and external to the bottle) and a disk and rubber gasket on the other end (lower and internal to the bottle). The disk/gasket served as a seal between the liquid and the neck and was dislodged by pushing downward on the exposed wire loop (White 1978). Used almost exclusively on soda/mineral water bottles and rarely on beer bottles. To view an illustration of this stopper click Hutchinson soda bottle illustration. Improved pontil scar or mark - See iron pontil below. Improved or Improved-tooled finish - An alternative name for the tooled finish. Also a term for a type of tooled finish where some or all of the shape of the finish itself was obviously mold formed. The picture to the left is an improved-tooled finish on a ca. 1904-1915 Portland, OR. liquor bottle where the finish was mostly mold formed as indicated by the side mold seam extending well into the conformation of the finish (Thomas 1998). The term "improved-tooled" was apparently coined by Ronald Deiss, in his seminal 1981 MS thesis, to describe the entire category of tooled finishes. See the tooled finish section of the Bottle Finish Types & Styles page for more information. Ink bottle vs. Inkwell - The difference between an "ink bottle" and an "inkwell" is hard to define since they are both small bottles used as "containers for ink" from which a pen (or quill) was directly filled or dipped (Merriam-Webster Online Dictionary 2009). So what is the real difference? 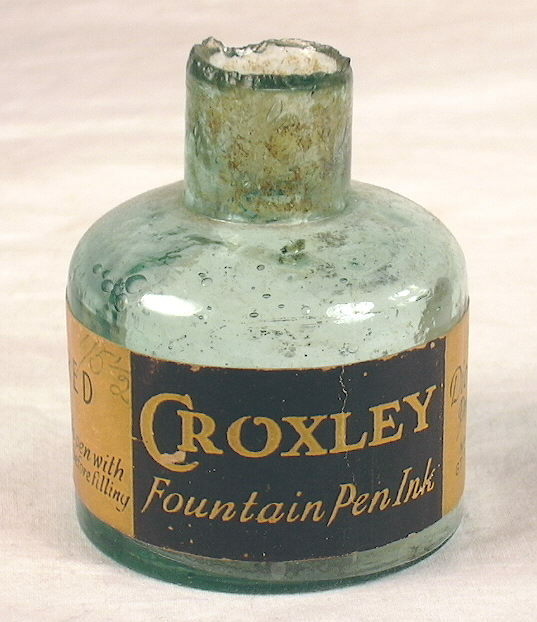 Although both were used in a similar fashion - to directly fill a quill or fountain pen - according to Munsey (1970) an "...inkwell was a permanent and decorative container that was a relatively expensive item", i.e., a specialty bottle. An ink bottle was of a more disposable utilitarian bottle nature and often - but certainly not always - discarded after use of the commercially produced contents contained in the bottle (Nelson & Hurley 1967). Put another way, inkwells were more decorative, typically purchased empty (like many liquor decanters), intended to be retained permanently until broken or of no use, and were filled over and over again from bulk sources. 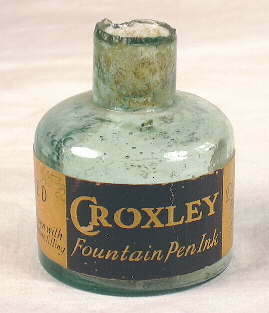 Ink bottles were sold commercially filled with ink and frequently tossed after use although the frugality of the times often dictated that ink bottles were frequently refilled (from a bulk/master ink container) and used over and over again like an inkwell (Munsey 1970; Covill 1971). In the end, the line is blurred between the two although both are covered as separate bottle "types" on the Household Bottles (non-food related) typology page. Inside threads - See screw threads (inside). This is a finish type that has the threads on the inside of the finish. Insweep (Heel) - See heel. See the General Bottle Morphology page. Iron pontil scar or mark - An iron pontil scar is the result of a red hot iron pontil rod being applied directly to the base of a bottle. The resultant markings are usually a circular (though sometime oval, square, or rectangular) ground mark that is often covered or embedded with a gray, black, or reddish deposit (ferric oxide) which is from the pontil rod itself. Also called a "bare iron pontil" or "improved pontil." It is also erroneously referred to in collector jargon as a "graphite" pontil mark based on the frequently gray appearance of the ferric oxide deposit. All types of pontil scars are highly variable in shape and appearance; it is suggested that a user view the page on Pontil Marks or Scars for numerous examples of the different types and variations of pontil scars. Irradiated bottle - This term is used to describe a bottle that has been treated with artificial radiation equipment to alter or intensify the color. For more information on the subject, please take a look at an interesting article on the subject by Dr. Cecil Munsey at the following link: http://www.sha.org/bottle/pdffiles/munseybottleirradiation.pdf Such methods have been used on various types of glassware also. 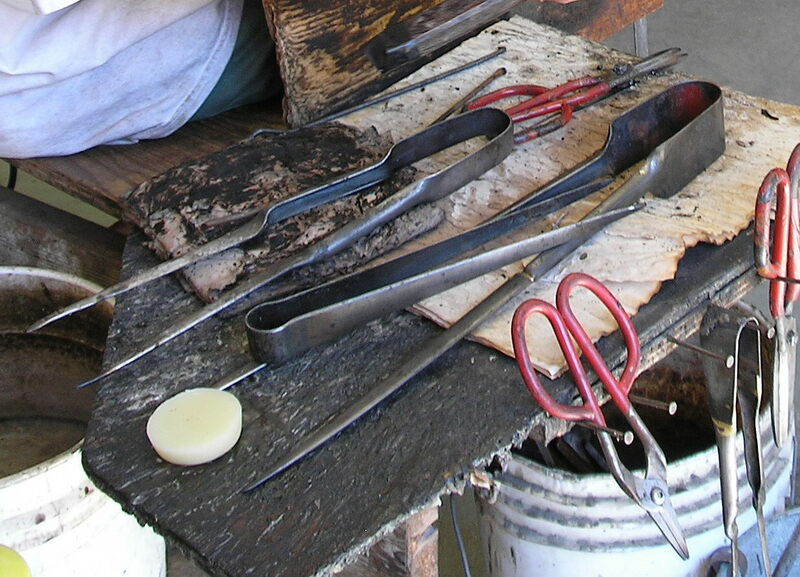 Jack (Jacks) - A highly versatile steel, or sometimes wooden, tong-like tool used almost like "fingers" to manipulate hot glass by the gaffer or other glassworkers. Used for neck and finish forming as well as holding or guiding any other tool that was hot. Jacks were also called pucellas or simply "the tool" (Kendrick 1968). Click jack use to view an illustration of jacks being used to form a bottle. Jar - As used on this site, a jar is a glass container used to contain a liquid or substance and which has a bore and/or neck which have a diameter that is close to or equal to the diameter of body. 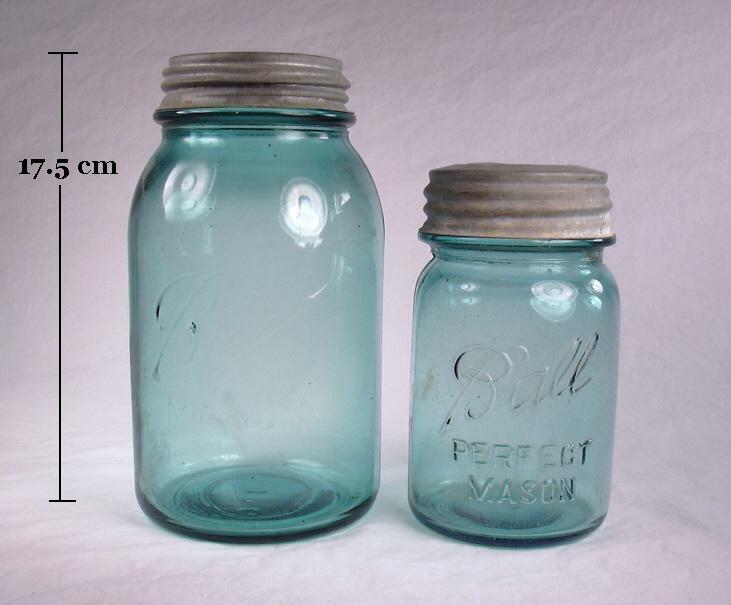 The Lightning canning jar to the left is a late 19th century canning jar which has bore/neck that is almost as wide as the bottle (also has a glass lid in place covering the finish/bore. Also see bottle above. Junk bottles - Early (18th and 19th centuries) glassmaker name for black glass ale, porter, beer, and cider bottles though these bottles were likely used for all kinds of bottled products. 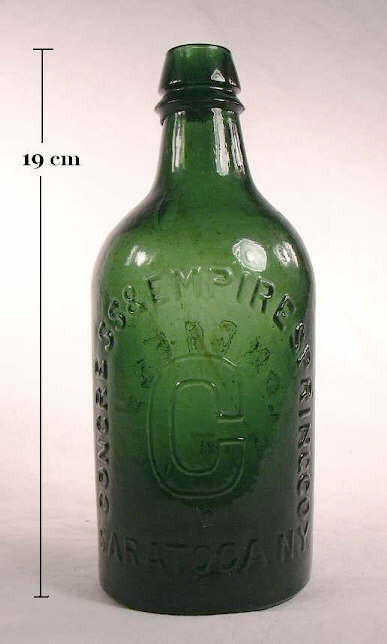 Click on New England Glass Bottle Company to see an example of an early (ca. 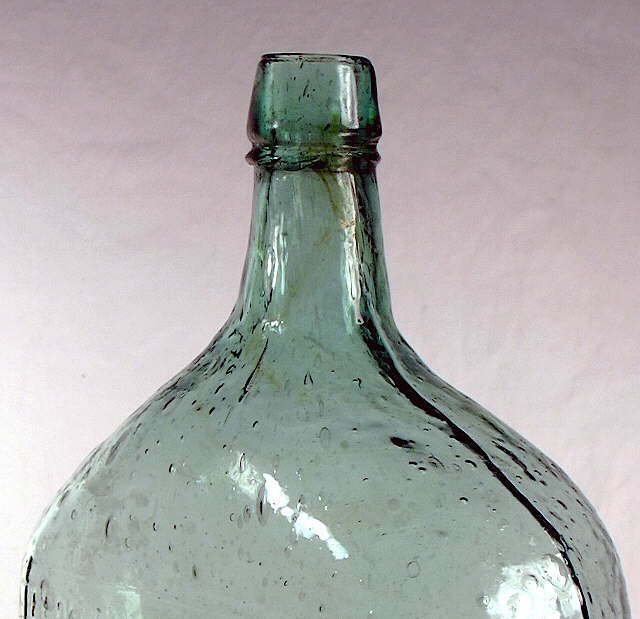 1830s) American made "junk bottle" (McKearin & Wilson 1978). Key mold base on a ca. 1865-1870 Pittsburg, PA. patent medicine bottle. 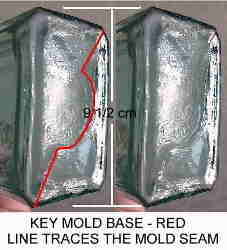 Keyed (key) mold - A variation of a two-piece hinge mold in which the bottom mold seam is not straight, but instead arches up at the middle of the base. Also called a "key mold" or "key molded base." This feature is better shown with a picture than described - see combination image to right. A common variation to the one pictured has a squared off instead of arched jog. Keyed bases are highly indicative of a molded bottle made between the late 1840s and the early 1870s and will often have a pontil mark superimposed over the mold seam, dating them prior to about 1860 (McKearin & Wilson 1978). This is discussed in more dept on the Bottle Bases page. Kick-up - See Push-up below. Kick-up and push-up are synonymous. Also called a "shove-up." See the discussion of push-ups on the Bottle Bases page for more information. Label or labeled only - This is a commonly used collectors term to refer to bottles that lack embossed lettering; the contents were originally identified by a "label only." This term particularly refers to bottles without some type of proprietary (commercial user of the bottle) and/or product (contents of bottle) related embossing, in that a bottle that has the volume capacity embossed (e.g., "12 OUNCES") is usually also referred to as "label only." 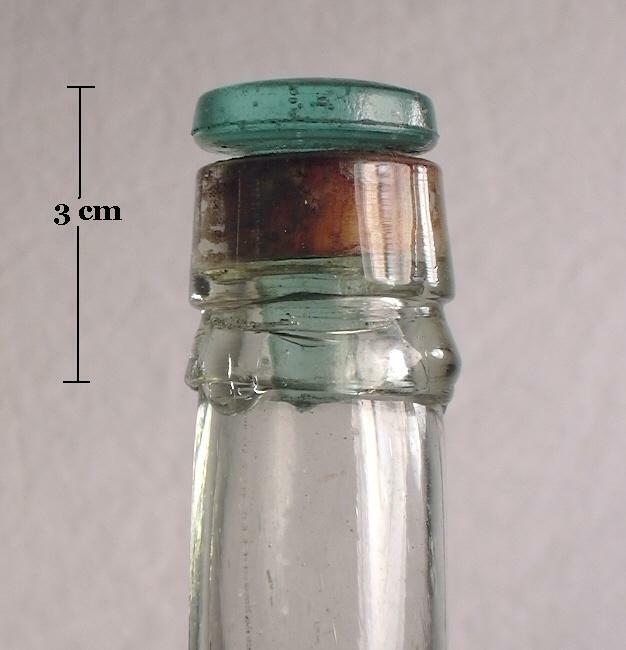 Some collectors (and a few archaeologists) also call these unembossed bottles "slicks", a term taken from the Western American slang term for unbranded cattle where the ownership is not evident. 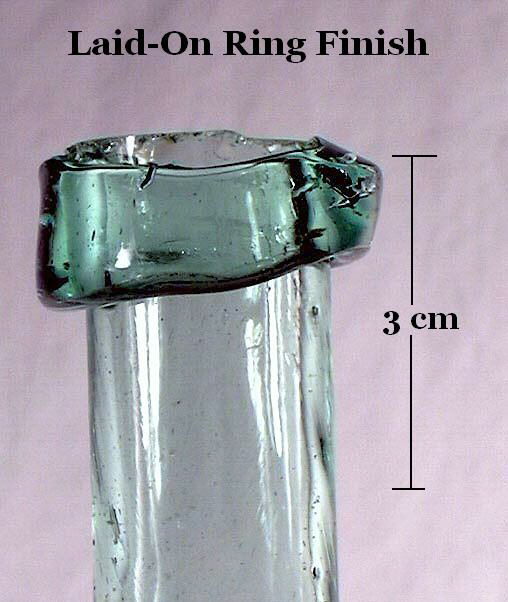 Laid-on ring - Ranging from crude to refined, this consisted of a glass ring or bead trailed around and/or slightly below the opening (bore) and fused to the bottle. It was added to strengthen the bore or neck (White 1978). See the laid-on ring discussion on the Bottle Finishes & Closures page. Lehr - This is the annealing oven or furnace in which the newly blown bottles were gradually cooled to enhance strength and reduce cooling breakage, aka annealed. A "cooling furnace" if that is not an oxymoron. Also called a "leer" or "lear" and the person how tended this part of the operation was known as the "lear tender" (Trowbridge 1870; Bridgeton Evening News 1889). Lightning closure - Also called a Lightning stopper. An external stopper which can be made of various materials (porcelain, metal, glass, hard rubber), with a rubber ring encircling it as a seal and held in place on the bottle by a bent wire attached to the stopper and anchored to the outside of the neck just below the upper or lower (lip or collar) finish parts (White 1978). A variation of this was used on the popular Lightning fruit jar in the late 19th and early 20th centuries. Click Lightning closure for a picture of a Lightning closure on a modern Dutch beer bottle showing that these type closures are still in use around the world. Lip - This is one of the more confusing and variably used terms used in reference to bottle morphology. As used on this site, lip has two meanings depending on the context, though both uses are better described with other terms. It is used to describe the extreme upper surface of the finish, though the term rim is preferred (both are often used together on this website). 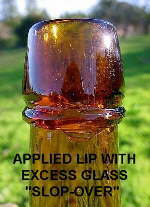 Lip is also used by some - and occasionally on this website as indicated by the illustration on the General Bottle Morphology page - to refer to the upper part of a multiple part finish (Jones & Sullivan 1989). The term is also frequently used as a shorthand reference for the entire finish, lip and collar together, i.e., a "bottle lip." However, for added confusion, the term collar is used by some to refer to what is called a lip here - the upper part of the finish or the entire finish if it is composed of only one part. See the Bottle Finishes page for much more information on finishes and finish parts. Lipping tool - A tool used to form the finish of a bottle. Also called a "finishing tool," "rounding tool," "necking tool," or "pressing tool" by glass makers (U. S. Patent Office 1875, 1893). 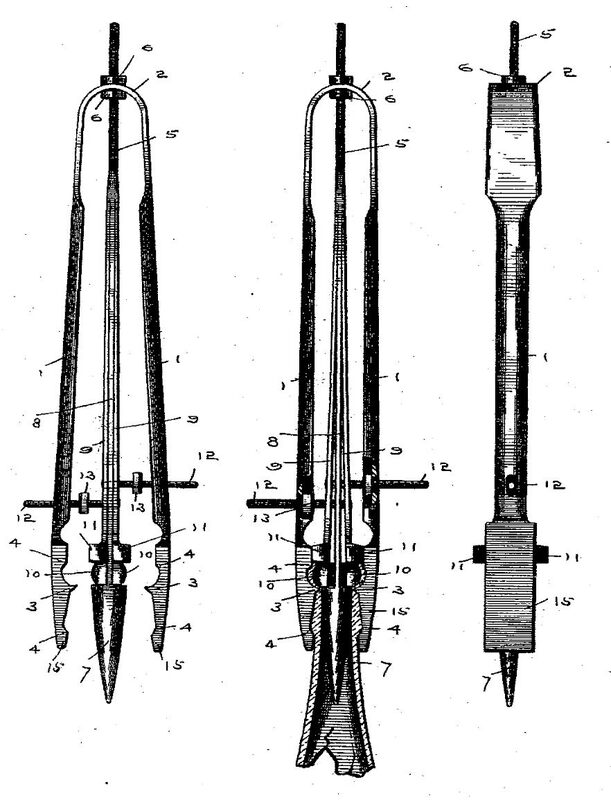 The illustration to the right is from an 1893 patent showing a typical lipping tool from different angles. The finish contact portions of these tools were sometimes designed to be interchangeable so that different size and styles of finishes could be produced with the same basic tool (Deiss pers. comm. 2003). Lipping tools are discussed in more depth on the Bottle Finishes & Closures main page. Machine-made bottle - Bottle produced by a fully or semi-automated bottle machine where the air pressure to shape the bottle is supplied by a machine. Also, used to mean having the diagnostic characteristics of a machine produced bottle, i.e., side mold seam through the top of the finish and usually on to the rim, ghost seams, separate mold seams below and on top of the finish, and a suction or glass cutoff scar on the base (Owens Automatic Bottle Machine only). See the Machine-made Bottles portion of the Bottle Dating pages for more information. Makers mark - Refers to embossing (or very rarely other types of marks) on the bottle that indicates what glass company actually produced it. These are most often, but not always, on the base, heel, or lower body of the bottle. Dr. Julian Toulouse's book "Bottle Makers and Their Marks" (1971) is the classic reference on the subject, though much clarifying and correcting information has been uncovered in the years since its publishing. (Toulouse was the former Chief Engineer and Manager of Quality Control for the Owens-Illinois Glass Company in the mid-20th century.) Markers marks are covered by its own sub-page on this web entitled Bottle & Glass Makers Markings. 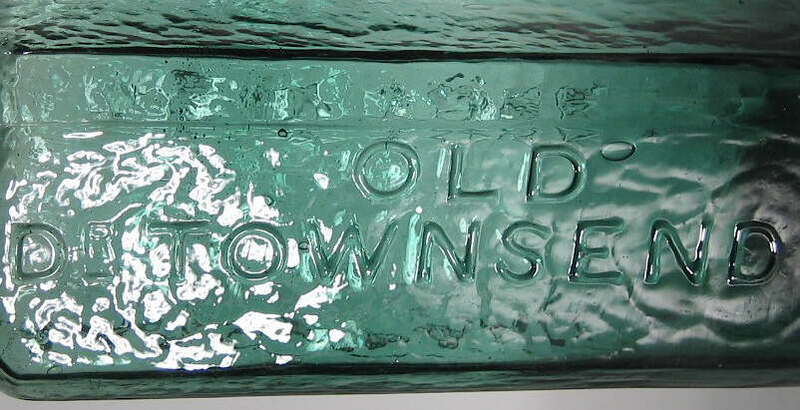 The picture to the right shows the makers marks for a 1941 bottle (beer) made by the Owens-Illinois Glass Company. 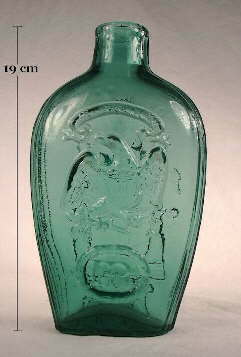 David Whitten also maintains an exceptionally useful website of bottle (and insulator) makers marks at this link: http://myinsulators.com/glass-factories/bottlemarks.html. Mamelon - The following description of a mamelon is from Jones & Sullivan (1989): "A rounded eminence, a small circular protrusion found on the basal surface, usually at the tip of the pushup. 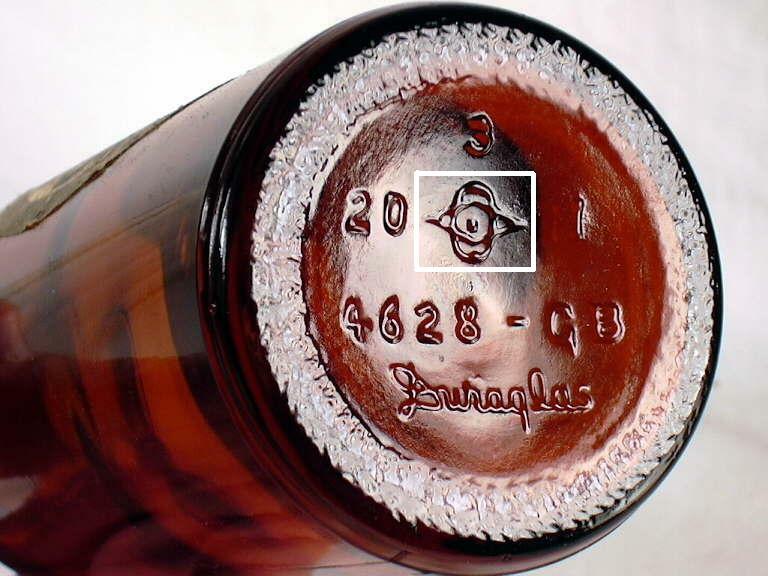 These may be a type of vent mark...On champagne bottles the mamelon is large and protuberant." 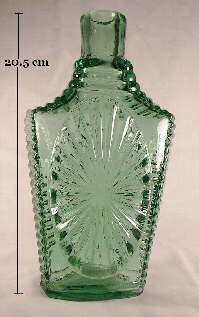 Click mamelon base for a picture of a early 20th century wine bottle that shows a mamelon in the center of the base. As noted, it is thought by some that the mamelon acted as an early form of air venting which facilitated the exit of the hot gases around the expanding bottle and allowed for a quicker and better "fit" of the hot glass to the sides of the mold (Boow 1991). The line between a mamelon and an embossed dot in the middle of an indented base (a common bottle base feature) is vague, although a mamelon would be more protrusive than a typical embossed dot, though both are formed the same way (by molding); mamelons are uncommonly encountered on free-blown and dip-molded bottles (Jones 1986). Marver - A metal or wooden table or slab - which was wax or oil coated for lubrication - on which the gob or gather of glass at the end of the blowpipe could be rolled to shape the bottle; a process called "marvering." The marver was also called a "chill" as that is what it did to gather of glass - cool it down to a more workable viscosity (Scholes 1952; Howard 1950). Some finishes on bottles could be formed, at least in part, by rolling the finish on the table while the base of the bottle was secured by either a pontil rod or snap case tool (Schulz et al. 1980). The process of using the marver as described is called marvering; click marvering to view an illustration of this process. Click Early 20th century mouth-blown bottle making film clip which shows the gaffers using a marver (left side of image) to pre-form the gob of glass prior to dropping it into the mold and expanding it. (Film clip is compliments of the Owens-Illinois Glass Company.) The term marver is a corruption of the French word for marble (marbre) which was what early marver table tops were made from (Trowbridge 1870). Mason shoulder seal - On the famous Mason style screw thread, the sealing surface was the shoulder just below the screw threads, not the finish rim. 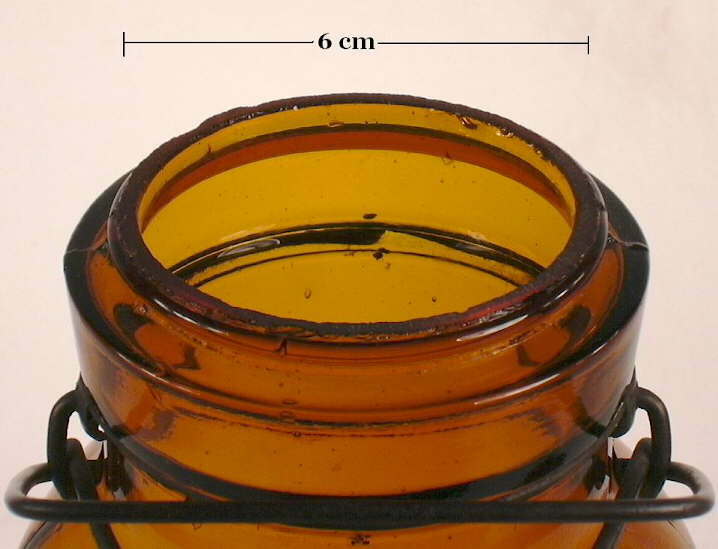 A rubber gasket was put on the shoulder between the glass and the metal lid and that combination achieved the sealing of the jar. 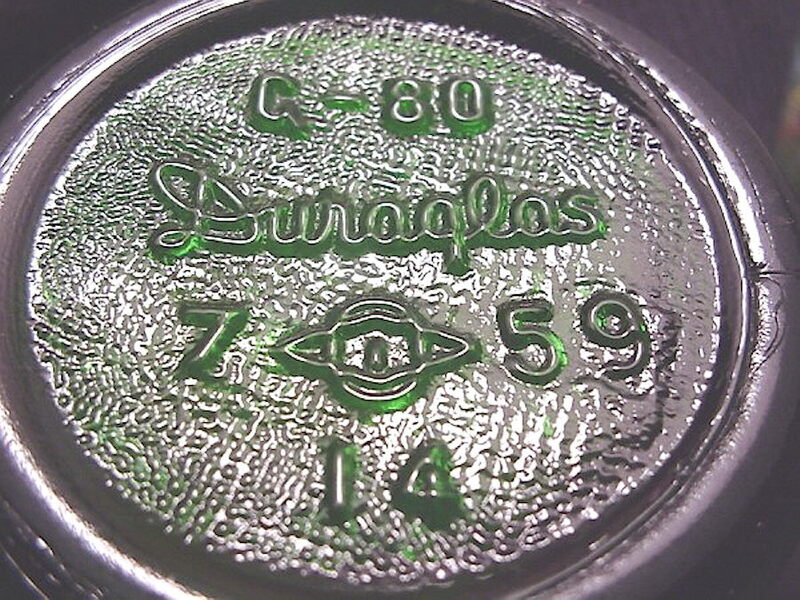 On the jar shown in the image to the right, the sealing surface would be just where the lower edge of the cap touches the short abrupt shoulder of the jar. 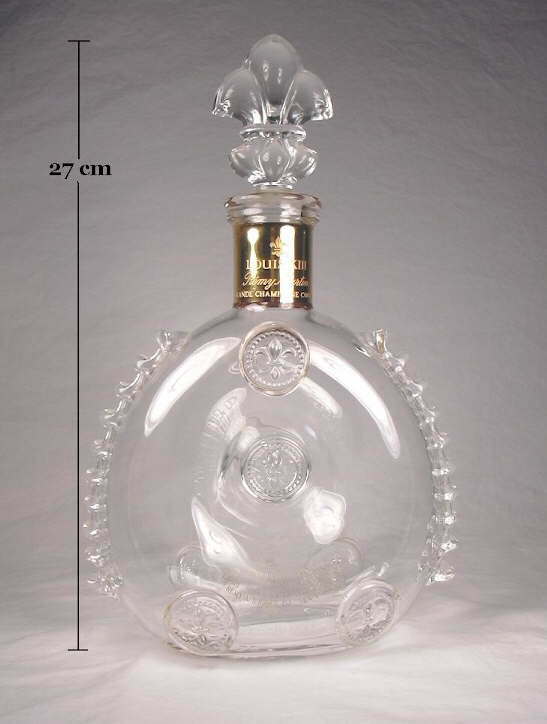 The Mason shoulder seal is discussed more on the Types of Bottle Closures page. Measuring mold - See parison mold below; an industrial term used to refer to the parison mold on an Owens Automatic Bottle Machine. On this machine, the parison mold did serve the function of measuring the proper amount of glass necessary for the particular bottle being made. Mechanical cleaning - A process developed over the past 30 years where a stained or patinated bottle is polished to its more or less original luster using a mechanical tumbler, tiny pieces of copper, and cleaning compounds in solution. Bottles having this done to them are referred to as "professionally cleaned" or "tumbled" by collectors. Metal - A glassmaking term for the glass itself, molten or solid but unformed. Moil - Residual glass remaining on the tip of a blowpipe after detaching the blown bottle (Kulasiewicz 1974). Mold (or "mould" in Canada/Britain) - Typically a metal (usually iron or brass - very rarely ceramic or wood) form with a hollow interior within which the molten glass is expanded to form the type bottle defined by the internal mold surface design. Some simple mold forms (i.e., dip mold or pattern mold), during the earlier years covered by this webpage, were used to assist the glassblower in shaping or patterning a bottle without being the absolute defining element. 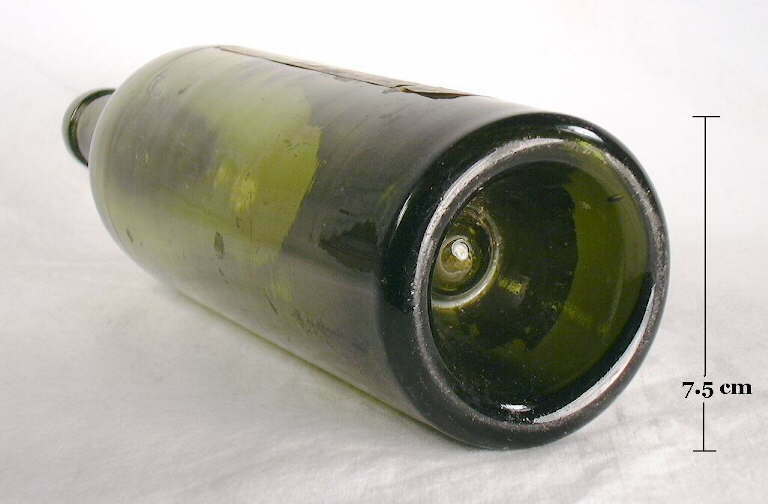 A bottle from a full mold is called a mold blown bottle. See the Glassmaking & Glassmakers page for illustrations of the different major mold types. Mold cutter - Presumed to be a 19th-century (possibly earlier) term for the workman in the glass works (or independent mold producing shop) who did the engraving on the inside of the mold which formed the indentations that caused the resulting embossing on the bottle itself. Also called a "chipper" (Owens-Illinois 1933). 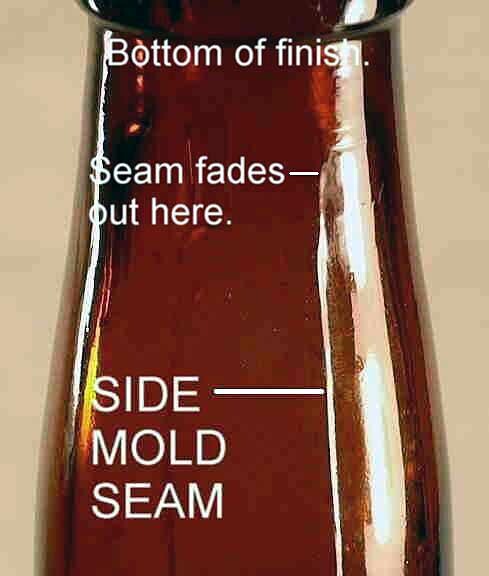 Mold seam(s) - Raised lines on the body, shoulder, neck, finish, and/or base of the bottle that are formed where the edges of different mold parts or sections came together imperfectly. (Shown in the image to the left.) Also called "mold line(s)" (White 1978) and in the glass industry - "joint-marks" or "parting lines" (Scholes 1952; Tooley 1953). See the General Bottle Morphology page. 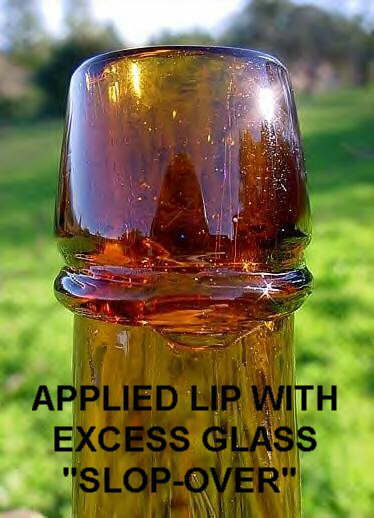 Mouth-blown bottle - A bottle which was not blown by a automated machine nor is press-molded, but is instead shaped (with or without a mold) via air pressure applied by mouth through a blowpipe. * Referred to also as a "hand-made," "hand-blown," or "hand manufactured" bottle. Early 20th century mouth-blown bottle making film clip. National Prohibition - In 1919, the the legal production and sale of alcoholic beverages was banned with passage of the 18th Amendment and the Volstead Act with the implementation of National Prohibition in January 1920. Repeal of the 18th Amendment came in December of 1933 with liquor required to only be sold in bottles; bulk sales in casks was prohibited in an attempt to exert tighter controls and prevent a resurgence of anything resembling the old time saloon. See the Liquor/Spirits bottles page for more information. Neck - The (usually) constricted part of a bottle that lies above the shoulder and below the finish. Some authors have considered the upper neck as part of the finish also since the upper neck was very often manipulated as part of the finishing process with mouth-blown bottles (Ketchum 1975, White 1978). However, for this web site the finish is considered to begin where the conformation of the upper neck abruptly or changes alters (usually increases in diameter) at the base of the finish. See the General Bottle Morphology page. Necking tool - See lipping tool. Neck-ring or Neck-ring mold - At its simplest, this is the "metal mold part used to form the finish on a hollow glass (bottle) item" made by a semi or fully automatic bottle machine (Tooley 1953). More specifically, on blow-and-blow machines this is the portion of a mold that held the parison in the parison mold and to mechanically transfer the parison to the second blow mold, where it also formed part of the mold. 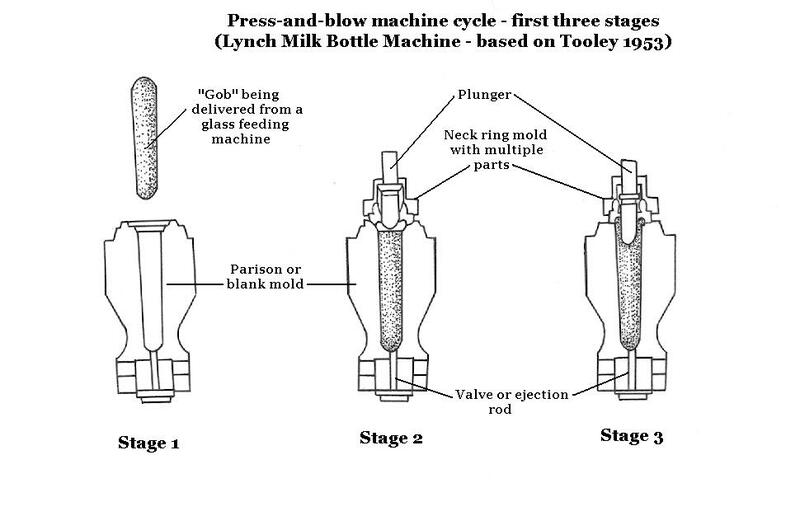 It also performed this function on some press-and-blow (p&b) machines (like the Miller Press and Blow Wide Mouth machine) although on other p&b machine types (like the Lynch Milk Bottle machine - first illustration, second illustration) the neck ring was simply the guide for the pressing plunger and was not used in the transfer of the parison to the blow mold; a process instead performed by mechanical transfer tongs (Tooley 1953). Non-continuous thread or screw-thread - See screw-thread (outside) below. Opalescence - A glass weathering trait caused by moisture on the glass surface leaching out or dissolving the soda within the glass and depositing it on the surface of the bottle (Scholes 1941). Also referred to as devitrification. Opalescence may take the form of nacreous ("mother of pearl"; see the image to the right) discoloration or whitish, scale-like patina (White 1978). See patination. Open mold - A type of bottle mold which formed the base, body and usually (depending on the era) the shoulder and most/all of the neck. The finish was not formed at all by the mold itself, but rather by the tooling of the reheated terminal neck glass or post-blowpipe applied finishing glass. This is as compared to an closed mold where the base, body, shoulder, neck, and some/all of the finish conformation was at least molded in part. References (primarily Kendrick 1963) that use these terms are somewhat confusing. Among other questions this author is not sure if a dip-mold is considered a primitive open mold? Whether a closed mold is a pertinent term for both mouth-blown molds and machine molds that form most of the form of a bottle? Also, whether a "full-size" mold (McKearin & Wilson 1978) is the same as an open or closed mold? Generally, neither term is used on this website; instead, the specific types of molds, finish, and other molding details are used. Open pontil mark or scar - A collector term for what is more accurately called a glass-tipped or blow-pipe pontil scar. The image to the left shows a very distinct example of this pontil type. 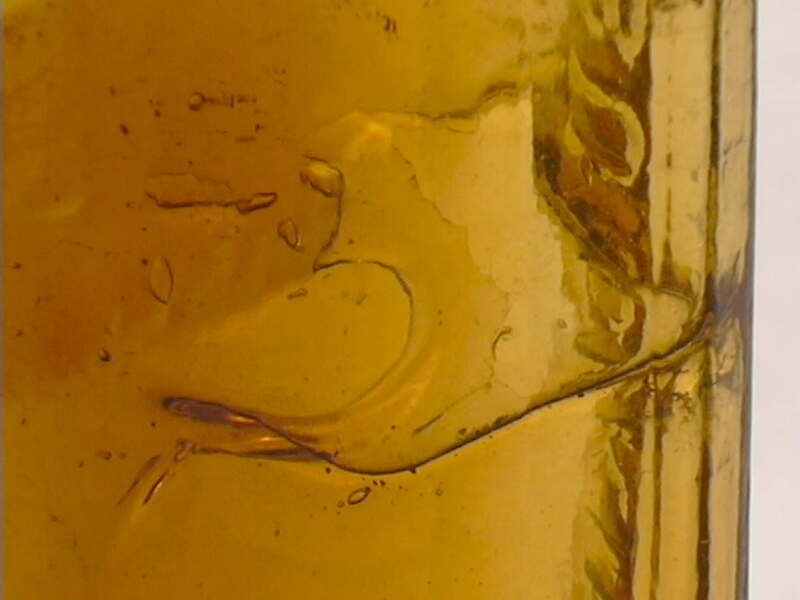 This is the glass scar left on the base of a bottle by a glass tipped pontil rod (or equivalent) when it is removed. All pontil scars are highly variable in shape and appearance. It is suggested that a user view the pontil scar/mark section of the Bottle Bases page more information and pictures of different types and variations of pontil scars. Orifice (Bore) - See Bore. See the General Bottle Morphology page. Owens Automatic Bottle Machine - The first fully automatic glass-blowing machine patented in 1904 (applied for in 1903) by Michael Owens of the Libbey Glass Company, Toledo, Ohio. This proprietary machine gradually dominated production in the early 20th century, producing about 50% of all glass containers in the U.S. by 1917 (Barnett 1926). 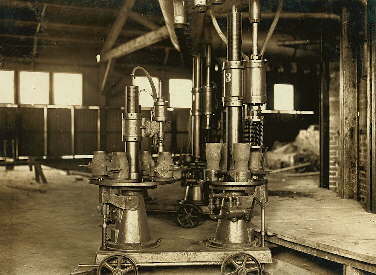 The Owens machines, which used suction to draw the glass into the mold, were gradually overshadowed by more efficient "gob feeder" (gravity flow glass feeding) machines beginning in the late 1910s and 1920s. Owens machine production declined gradually, producing about 30% of the total American production in 1947 (Miller & Sullivan 1981), to the end of use in 1982 (Miller & McNichol 2002). The Owens machine was patented on August 2nd, 1904; click Owens Patent to view the actual 1904 patent drawings and descriptions. 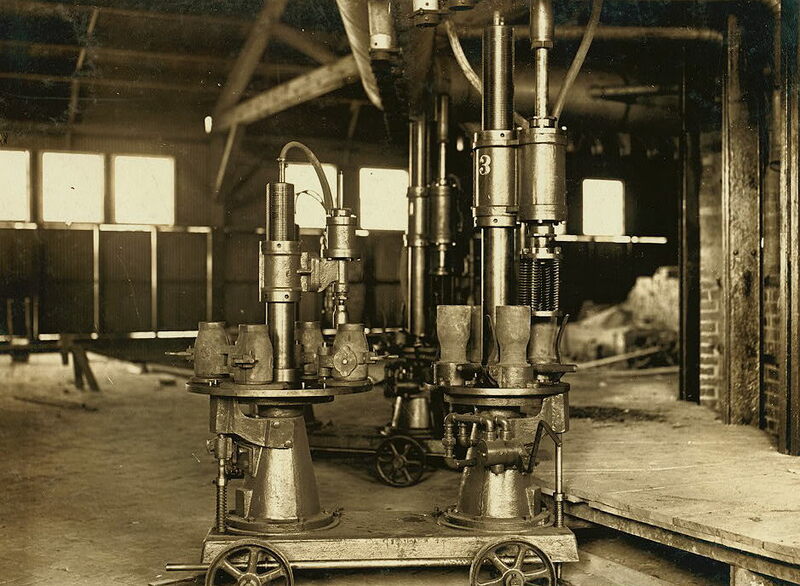 A picture of the Owens Bottle Machine #6 is to the right (from Walbridge 1920). Film clip of an early Owens Automatic Bottle Machine in operation. Packer - An industry term used to indicate either wide-mouth or narrow-mouth containers, particularly those made for the pharmaceutical or food-packing industries. It was apparently meant to indicate stock containers lacking distinct designs or embossing (Schulz et al. 2016). Also see utility bottles. Painted label - See Applied Color Label (ACL) above. Panel or Paneled - These terms have several meanings. According the the Merriam-Webster OnLine dictionary, panel is "a separate or distinct part of a surface." Kaiser (2009) noted a panel was a "section of a pattern or design with raised margins and square corners." For bottles, panel or paneled usually refers to the flattened sides of a bottle, i.e., a square bottle being a "paneled bottle." The druggist bottle at this link - J. A. LOGAN - has a flattened "panel" with embossing. The flattened panels may also be indented (aka inset or sunken) and are commonly seen on square or rectangular bottles. These panels typically contained the label or the proprietary embossing. The two aqua proprietary medicine bottles pictured below right have indented panels. An alternative meaning of panel is in reference to the removable plates in a plate mold that allowed the same mold to be used for differently embossed proprietary bottles (White 1978). Parison (aka "paraison") - An inflated gather of glass which is not yet the finished bottle. The term is applicable to both mouth blown and machine-made bottles. 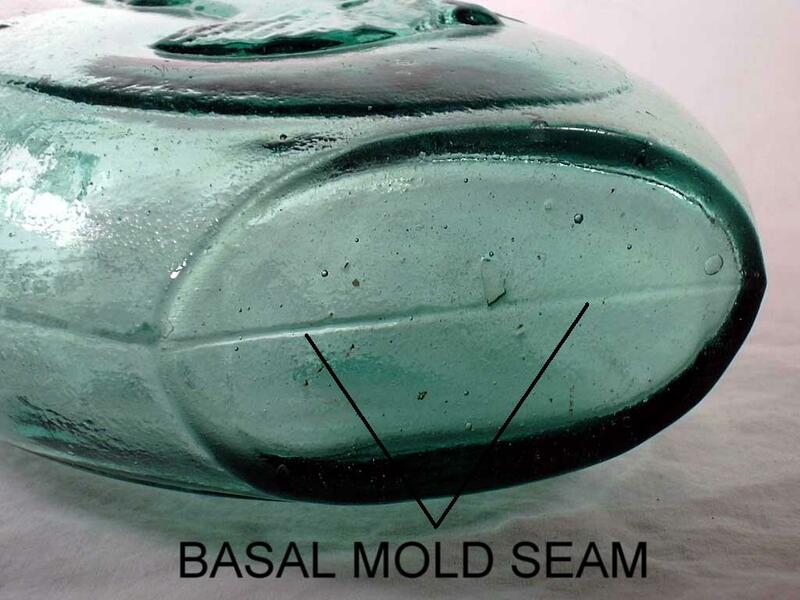 With mouth-blown bottles, a parison is the early expansion of the gather (gob) of glass which is then placed in the mold for final expansion to the mold induced form. With machine-made bottles the gob of glass is sucked (Owens Automatic Bottle Machine), placed, or dropped (other semi and fully automated machines) into the parison mold which forms the parison. In the machine process, a parison is a preliminary bottle shape with a fully formed finish and a partially formed body. The parison is then automatically transferred from the parison mold to a separate blow mold for final blowing/shaping of the bottle body. Parison mark - See baffle mark. Parison mold - Also known as the blank mold, block mold (on a press-and-blow machine), or on an Owens Automatic Bottle Machine it was sometimes called a measuring mold (Tooley 1953; World Book Encyclopedia 1958; Miller & Morin 2004). Sometimes spelled "paraison" (Hunter 1950). This is the preliminary bottle forming mold on all automatic bottle machines which transforms a gob of glass into a preliminary bottle shape with a fully formed finish (lip) and a partially formed body. The parison mold on a blow-and-blow machine was made of two or more parts (not including the neck-ring mold which was really also one of the parts comprising the parison mold). This formative bottle was then automatically transferred to a blow mold for final expansion to shape of the finished product. On the Owens machines the parison mold was apparently sized to measure the glass being sucked out of the glass pot below, thus the term "measuring mold." Parison molds were unnecessary with mouth-blown bottles where only one mold was used, although that mold usually had two or more parts. See the Glassmaking & Glassmakers page for more information. 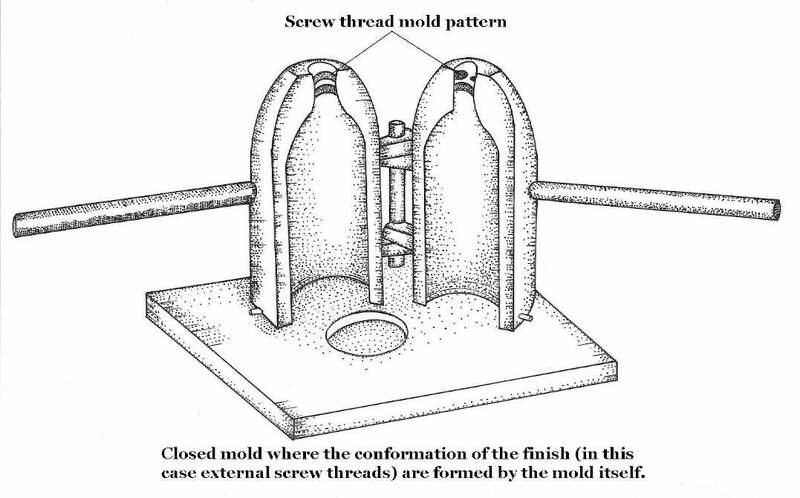 The blank (parison) mold concept was the revolutionary invention (patented in 1882) of Philip Arbogast of Philadelphia, PA. although the implementation of the blank mold - which forms the "finish" of the bottle - was not realized until the 1890s with the first semi-automatic machines (Howard 1950). 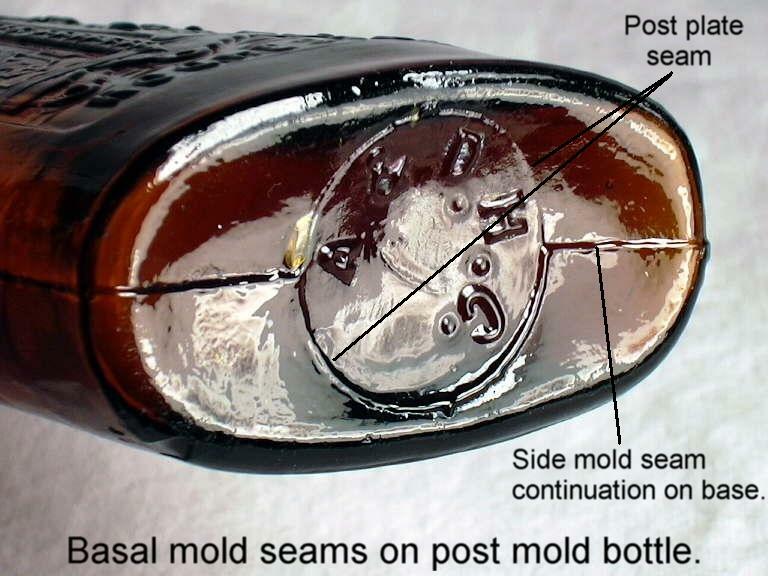 Parison mold seams - The mold seams that are formed on the surface of the bottle by the mold part interfaces (joints) of a semi or fully automatic machines parison mold. These can include the ghost seams on the sides and a suction scar like mark on the base of machine-made bottles. Parting lines - See Mold seams above. Paste mold - See turn-mold below. Patination (patina) - The surface of glass will react variably, albeit slowly, to the natural chemical processes of decomposition in both water and the earth. This process of weathering is called patination. The results of this decomposition is a crust or other glass surface alteration with is referred to as a "patina", "sick glass", or simply "stain." Also called "weathering" in the glass industry (Scholes 1941). Some glass is more prone to patination than other glass and some environments produce patination more readily than others. Thus, the presence or absence of patination does not imply anything about the age of the glass. This effect is also called stained, opalized, opalescence, iridescence, or devitrification by collectors (Tooley 1953; Kendrick 1963; Dumbrell 1983). 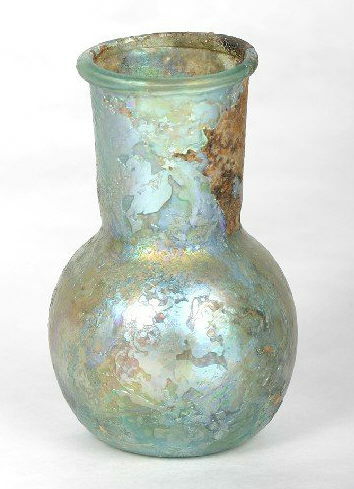 Click on this link - ancient Roman bottle - to view an ancient (1700+ years old) bottle with obvious patination which corroded the surface of the bottle. 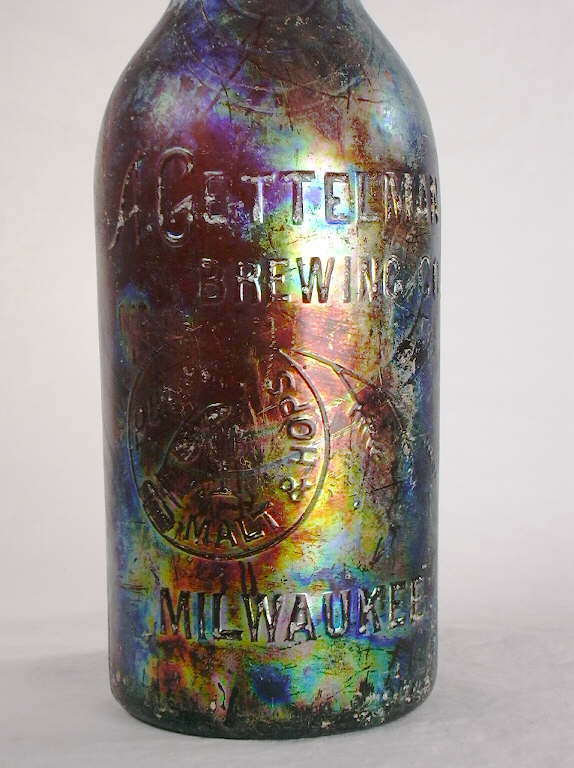 Click A. Gettelman Brewing Company to view an early (1910s) machine-made, export style beer bottle that has a rainbow patination that is actually quite esthetic. Patination is discussed in more length on the Bottle Body Characteristics & Mold Seams page. Pattern mold - A type of partial and less than full sized mold (typically a dip mold) with lines or "patterns" engraved on the walls in which a somewhat inflated gob or gather of glass is placed to give the bottle a general shape and the surface a pattern. The bottle is then removed from the mold and further expanded to form the final dimensions of the bottle. 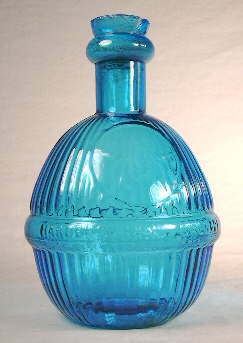 Click Pitkin type flask to see a picture of an American bottle produced in a patterned dip mold. See the Glassmaking & Glassmakers page for more information. Pitkin flask - A somewhat generic name for a class of early American (1790-1830) ribbed body flasks made using the German half-post method. An example from ca. 1800-1820 is shown to the right. These flasks were formed by expanding an otherwise free-blown bottle with a pattern mold. Though Pitkin flasks were most definitely made at the Pitkin Glassworks in Pitkin, Connecticut (1783-1830), many or most were made at other New England, Midwestern (primarily Ohio), and Eastern Seaboard glass houses during the period noted (Buckley 1985; Noordsy 2003). Plate mold - Mold that accepts a plate engraved for embossing on a bottle. Also known as a slug plate which is a collector originated term for a plate mold. These type molds allowed for the interchanging of plates with other engraved embossing to make uniquely embossed bottles for another customer. Plate molds made proprietary (i.e., unique to a specific business) bottles affordable since an expensive, unique mold did not have to be made for each bottle customer - only an engraved plate costing a few dollars. 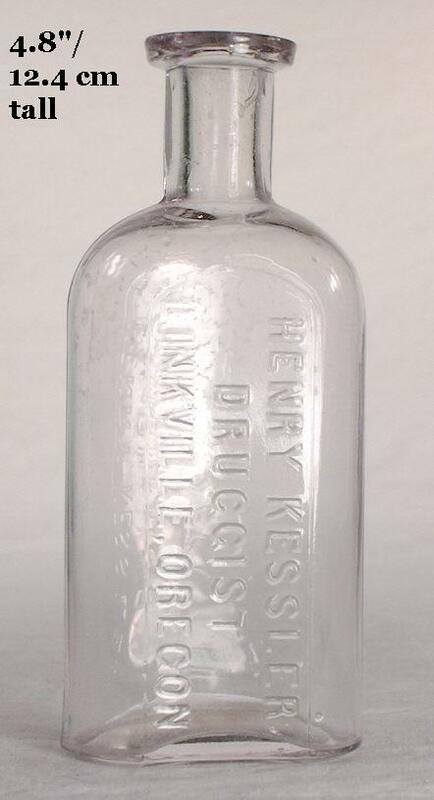 Click plate to see a picture of an actual early 20th century mold plate for a druggist bottle. On square or rectangular bottles a plate is sometimes referred to as a "panel" (White 1978). Also, see the General Bottle Morphology page. Pontil rod - An long iron rod which is attached to the base of the hot bottle to hold it while finishing. Also called a punt, punte, ponty, pontee, or punty. Post-bottom or Post-base - This is a bottle base configuration formed from a mold bottom plate which was shaped like a very short "post" projecting into the mold forming most - but not all - of the base of the bottle. The mold types which produced this base orientation are referred to as a "post-bottom mold" (Toulouse 1969b; Munsey 1970) or "post-base mold" - both terms are used on this website. Bottles formed with this type mold have a circular mold seam mark fully within the outside diameter of the base, even on square or rectangular bottles. The side-seams of a bottle formed in this type mold extend around the heel of the bottle and onto the base to merge with this post seam. 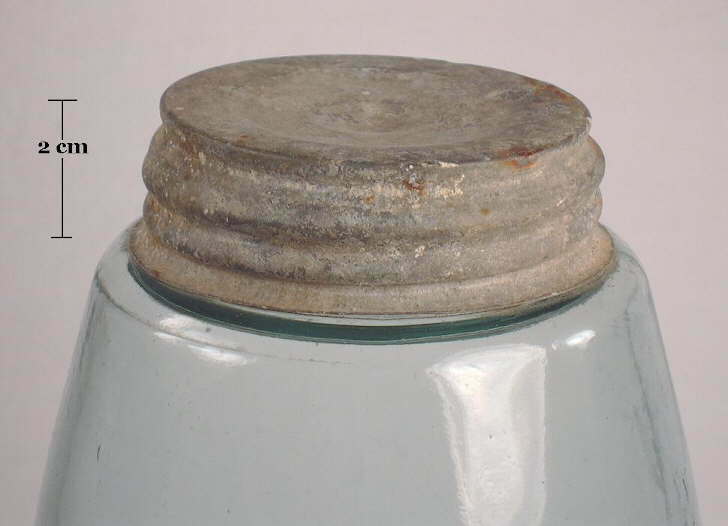 Click Warner's Safe Tonic base for a picture of a post mold base. The utility of the "post" in this type mold was as a self-centering mechanism for the other two large heel/body/shoulder/neck forming portions of the mold. This feature was most commonly used from the early 1890s and before; it is uncommonly seen on bottles produced after the mid-1890s (with some bottle type specific exceptions, e.g., beer and some soda bottles). Chronologically, this type mold was used more commonly before the cup-bottom or cup-base mold, but that is variable depending on the type of bottle. See the Bottle Bases page for an illustration of a post bottom mold and for more information on the subject. Post-bottom mold (post-base mold) - See entry above. Pot - The ceramic/clay container or crucible in which the batch is placed to be melted in the furnace to form glass. Pots during mouth-blown bottle manufacturing days were reportedly from 32" to 54" in diameter and about 2.5' tall (Bridgeton Evening News 1889). Potstone - Primarily a collector term for un-melted sand or silica grains imbedded in the glass. Also called (somewhat awkwardly) a "non-glassy inclusion" by some archaeologists (Jones & Sullivan 1989). Called stones or "knots" by glassmakers in the 20th century (Scholes 1941) or "sandy glass" (Bridgeton Evening News 1889). 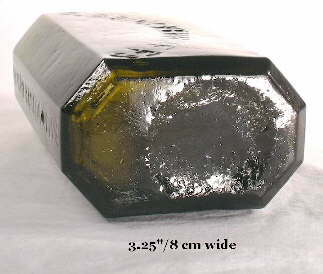 Click potstone to see a large one in the shoulder of an 1870s medicine bottle; see stones below. Pressed laid-on ring - Fruit jar terminology for a type of applied finish that was used primarily on wax sealer canning jars. This finish was formed by shaping the applied glass into shape with some type of pressing tool, which may have been hand or foot operated (Toulouse 1969a). The example of this style of finish pictured to the right is on an 1870s era canning jar blown in San Francisco, CA. These finishes are discussed more on one of the Bottle Finish Styles pages. Press-and-blow process - A machine-made bottle forming process or cycle where the parison is mechanically "pressed" in the parison mold by a piston or plunger, but blown in the second blow mold. (Click on the following links to see illustrations of this type of machine cycle for a Lynch Milk Bottle machine: first illustration, second illustration.) Most often used for glassware, but used for much wide mouth bottle production (e.g., milk bottles, fruit jars). Most (possibly all?) 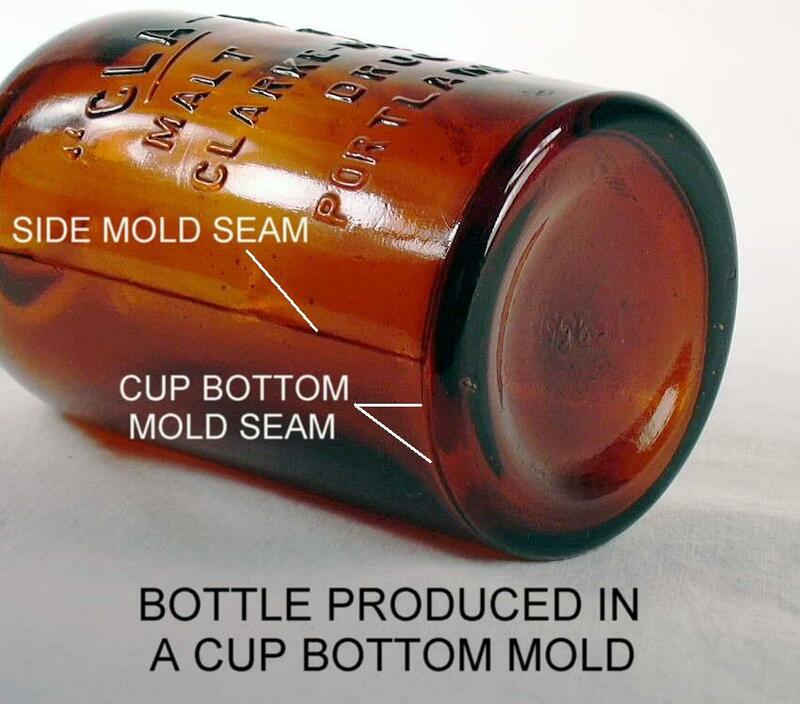 press-and-blown produced bottles and jars have a valve (aka "ejection") mark on the base and lack ghost seams since the parison mold was of a dip mold conformation, i.e., one-piece with no side mold seams (Miller & Morin 2004). Also see the blow-and-blow process. Click press-and-blow machine to see an image of a 1908 machine with that used that cycle. The first production bottles known to have been made on semi-automatic press-and-blow machines were wide mouth Vaseline bottles made by the C. L. Flaccus Glass Co. (Beaver Falls, PA.) in 1894 (Lockhart et al. 2007d). See the discussion on this process on the Glassmaking & Glassmakers page. 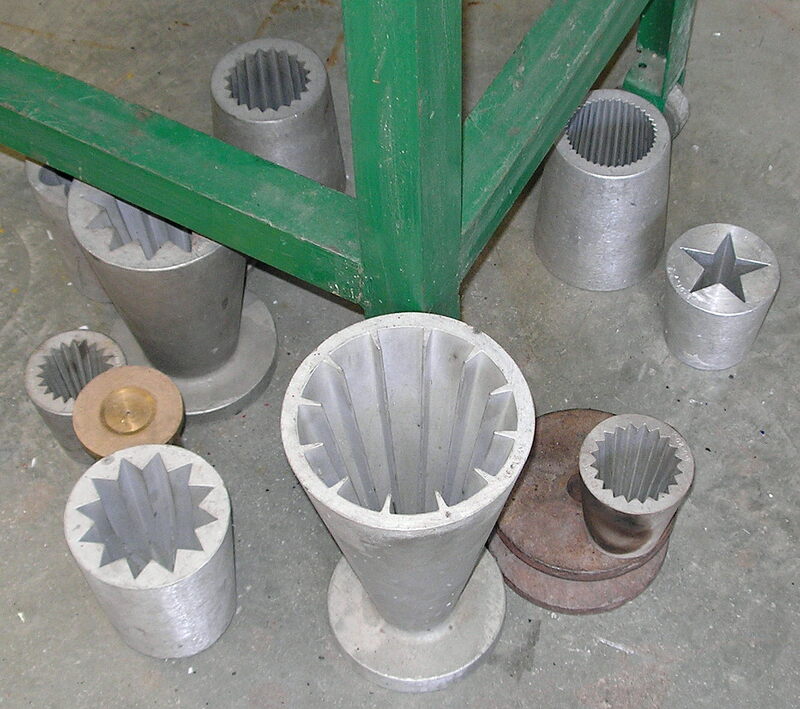 Press molding - A process used in the manufacturing of primarily tableware; rarely used solely for the production of hollow ware, with the exception of some types of wide-mouth jars. The following is quoted, in part, from Jones & Sullivan (1989): "Sufficient hot glass to make the object is dropped into a mold...the only limitation being that a plunger must enter and leave it without the mould being opened...A plunger is introduced, forcing the hot glass into conformity with the mould. The glass takes the form of the mould on its outer surface, while the inner surface is shaped by the plunger. The plunger is withdrawn and the object removed from the mold..." See press-and-blow process above. Pressure ware - Glass makers term for bottles that were designed (e.g., thicker glass) to withstand the internal pressure of the carbonated contents, primarily beer, soda, and champagne (Glass Industry 1959). Proprietary bottles - Bottles with the company and/or product name of the user (purchaser and filler of the bottle) embossed on them. Applicable to all classes or types of bottles, but particularly common in bottles made for druggists/pharmacies, re-useable soda, beer, and milk bottles, liquor bottles, and for patent medicines. 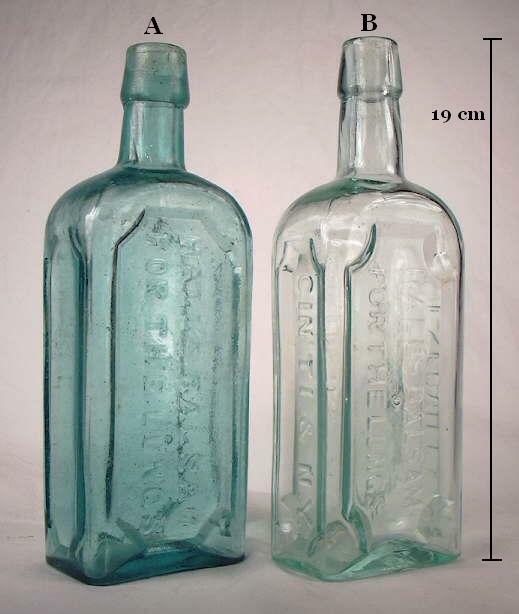 The bottle pictured to the left is a "Philadelphia Oval" style druggist bottle with proprietary embossing (next item) that dates from the late 1880s. See proprietary molds discussed below. Proprietary embossing - The embossing on proprietary bottles (see above) which includes the company and/or product name of the user (i.e., purchaser and filler of the bottle). This term is used frequently on this website. The druggist/pharmacy bottle pictured to the left has very typical proprietary embossing for that type. Proprietary mold - A complete bottle mold that was special ordered, owned (usually) and used by just one customer for their specific product. Due to the expense of creating an entire mold, proprietary molds were generally used by a minority of bottle customers and then often the largest customers who sold enough bottled products to justify the making of molds (often more than one) and/or wished a distinctive bottle design. 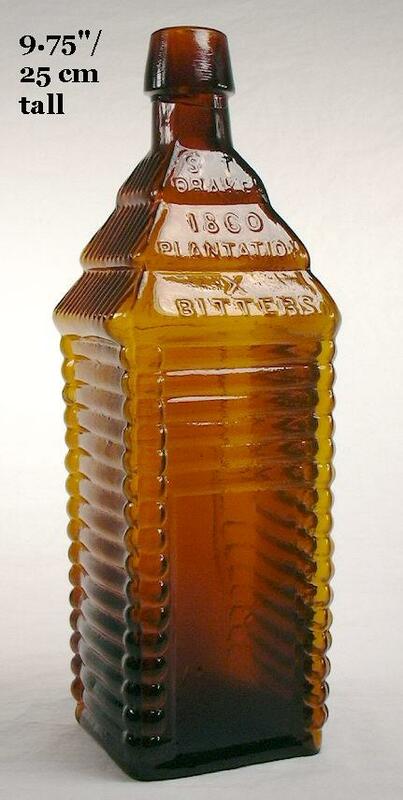 For example Drake's Plantation Bitters - an extremely popular product bottled in a distinctive cabin shaped bottle in the 1860s to 1880s - were produced in scores of different proprietary molds during that time frame. However, a majority of customers for bottles used either the generic bottles produced in mass by bottle companies (and labeled them appropriate to the product contained) or used plate molds where customer specific embossing could be added - and removed - via the plate, making the bottle quasi-proprietary to that customer. Prunt - See blob seal. Punte, Puntey or Punty - Usually an alternative glassmaker terms for a pontil rod; see that definition above. The term was sometimes also used more generically to include any rod used to hold the base of a bottle for finishing, i.e., including snap or snap case tools(Bridgeton Evening News 1889). Punt - A punt is an alternative term used in the wine world for kick-up or push-up (next item). See this external website for more information: http://www.cellarnotes.net/punts.htm The term punt is also used by some to describe a makers mark. 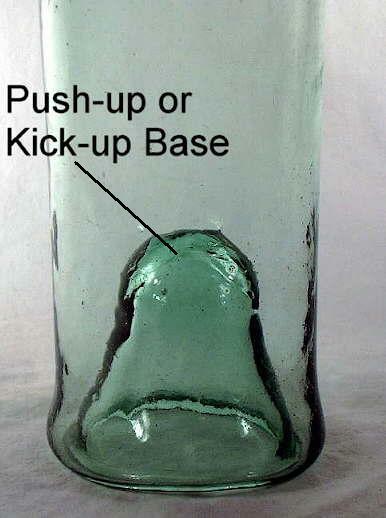 Push-up (kick-up) - A push-up is a steep rise or pushed-up portion of the base which somewhat reduces the interior volume of the bottle, though it was done primarily for strength enhancing, stability, and possibly content sedimentation (Jones 1971a). A very deep (tall) push-up is shown in the image to the right. The term kick-up is synonymous with push-up and both terms may be used interchangeably on this website. Some glassmakers also called it a "shove-up" (Illinois Glass Co. 1906). See the Bottle Bases page for more information. Another alternative name is punt. Pyroglazing - See Applied Color Labeling (ACL) above. Quatrefoil - The impression left in the top of a push-up by a pontil-like rod having its end divided into quadrants (Jones 1971a, White 1978). It appears that the pontil rod and push-up rod were often the same tool. 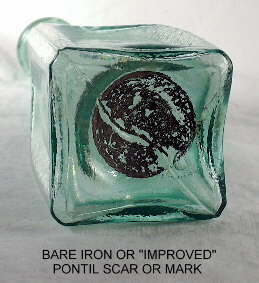 The push-up base pictured to the right has some impression of a quatrefoil type rod; see pontil scar or mark portion of the Bottle Bases page. Re-firing - "Also called re-heated. Generally speaking this refers to the re-application of heat to the partially finished bottle. It is often used to described the application of heat to the finish and/or neck of a bottle to facilitate finishing and finish tooling. 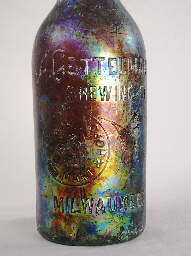 Reproduction bottle - A term used to refer to bottles made many years after the original bottle was made, usually for decorative reasons, but occasionally for commercial reasons (i.e., they were produced to contain a specific product). Reproduction is also used to refer to bottles that are actually adaptations, i.e., they imitate certain types of old bottles in general but not precisely, aka "fantasy bottle" (McKearin & Wilson 1978). The numerous products of the Clevenger Brothers Glass Works (now out of business) and Wheaton Glass Company (aka Wheaton/Nuline) fall into both classes - reproductions and adaptations. Reversing - This was the term used by glass makers to refer simply to the process where a mouth-blown bottle - or other blown glass item - had the pontil rod affixed to the base (or later grasped with a snap case tool) and the blowpipe severed from the item (Trowbridge 1870). Ribbing - Protruding ridges on bottles produced either by the use of molds, or rarely, by tooling (White 1978). Ribbing may be either vertical or horizontal; for an example of horizontal ribbing click Old Sachem Bitters and Wigwam Tonic (photo courtesy of Jeff Noordsy Antiques). Rigaree - Parallel lines of ribbons added as decoration to the sides of bottles and glassware (White 1978). Click on Remy-Martin cognac decanter to see an example of a modern bottle with rigaree decorations on the sides. Rim - The extreme upper surface of the finish where the bore (throat) begins. 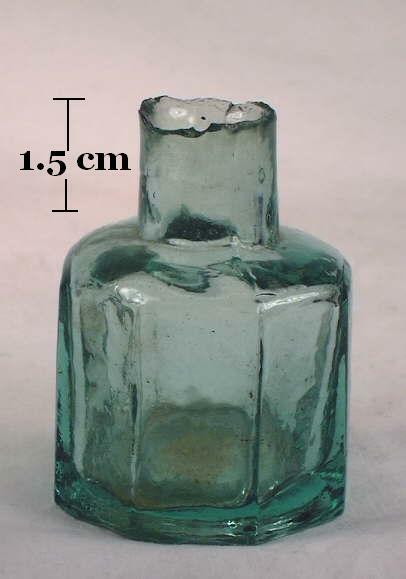 Simply put, it was the topmost portion of a bottle or jar; this is shown in the image to the left. Also called the lip by some. Ring (1) - Alternative name for the lower part (or collar) of a two or more part finish if it is narrow and rounded on the outside (resembling a glass "wedding band" or ring at the base of the finish). See collar above. 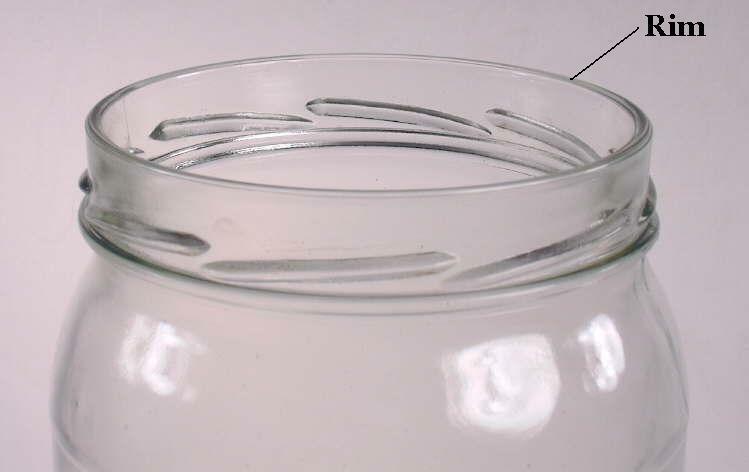 Ring (2) (aka pot ring, gathering ring) - A refactory (i.e., capable of withstanding high temperature) ring floated on top the melted glass to provide a clean surface from which glass can be gathered. By extension, a shorthand measure for the number of working ports in a glass furnace or factory, i.e., a factory with "ten rings" had either ten pots or a tank with ten ports (ring holes). Ring hole - An opening in the glass tank ring from which glass is gathered. Ring iron - The 19th century (or earlier) English term used for the metal tool used to apply hot glass to the neck of a bottle to facilitate the formation of the bottle finish. The French term for the same tool was "une légère tringle de fer" (light iron rod) and dates back to at least 1772 (McKearin & Wilson 1978). Ring mold - The neck forming and holding portion of a machines parison mold. The ring mold also holds the bottle for transfer from the parison mold to blow mold forming a part of that latter mold also. See neck-ring mold discussed above. Rolled finish - Once the blowpipe was removed from the bottle, the hot glass at the removal point was rolled or folded into the neck terminus (rarely folded out) to form and smooth out the top of the finish and to provide strength. 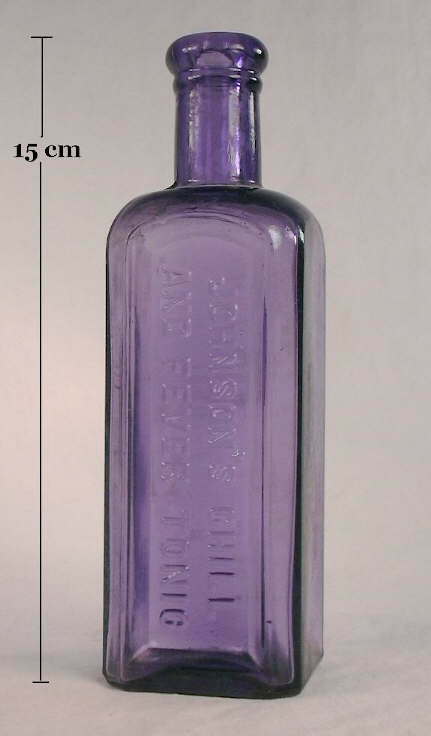 The image to the right is of a Dr. Jaynes Hair Tonic bottle with this style of finish, which dates from the 1850s. This finish is most common on medicinal and food bottles dating from the 1870s and before. Click rolled finish for a description of this manufacturing method on the main Bottle Finishes & Closures page. Round bottom - (aka round bottom soda, ballast bottle). A type of bottle - usually soda or mineral water - that has a rounded base making it impossible to stand upright. Click round bottom soda to view a picture of an example. 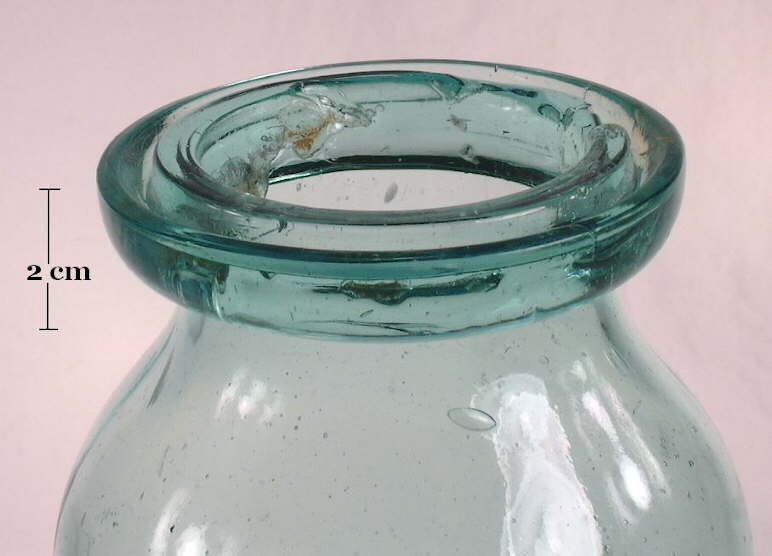 Also see the round round bottom base discussion on the Bottle Bases page. Sabot - A type of tool which holds the bottle base for finishing. See snap case. Click snap case to see a discussion of the snap case and sabot on the Bottle Bases page. Sand pontil (aka "sand chip pontil") - A sand pontil is formed by a pontil rod that was first tipped with hot glass and then dipped in sand. The resulting marking is a light and diffuse, generally circular, pebbly scar formed by the sand and/or glass particles imbedded into the base surface. 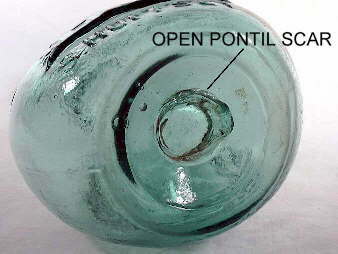 The image to the left shows a sand pontil on an 1830s to 1840s era American-made medicinal bottle with the distortion made by the pontil ball tip (indented slightly) in evidence. This style is also known in some collectors jargon as a sticky ball pontil and is often very hard to identify; a rough base to an otherwise non-pontiled bottle is often mistaken for a sand pontil scar. 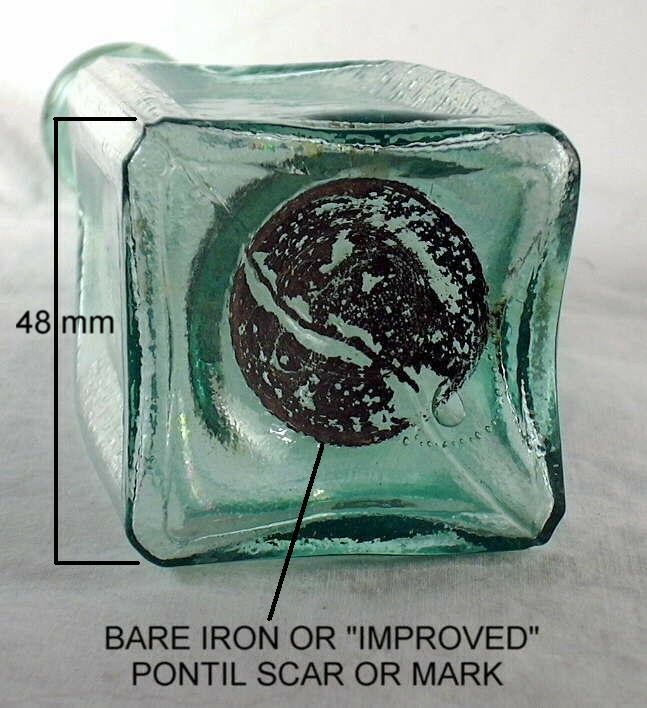 Users should reference the pontil scar or mark portion of the Bottle Bases page for examples of the different types and variations of pontil scars, as well as descriptions of how they were formed. Also see disk pontil which was a variation of the sand pontil (Van den Bossche 2001). Saratoga type bottle - This is a distinctive round, squatty, and short-necked style of bottle that was commonly used for mineral water - particularly those from the Saratoga Springs area of New York (Tucker 1986). Click Congress & Empire Springs to view a picture of a common example of these type of bottles. 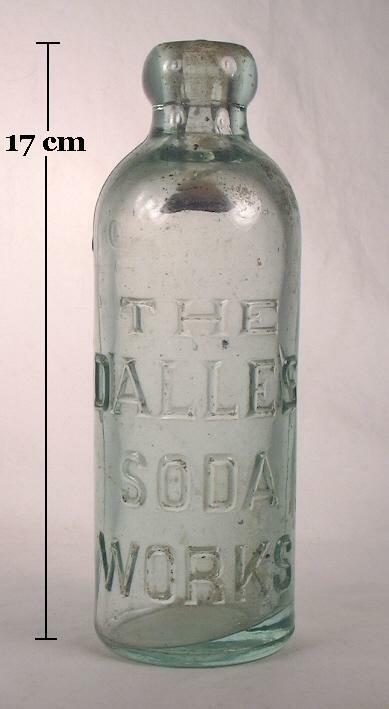 Click Soda & Mineral Water bottles typology page to view this discussion of this bottle style. 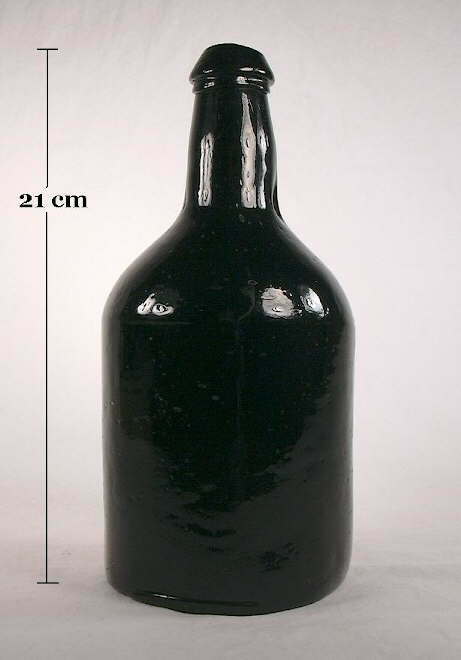 Scant size - This was a glassmaker term for a bottle (usually for liquor) that was nominally referred to as a "pint" or "quart" but actually held less capacity. For example, "pint" mouth-blown shoo-fly flasks typically held 10-11 oz. (Wightman ca. 1900) but were (and continue to be) universally called a pint. 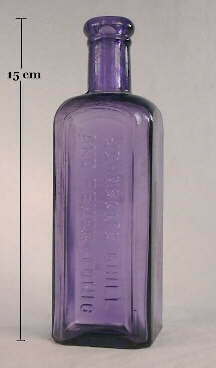 During the period from the 1890s to early 20th century, public pressure (or the sensing of a market niche by glassmakers and bottle users) prompted many glass makers to produce lines of "full measure" type bottles which presumably held the full measure, which was often boldly embossed on the bottle as proof of its reliability. Inside screw threads on a ca. 1905-1910 Portland, Oregon whiskey flask. Hard rubber stopper or cap in place. Screw threads (outside or external) - (aka - screw-top) A finish where the screw threads for holding the closure are on the outside of the finish. There were various styles of threading including continuous and non-continuous. Continuous screw threads (also called helix or coil) are a continuous spiral projecting glass ridge encircling the finish of a bottle intended to mesh with the thread of a screw-type closure (White 1978). Continuous threads are pictured above on this page, i.e., the ground rim/lip Mason fruit jar photo. Non-continuous screw threads (also called interrupted or "lug" threads) are threads on a finish that are intermittent (gapped) and designed to typically receive a cap with lugs. Click external screw thread finish to view the discussion of small and wide screw thread finishes on the Bottle Finish Types & Styles page. Sealing surface - At its simplest, this is the surface where the closure and finish mesh to seal the contents inside. The extreme top portion of the finish (rim) is sometimes referred to as the sealing surface though that is dependent on the type finish as to whether it actually accomplished this task. 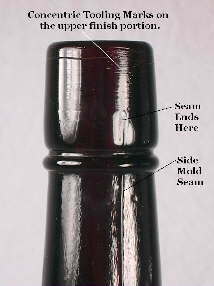 For example, the sealing surface on a cork finish bottle is primarily the inside of the bore or throat. The term is most pertinent to finishes like many externally threaded finish/closure combinations for which the rim is the sealing surface on which the screw cap closes and seals against (like the modern jar pictured at this link). 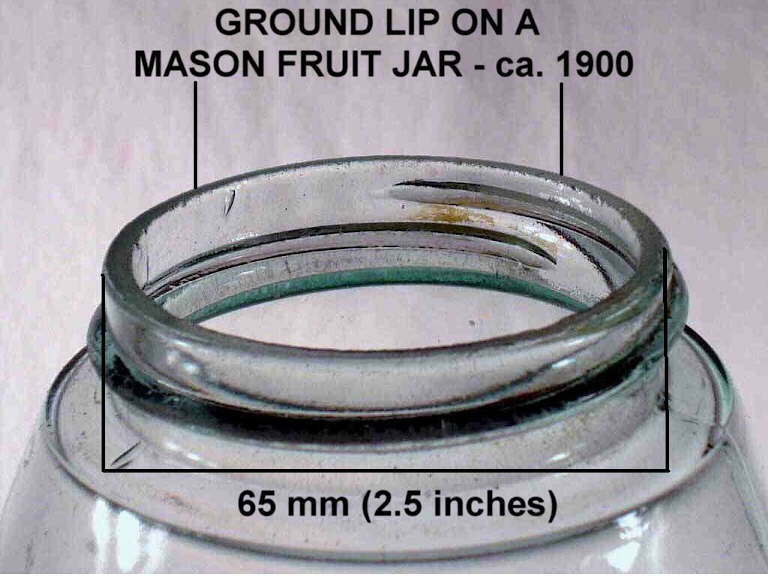 One major exception to this is the Mason patent fruit jar on which the sealing surface was actually the edge of the shoulder just below the threads - not the rim. This is known as the "Mason shoulder seal" (Creswick 1987). Click here for Mason screw thread picture. Also called the "point of seal" (White 1978). See the General Bottle Morphology page. Seam - See Mold Seam. Also see the General Bottle Morphology page. Seeds - Small bubbles in the glass. See definition for bubbles above (also includes an image). Seltzer bottle - See siphon bottle below. Semi-automatic bottle machines - Transition machines between full handmade (mouth-blown) production and the fully automated machines. The semi-automatic machines still required human labor to feed the glass to the machine and run the machine through its processes to produce a bottle, but where otherwise automated. The 1908 image to the left shows a semi-automatic, press-and-blow, milk bottle machine. Bottles produced by semi-auto's are thought largely indistinguishable from fully automated machines, i.e., they have all the diagnostic characteristics of a machine-made bottle with the exception of a lack of the Owens Automatic Bottle Machine distinct suction scar on the base. To quote Miller & McNichol (2002), "Because the adding of a feeding device to semi-automatic machines did not change the way bottles were formed it is impossible to tell which bottles were made by the semi versus a fully automated machine." The development of a glass (gob) feeder for semi-auto machines transformed many into fully automatic "flow" machines which were simpler and cheaper than the Owens Automatic Bottle Machine (Pearson 1928). See the Glassmaking & Glassmakers page for more information. Servitor - Assistant to the master glassblower or gaffer. This person (often a boy) opened & closed molds, attached and held the pontil rod or snap case, and a host of other tasks to assist and speed up the production of the gaffer. Sheared and fire polished finish on early American "sunburst" flask. Shell cork - A cork with a hollow center into which the shank of a glass or metal stopper was inserted. This combination together when placed in the bore of a bottle, created a seal. Click club sauce stopper to see a picture of a bottle finish with a stopper and shell cork in place. This is discussed further on the Bottle Closure Types page. Shop (aka "hand shop") - Shop was the commonly used name for a crew that worked together producing mouth-blown bottles in the glass factory (Scholes 1952). 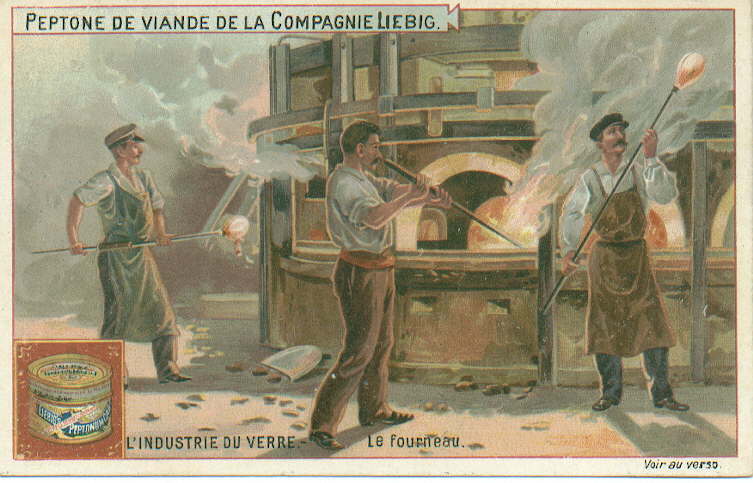 Most factories had several shops working at once from a glass furnace. The shop group varied widely depending on the items being made, union rules, company procedures, and the like, but usually included the gaffer, gatherer, "mold boy" (who opened and closed the mold for the gaffer), "snapping-up boy" (who operated the snap case tool), and "taking out boy" (who took the bottle to the annealing ovens or lehr). The servitor often did several of these tasks. 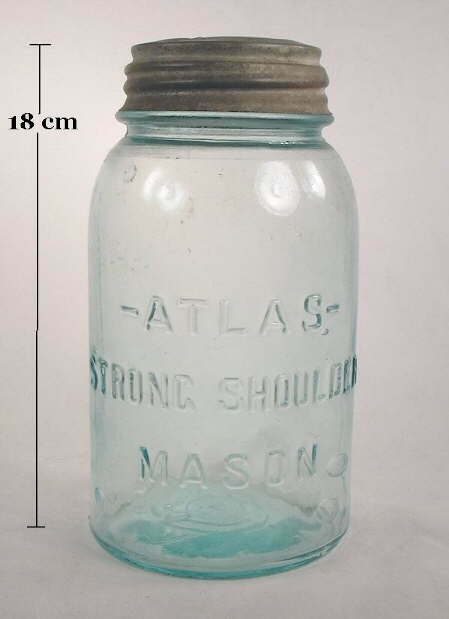 Shop furniture - Large, typically stoppered, jars and bottles that were used for containing and displaying bulk items in drugstores during the 19th and early 20th centuries. (Three examples are pictured to the left.) Often these items have glassed over labels, i.e., labels on the bottles that are covered with a thin layer of glass. Click IGCo. 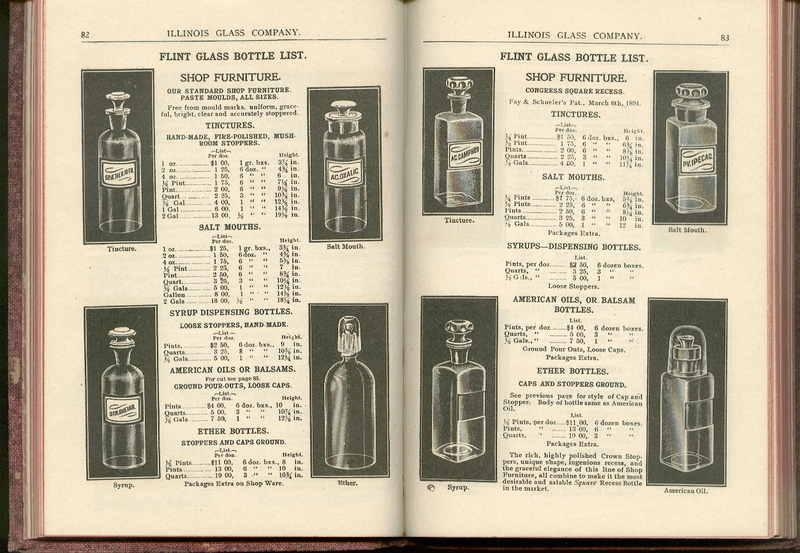 1906 catalog pages 82-83 to see some examples of shop furniture from an Illinois Glass Company 1906 bottle catalog. Also called druggist "shelf ware" (Alter 1909). These type bottles are discussed at this link: shop furniture discussion on the Medicine Bottle typology page. Shoulder - The portion of the bottle which lies between the point of change in vertical tangency of the body and the base of the neck. Similar to the heel of a bottle, the shoulder is a transition zone between two other major portions of a bottle. 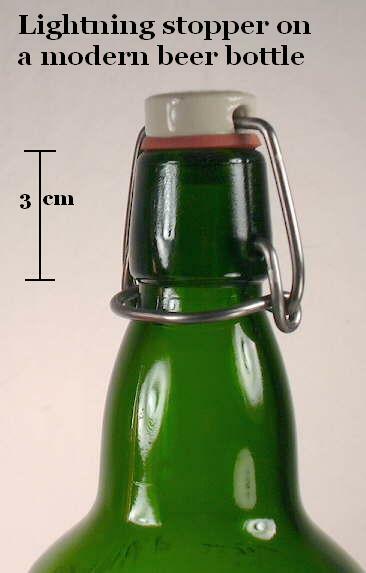 See the General Bottle Morphology page for an illustration. Shoulder seal - See blob seal. Sick glass - See patination. Siphon bottle - A heavy glass, refillable bottle that dispensed carbonated soda or mineral waters in small quantities but were sealed which allowed the remaining liquid to remain fresh and carbonated. An example of a siphon bottle from the 1920s is shown to the right. Also see the siphon discussion on the Soda & Mineral Water bottles page. Slug Plate - More properly called a plate mold and the slug plate itself called simply a "plate" (Jones & Sullivan 1989). Click on slug plate to view a picture of a early 20th century "slug plate." Also see the General Bottle Morphology pop-up page. Smooth base - A collector originated term for a bottle base without a pontil scar of any type, though the base may have embossing, designs, or mold seams making it not perfectly "smooth." 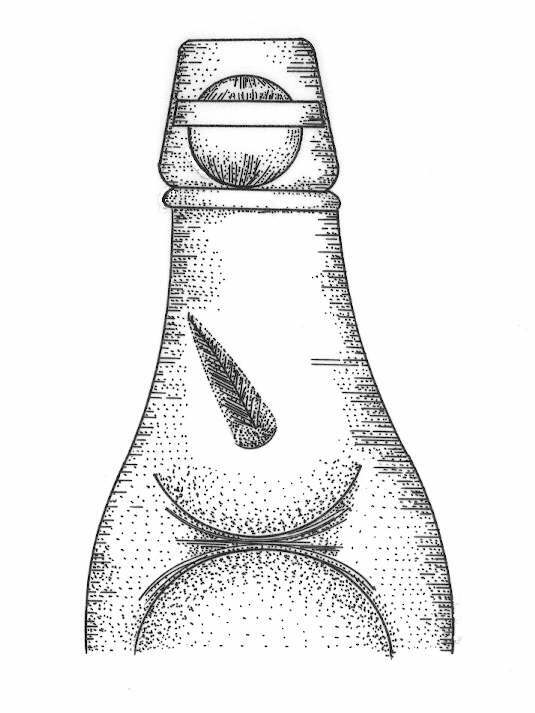 Smooth base has also been widely adopted by archaeologists since it is a simple way to note that a bottle is not pontil scarred in any way (Farnsworth & Walthall 2011). Snap case - Also called a "clamp," "snap", "spring punte", sabot, "snap dragon", and likely other terms (Trowbridge 1870; U. S. Patent Office 1884a; Jones 1986). 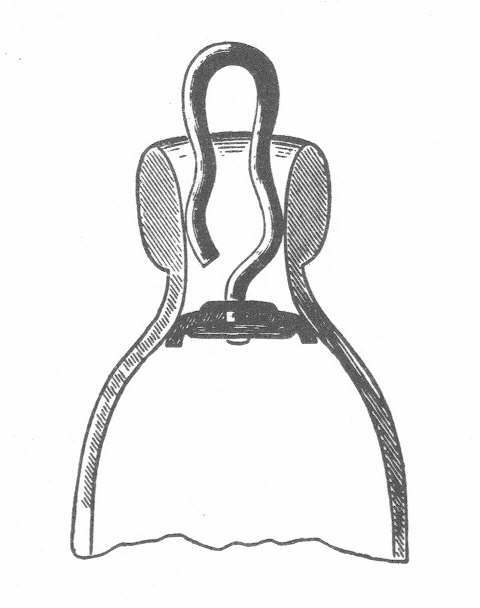 A snap case was a tool of variable design which held the post-mold hot bottle by the base and/or body while the finish was being completed (i.e., the bottle "finished"). The snap case replaced the various type pontil rods and was one of the most significant inventions to make bottle making more efficient during the mid-19th century. 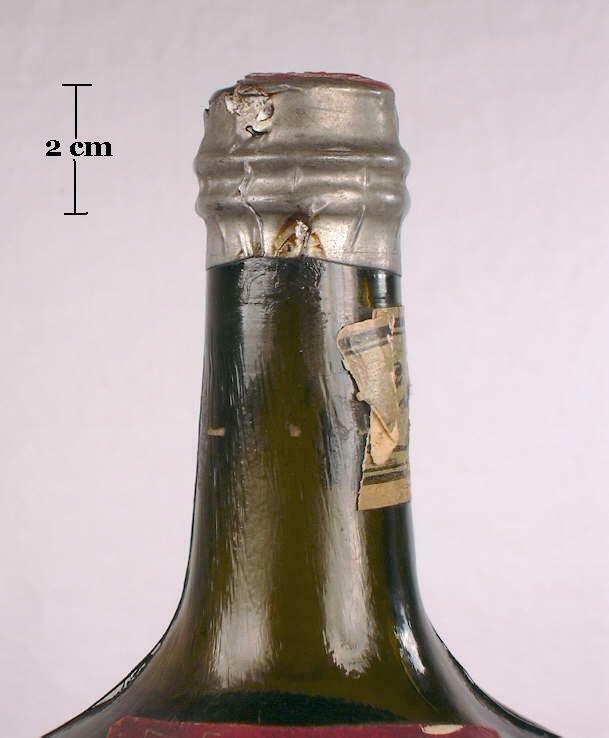 Unlike the pontil rod, the snap case left little if any marks on the bottle, though sometimes shallow indentations can be noted on the sides of a bottle held with a snap case (White 1978). 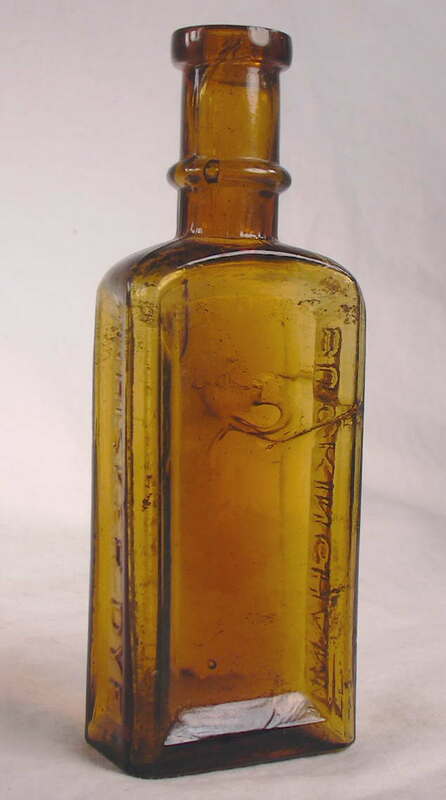 The term snap case is also used by collectors in reference to early post-pontil scar bottles produced in a true two-piece mold (mold seam bisects the base), i.e., "snap case bottle". Click snap case to see a discussion of the snap case and sabot on the Bottle Bases page. Soda-lime glass - The most common type of glass for bottles typically comprised of silica (60-75%), soda (12-18%), and lime (5-12%). Soda-lime glasses are relatively light and remain plastic and workable over a relatively wide range of temperatures making the glass easier to manipulate (Whitehouse 1993). Solarized glass - See sun coloring below. "Specialty" bottles - This term is used on this website to describe bottles that were made for either highly specialized purposes, for primarily artistic reasons, and/or were designed to be used, refilled and retained indefinitely by the owner. Also called "quality wares" by some (Fike 1998). Examples of "specialty" bottles include, but is not limited to: barber bottles (many of which are art glass in a bottle shape; see picture to the left), fancier upscale perfume & cologne bottles, decorative snuff bottles, inkwells, fire grenades, large display or promotional versions of regular sized bottles, demijohns and carboys or other large storage bottles, druggist shop furniture or "shelf ware," bottle-like laboratory glass hollowware, fancy or figural wine and liquor bottles, liquor decanters and related bar bottles, and reproductions of earlier bottles. These types of bottles are not considered utilitarian bottles/jars on this website. "Specialty" bottles are an impossible group of bottles to simply/precisely define and there are many exceptions within the classes and to the admittedly somewhat vague definitions noted above. For example, figured flasks are not considered to be "specialty" items on this website even though they were designed to be "refilled and retained indefinitely," as they follow quite well the dating guidelines found within this website. Canning jars also fall into a similar category as figured flasks though there are some group differences in manufacturing features that diverges from the general dating guidelines; see the Canning Jars section of the "Food bottles & Canning jars" typing sub-page for more information. 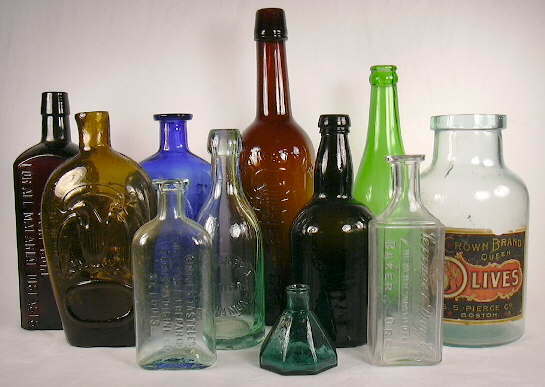 It is important to make a distinction between specialty bottles and utilitarian bottles since many specialty bottles were frequently made using glassmaking techniques from earlier times or glassmaking techniques not used on utilitarian wares and can not always be accurately dated using the dating tools on this website. For instance, many specialty bottles made during the late 19th and early 20th centuries - like the early 20th century barber bottle to the right above - were produced using a pontil rod and retain pontil scars well outside of the primary "pontil era." Another example is bottles for expensive, low production liquors (e.g., cognac) and perfume which are still being hand-blown today. 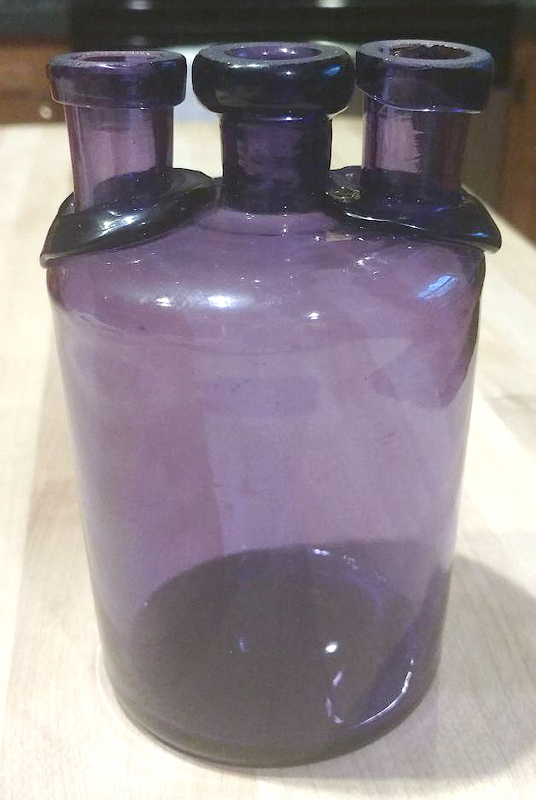 Yet another category is bottle-like wares made for laboratory use, like the early 20th century three-necked bottle at this link (photo courtesy of Joshua Keller). Many "specialty" bottles were imported from Europe, though that origin may be hard to ascertain. Also see utilitarian bottles/jars. Stain - See patination above. Sticky ball pontil - Collector jargon for a pontil scar which is more accurately termed a sand pontil; see that definition above. Apparently derived from the fact that if one runs their finger over a sand pontil scar, the sand grains will catch your finger a bit. The term originated, to the authors knowledge, with Bill & Betty Wilson's (1969) excellent book - "Western Bitters." Stippling - To quote Merriam-Webster Online dictionary, stippling is "to engrave by means of dots or flicks." Stippling on a bottle is indeed variably light, embossed dots, bumps, indentations, or other designs commonly observed on the base of bottles made from about 1940 to date (Lockhart 2004d). 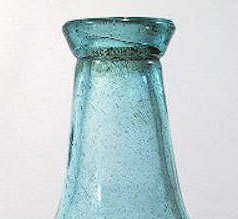 See the image to the left which shows stippling on the base of a 1959 soda bottle. Click 1941 beer bottle base to see an example of base stippling on an Owens-Illinois Glass Co. produced beer bottle that has obvious stippling around the outside perimeter of the base. The reasons for stippling were (and still are) both decorative and practical. Although sometimes used for purely decorative purposes, the primary practical use of stippling (also called "knurling" depending on how formed) was so that the bottles would have a reduced base surface contact decreasing drag on the conveyor belts moving them within the factory and possibly by purchasers/users (Phil Perry, engineer with the Owens-Illinois Glass Co., pers. comm. 2010). Another practical reason for the stippling on the base was provided by Steve Presley, Brewmaster Anheuser-Busch, Inc. (retired) and currently brewing program instructor at the UC Davis, as follows: "Stippling is also applied to minimize the amount of contact between the very hot bottle bottom as it comes from the forming machine and transitions onto the annealing lehr conveyor. Without the stippling the thermal shock that would occur with full base contact on the conveyor would create stresses that can cause the bottle to burst, or reduce its overall tensile strength." (Pers. comm. 12/2016). For more information see Question #17 on the Machine-made Bottle Dating page. Stones - A glassmaker term for un-melted sand or silica grains imbedded in the glass which are called potstones by collectors and "knots" by glassmakers in the 20th century (Scholes 1941). A large stone is visible in the shoulder of the bottle to the right. Also called (somewhat awkwardly) a "non-glassy inclusion" by some archaeologists (Jones & Sullivan 1989). See potstones above. Stopper - Generally speaking, this is any closure which fits inside the neck of a bottle to make a seal rather than on top (like a crown cap) or around the outside (like a screw cap) (White 1978). Most often this term is used in reference to non-cork type closures made of glass, porcelain, ceramic, metal, or hard rubber, though a cork could also be considered a type of stopper. Click inside thread stopper & finish to view a picture of a hard rubber stopper on a bottle with internal screw threads. Suction scar on the base of a machine-made beverage bottle from the Owens Bottle Company (1911-1929). Straw marks or lines - Fine, seemingly etched, often swirling lines in the surface of a bottle which may be related in part to patination. Click on this link - Bottle Body Characteristics & Mold Seams - to read a more comprehensive discussion on straw marks or lines. String Rim - A term used by Jones & Sullivan (1985) as follows - "The string rim is the ledge or ring that protrudes from the neck just under the lip. In hand manufacture it is generally formed from added glass but it may also be formed in the mould." It is more or less the same as the term collar used on this website as the lowest portion of a multi-part finish. Suction scar or mark - The suction scar is the diagnostically distinctive mark on the base of a bottle produced by the Owens Automatic Bottle Machine. The mark was caused by the mechanical blade or knife which cut off the glass being drawn upwards into the parison or blank mold via a suction process; this blade also formed the base of the parison mold. Also called a cut-off scar. The Owens suction scar is off center and will very frequently slop over from the base onto the heel and lower sides of non-round bottles - particularly smaller bottles (Miller & McNichol 2002). White (1978) called this a filamented ring. (Picture to the left) A suction scar is pointed out in the image to the left (click to enlarge). Click suction scar for a full discussion of this subject on the Bottle Bases page. Sun coloring - aka "solarized," "sun colored amethyst" or simply "SCA." Glass turned from essentially colorless ("clear") to varying shades of pink or amethyst (or sometimes light straw) coloring by the action of the sun on the manganese oxide or selenium and/or arsenic (respectively) used to decolorize the glass. An extreme example of this effect is shown in the image to the right, which is of a medicinal tonic bottle from Savannah, GA. dating from the early 20th century. 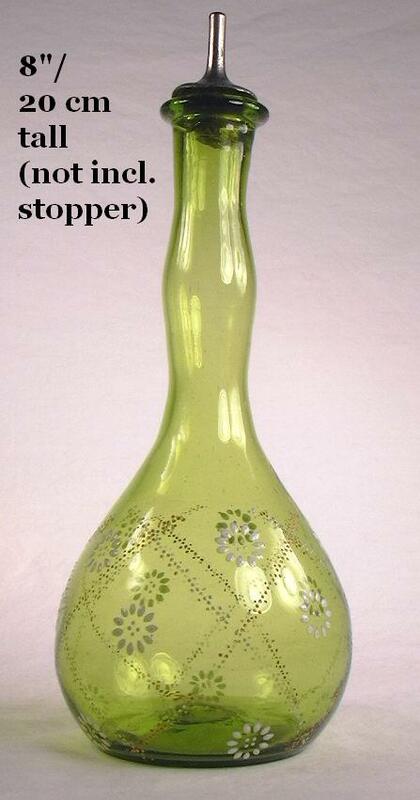 For more information see the colorless glass section of the Bottle/Glass Colors page. Technology lag - In the context of this website, this is the time between the invention of a glass manufacturing process or technique and its widespread implementation to actual production by glass makers. This is probably the most critical factor in the difficulty of accurate historic bottle dating. A classic example was the shift from mouth-blown bottles to those produced by fully automated bottle machines; in particular the revolutionary Owens Automatic Bottle Machine. First patented in 1903, it produced little until licensed for production in 1905. Full automation in the industry moved slowly due to cost with the Owens machine not accounting for the majority of American made bottles until 1917. At that time the Owens machine was producing about 50% of all American bottles, other "feeder" machines producing another 40%, and no more than 10% being hand production (Miller & Sullivan 1981; Miller & McNichol 2002). It wasn't until 1929 that fully automated machines produced essentially all American bottles (Davis 1949). Terminus post quem - Also called simply TPQ. This is a short hand way of referring to the earliest possible time or date that something could have originated. 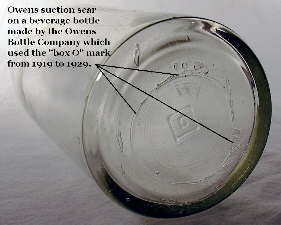 For instance, the first license for the Owens Automatic Bottle Machine were issued in late 1904 making the TPQ 1905 for machine-made bottles exhibiting the distinctive suction scar formed by that machine, although significant Owens machine production did not really occur until 1907 (Miller & McNichol 2002). Torpedo - (aka torpedo base, torpedo soda, Hamilton) A type of bottle - usually used for soda or mineral water - that has a sharply rounded to almost pointed base making it impossible to stand upright. 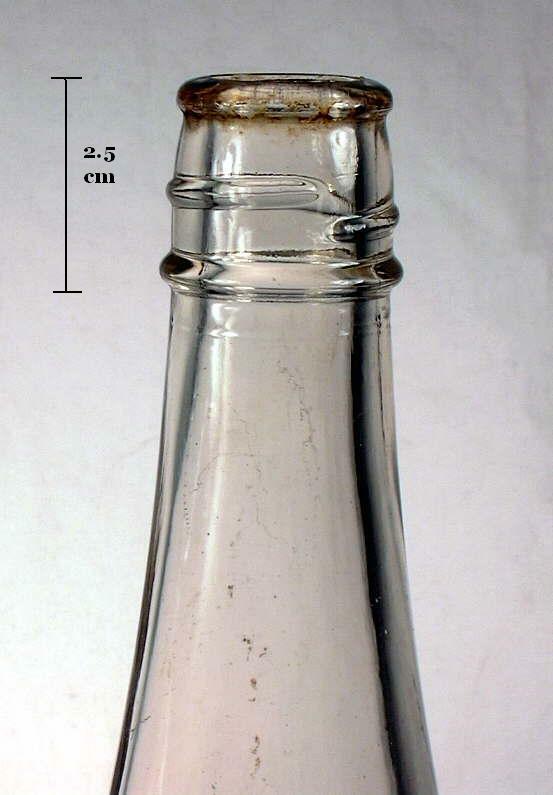 A picture of a typical pointed base torpedo soda bottle is shown to the left; it is embossed with "Walkden Aerated Water Co." (Manchester, England) and dates from approximately 1880-1890. Also see round round bottom base discussion on the Bottle Bases page. Tool - Iron tong-like tool used to manipulate and form the body of a bottle while the gaffer is in the chair. 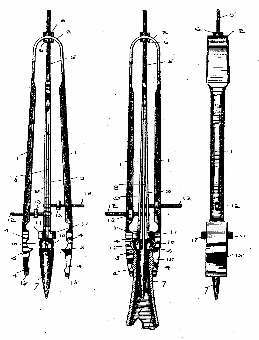 Also called a pucellas, the tools, tongs or the tool (Trowbridge 1870; Boow 1991). Tooled finish (lip) - A method of finishing a mouth-blown bottle where the glass for the finish is blown in the mold along with the rest of the bottle - a process with often pre-forms the general shape and conformation of the finish. Once the hot bottle is removed from the mold, the finish then receives re-firing and tooling to make it more uniform and precise to better accept a closure. Also known as a wiped or improved-tooled finish. The tooled finish is differentiated from the applied finish in that the tooled finish was formed from the re-firing and tooling of glass blown in the mold with the rest of the bottle; the applied finish was formed from glass added to the severed neck end which was then tooled (see applied finish description above). A early 20th century tooled finish is shown to the right. Click on tooled finish to go to a more detailed description of this process on the main Bottle Finishes & Closures page. Tooling - The process of using a tool - usually a lipping tool - to tool the finish on a bottle to the desired shape. Use of such tools often leaves "tooling marks" on the glass at the point of tool contact. TPQ - See Terminus post quem. Trade card - An often colorful promotional card - usually about the size of an index card - given out free by various businesses to advertise either their product or a product they sold. This was a very popular advertising form during the last third of the 19th and first part of the 20th century for various bottled products - particularly patent medicines - though trade cards were produced well after that time too. These could possibly be considered precursors to the modern business card. The reason that so many trade cards survive to this day is that during the last part of 19th century it was a popular pastime to collect trade cards and paste them into scrapbooks. Many trade cards are pictured on this website; an example advertising "malt tonic" from 1880 to 1889 is shown to the left. Tubular pontil scar - see Blowpipe pontil scar. Turn-mold bottle body showing faint concentric rings. "Hock" wine - ca. 1890-1915. Turn-mold (paste mold) - Refers to a mouth-blown bottle produced in a mold where the bottle is rotated in the mold to erase the mold seams and give the bottle a glossy sheen. Also called a paste mold since the interior mold surface had to have a lubricant added to facilitate the rotation. Both the terms "turn-mold" and "paste mold" were used by glassmakers to describe these bottles (Scholes 1952). 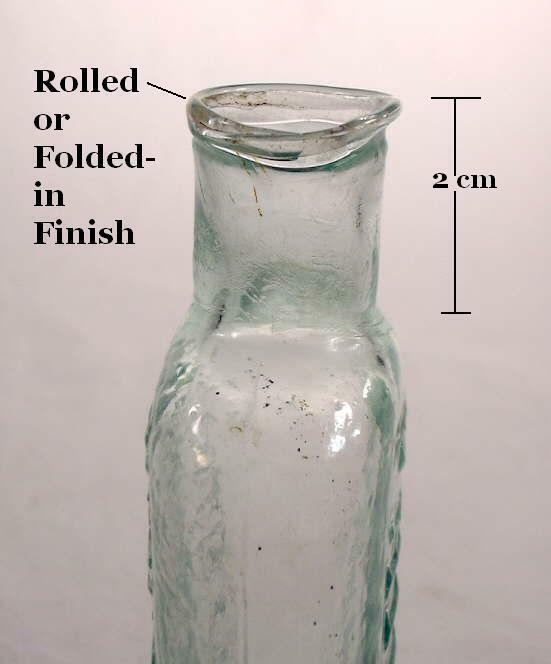 Turn-mold bottles date at least as early as the Civil War through the later mouth-blown bottle era as they were still listed as late as 1911 in glass manufacturing catalogs (Putnam 1965). There are no machine-made turn-mold bottles to our knowledge. Contrary to the implications of the name, the bottle turned in the mold - the mold did not turn around a stationary bottle. This process is discussed in more depth on the Glassmaking & Glassmakers page. Two-piece mold - A bottle mold which has only two halves and no separate base section like the post bottom or post-base and cup bottom or cup-base molds. One-half of the bottle base, body, shoulder, and neck are formed by each mold half. The term is a more accurate way to describe what collectors call hinge mold, key mold, or snap case bottles (see those definitions above for more clarification). The term is often used generically (and imprecisely) to describe any molded bottle, i.e., "blown in a two-piece mold". For an illustration of a side hinged two-piece mold click hinge mold. Typology - According to the Merriam-Webster OnLine dictionary, this is the "study of or analysis or classification based on types or categories." On this website the specifically applies to the use a particular bottle style or type was used for, i.e., what product a particular bottle style was primarily used for. Also called "bottle typing" or just "typing" on this website. The typology pages are a very large portion of this website and begin with the main Bottle Typing (Typology) & Diagnostic Shapes page. Ullage - Ullage is the air space that you see in the neck of of bottle above the contents. If a bottle was filled to the brim, it would always be in danger of leaking or blowing the cap off, when either shaken (carbonated product) or raised in temperature. Also know as vacuity (British Glass 2004). Up-tooled - A term used by Jones & Sullivan (1989) for a "the lower surface of the string rim is tooled upwards and outwards with a flat or rounded top." Those authors used the term primarily in reference to the appearance of the lower portion of a two-part finish. An up-tooled finish on an early (1830-1850) American beer or porter bottle is pictured to the right. Also called a "tapered down" finish (von Mechow 2005); see Finish #37 for more information. Also see down-tooled. Date from an era when bottles were an exceedingly rare and cherished commodity to be discarded only when broken (i.e., the first third of the 19th century and before) and do not otherwise fit the above two categories. Utilitarian bottles include the majority of the bottles in the following bottle categories or types: soda, mineral water, beer, milk, proprietary medicine, druggist (excluding shop furniture), chemical, foods & sauces, household (including ink, shoe polish, cleaners, personal hygiene related items), common wine containers (excluding decanters), champagne, and most non-decanter spirits/liquor bottles. 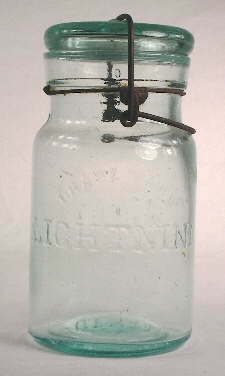 As used here, utilitarian does include canning/fruit jars and figured flasks (example from the 1820s pictured to the left) which, though intended to be reused by the purchasers, have been observed to largely follow the various dating guidelines found on this website. It should be noted that canning jars do exhibit, as a group, some notable differences in manufacturing features which diverge from the general dating guidelines; see the Canning Jars section of the "Food bottles & Canning jars" typing sub-page for more information. Also see specialty bottles. Utility bottle - A term used by both collectors and archaeologists for various types of bottles that were multi-purpose, i.e., certain bottle shapes that are known to have been used for a variety of different products. 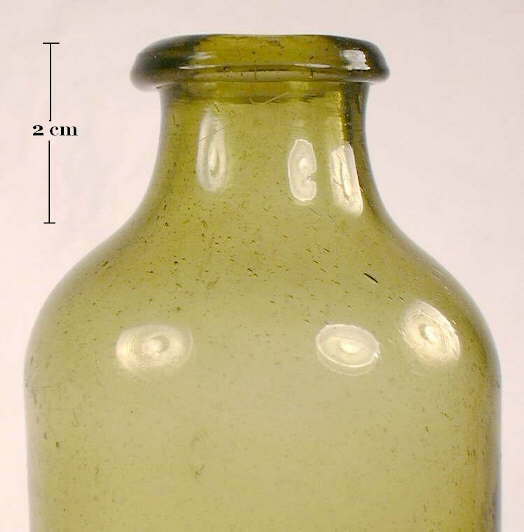 Click on Stoddard utility bottle to view an early American (1830-1850) that could have been used for and assortment of liquid products, e.g., ink, liquor, medicine/pharmaceuticals, and others. Also see packer. A pint milk bottle with a valve mark in the center of the base. 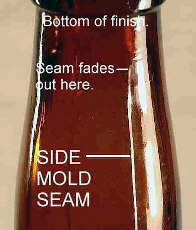 Vertical mold marks - Mold marks which run in the direction of the bottles length (White 1978). See the mold seams section of the Bottle Body Characteristics & Mold Seams page for more information. Wetting off - The process of applying a small amount of water, usually via a wet wooden paddle, to the point on the just blown, hot bottle where the glassmaker wishes to remove it from the blowpipe. Applying water weakens the glass at the point of application and all that is needed to sever the bottle from the blowpipe is a sharp tap on the blowpipe with one of the glassmaker's tools. (Kendrick 1968) Also See cracked-off above. Whittle marks - (Also called "chip marks," "chip mold," "cold mold marks," "whittling") These terms refer to a bottle glass texture which has a wavy, dimpled, or hammered appearance. Called whittle marks, because the bottle surface looks as though it were blown in wooden mold where the mold maker's whittling marks are evident. (Wooden molds were rarely used during the period covered by this website.) The glass texture effect is usually actually caused by the hot, semi-molten glass hitting the cooler mold surface; bottle "goose bumps" in a sense (Ceramic Industry 1949). 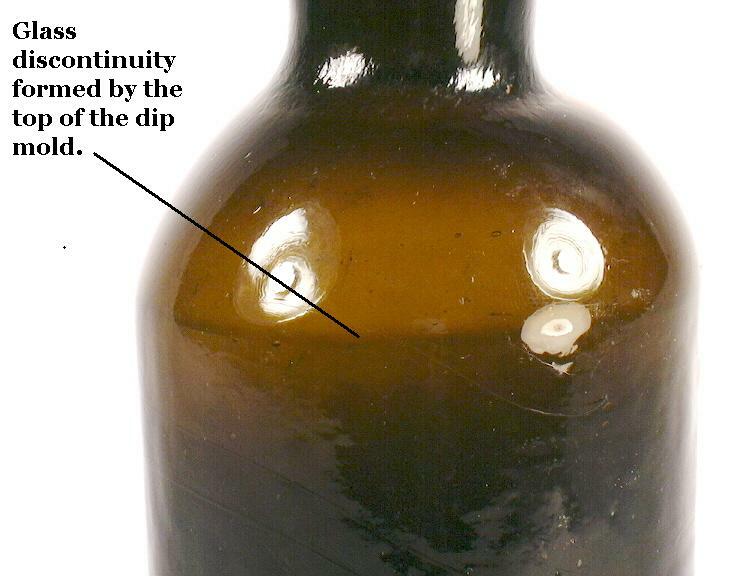 The image to the left shows a close-up view an extreme example of this effect; click whittle marks to see entire image of this large 1850s patent medicine bottle with the extreme whittle marks. Wiped finish - The term wiped finish has been used by some to refer to what is described on this site as a tooled finish. Click on tooled finish to go to a more detailed description of this process on the Bottle Finishes & Closures page. Wired cork stopper - Cork stoppers which are wired in place on the bottle neck. See the cork closure section of the Bottle Finishes & Closures page: Part III: Types of Bottle Closures for more information. 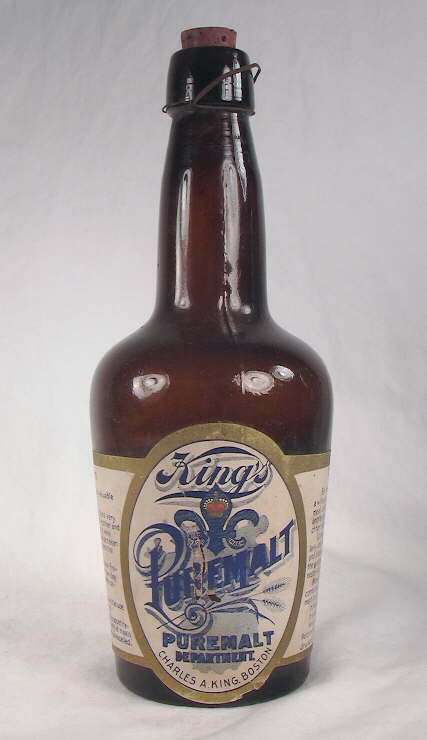 Click on the following link King's Pure Malt to view an early 20th century (1900-1910) "malt (beer) tonic" bottle with a wired cork stopper. Champagne continues to be corked in this manner today (White 1978).